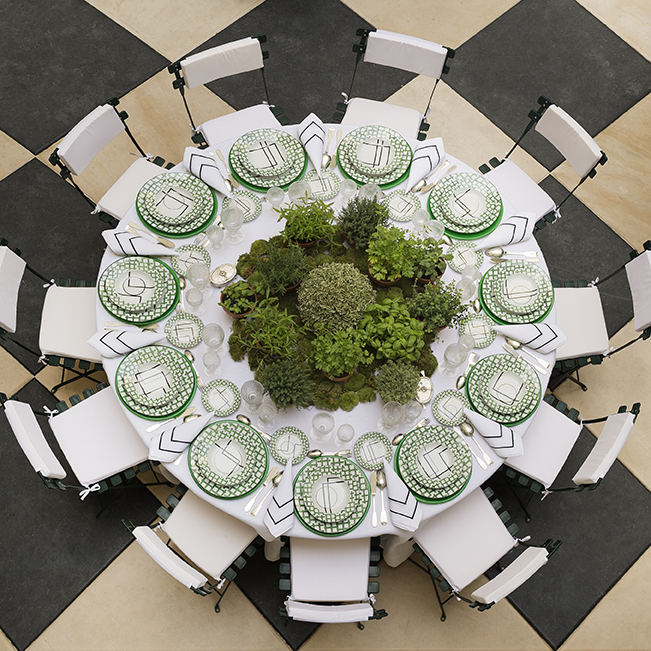 Summer is almost upon us with lunches in the garden and dinners on the terrace. 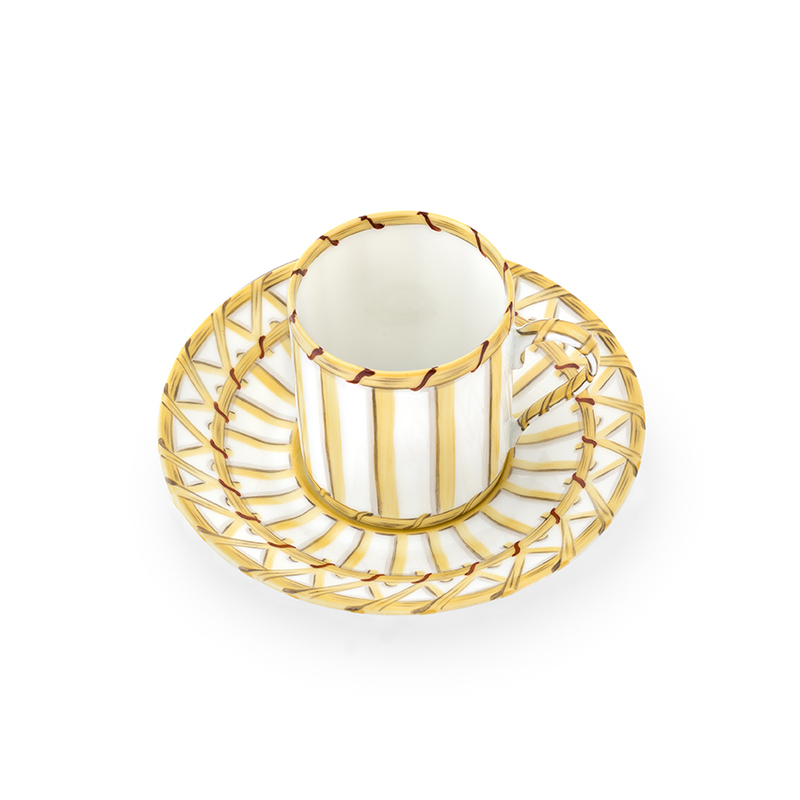 It is the ideal moment for “Vannerie” to reinvent itself in a straw version with a touch of color such as found in the wicker furniture of the winter-windowed-sun-gardens of yesterday. 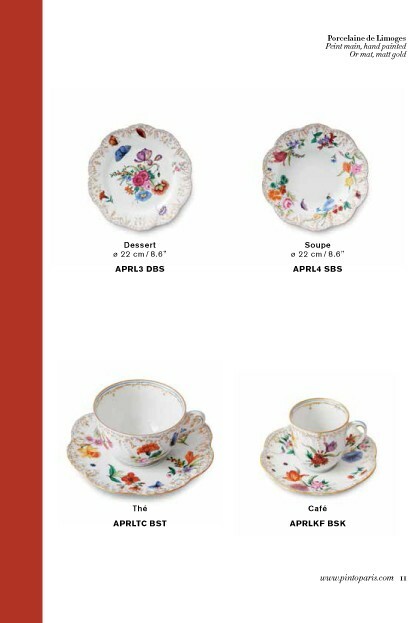 (Exists in buffet plate, dinner plate, dessert plate, soup plate, bread plate, tea cup and saucer, coffee cup and saucer, teapot, sugar bowl and creamer). 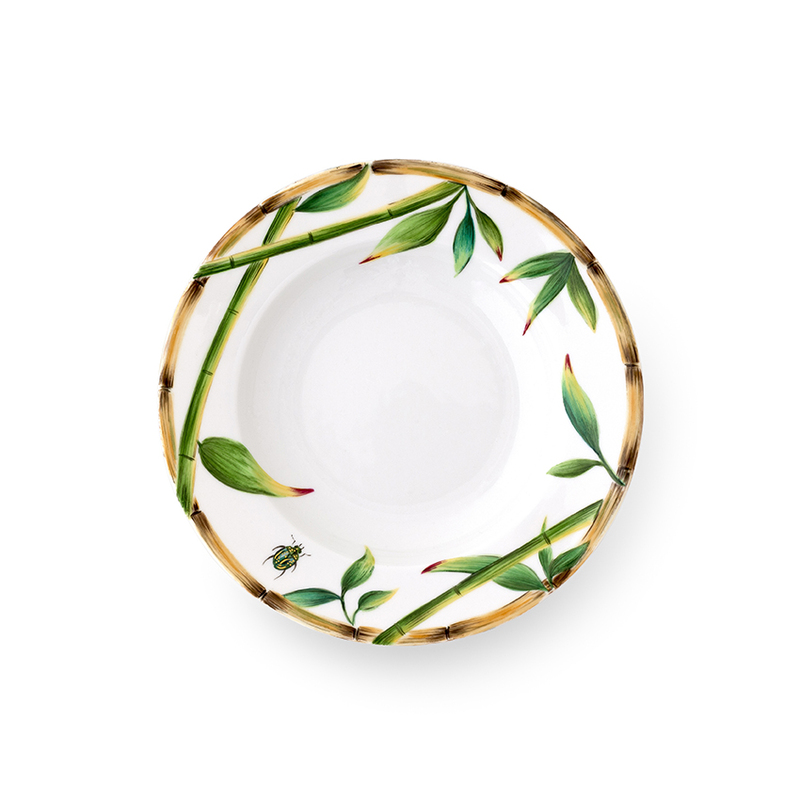 Travel memories, Pinto Paris’ new collection SAGANO evokes the magnificent bamboo forest in Kyoto, Japan. 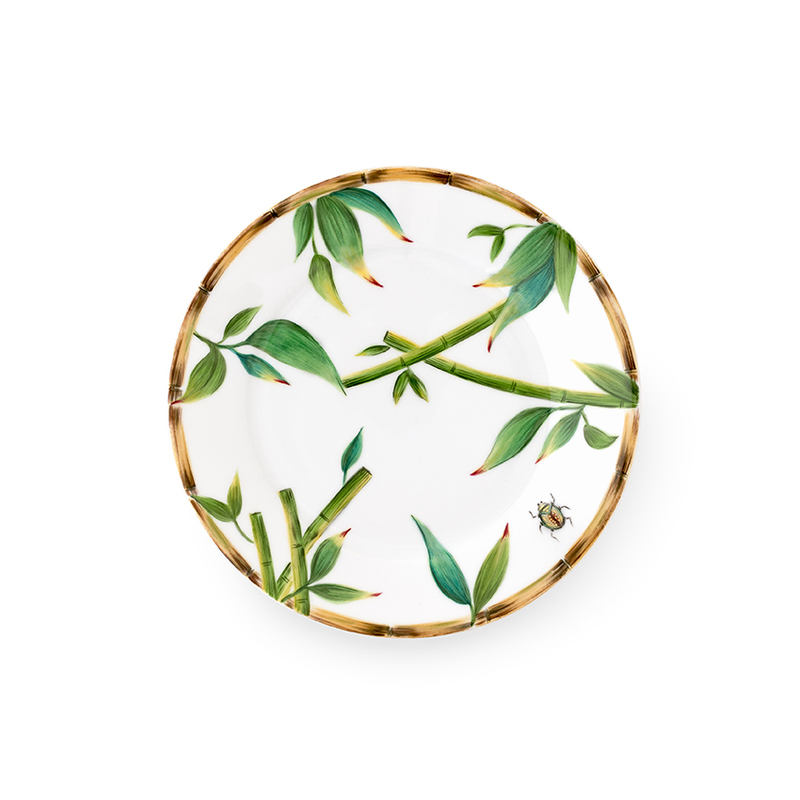 Symbol of the family, as well as of strength and of joy, the bamboo here is associated with a lucky beetle. 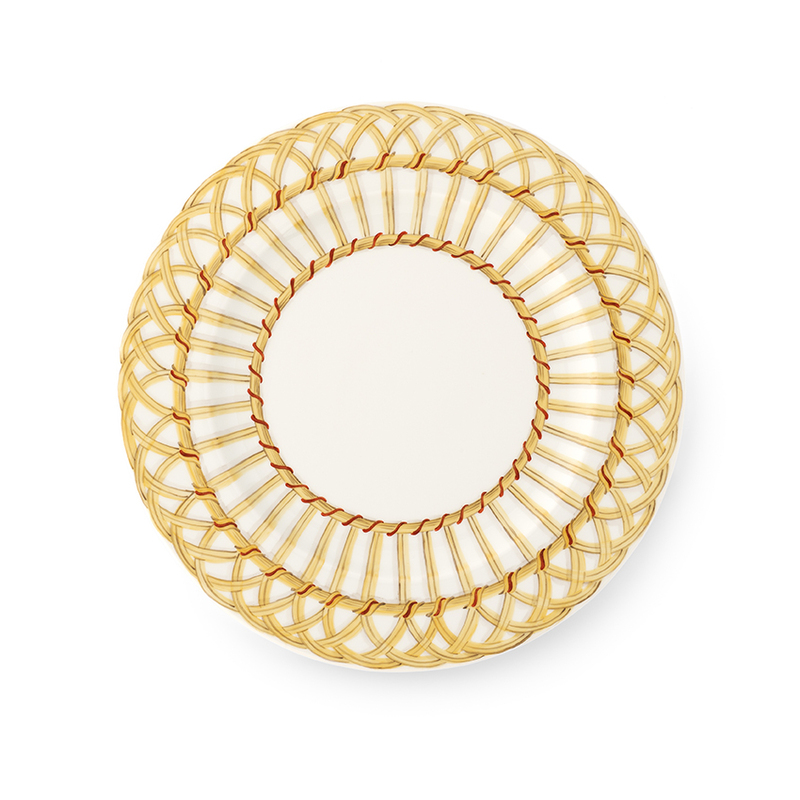 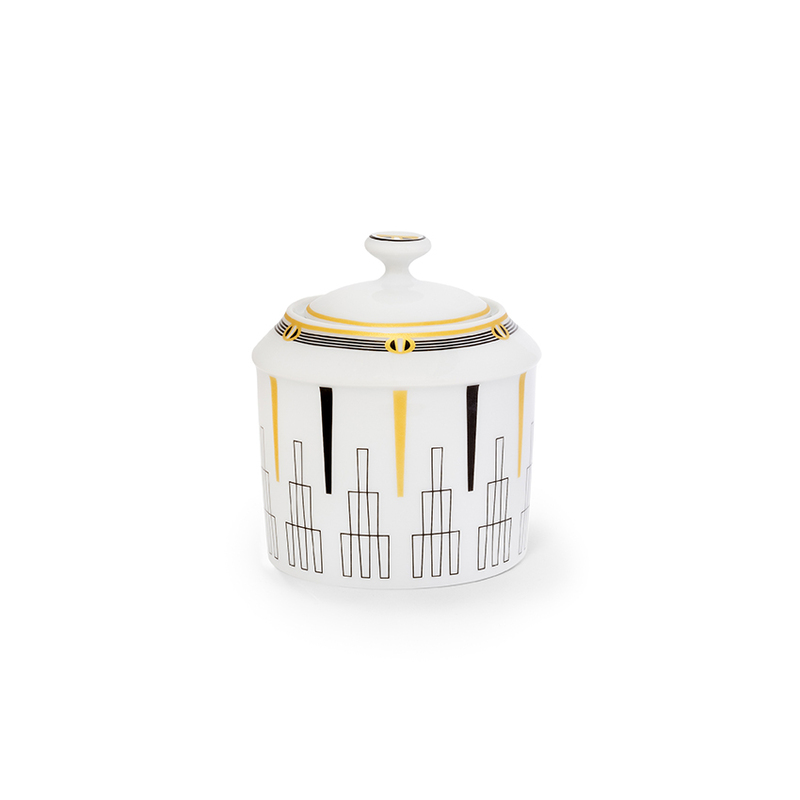 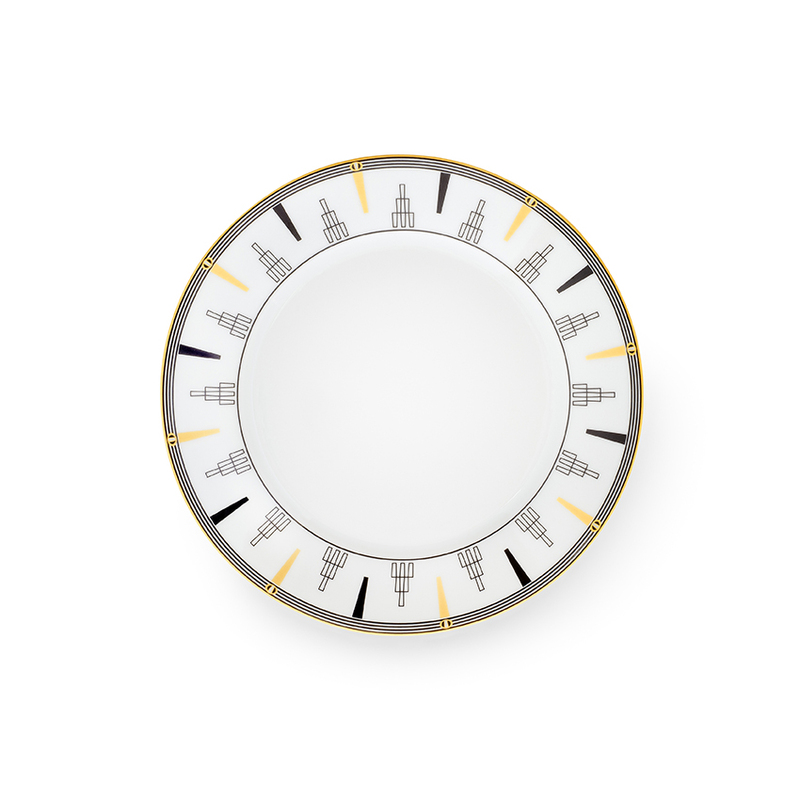 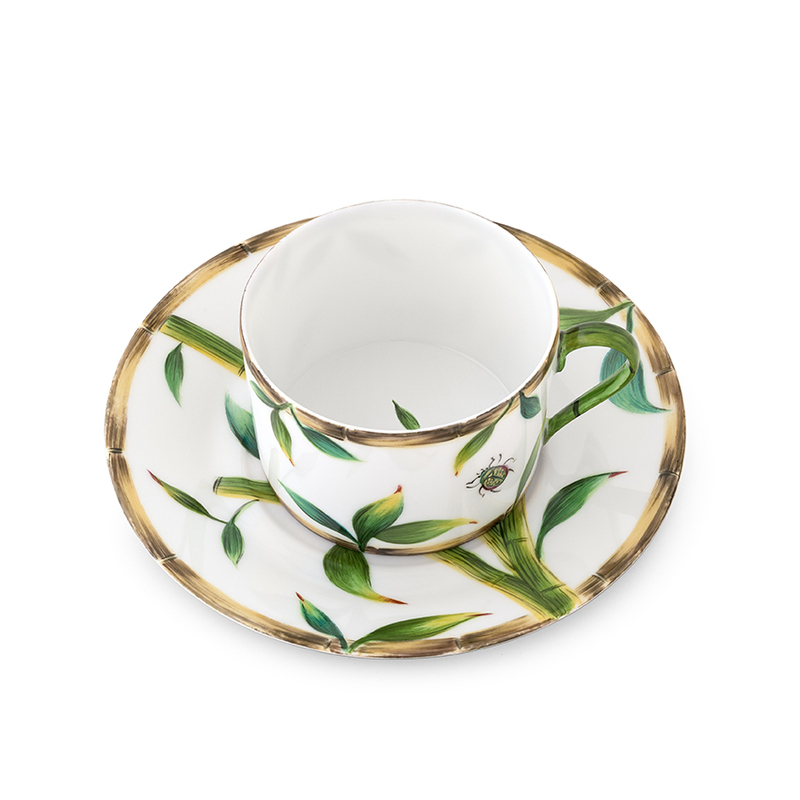 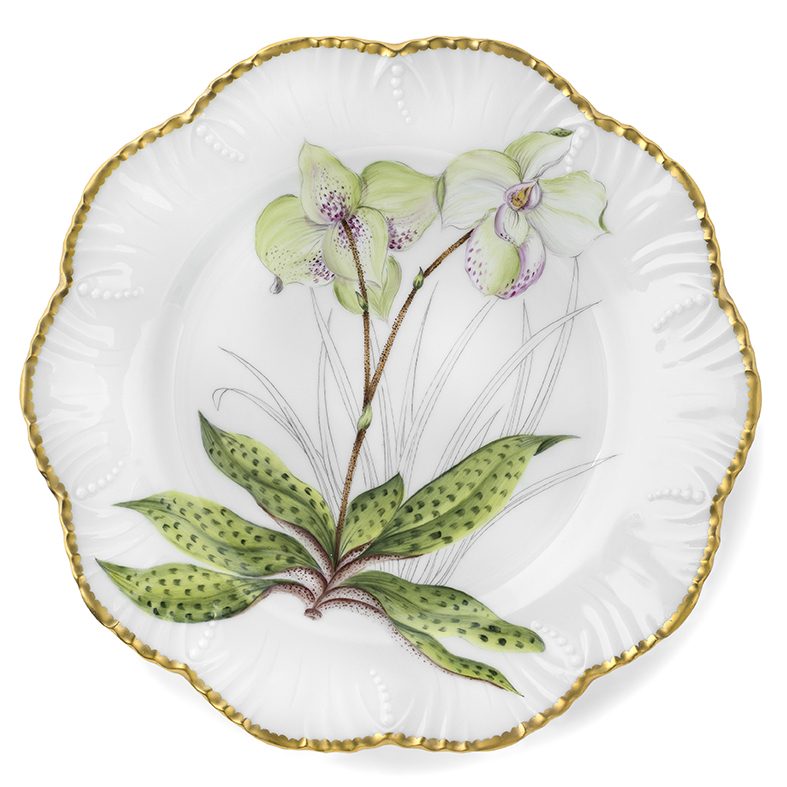 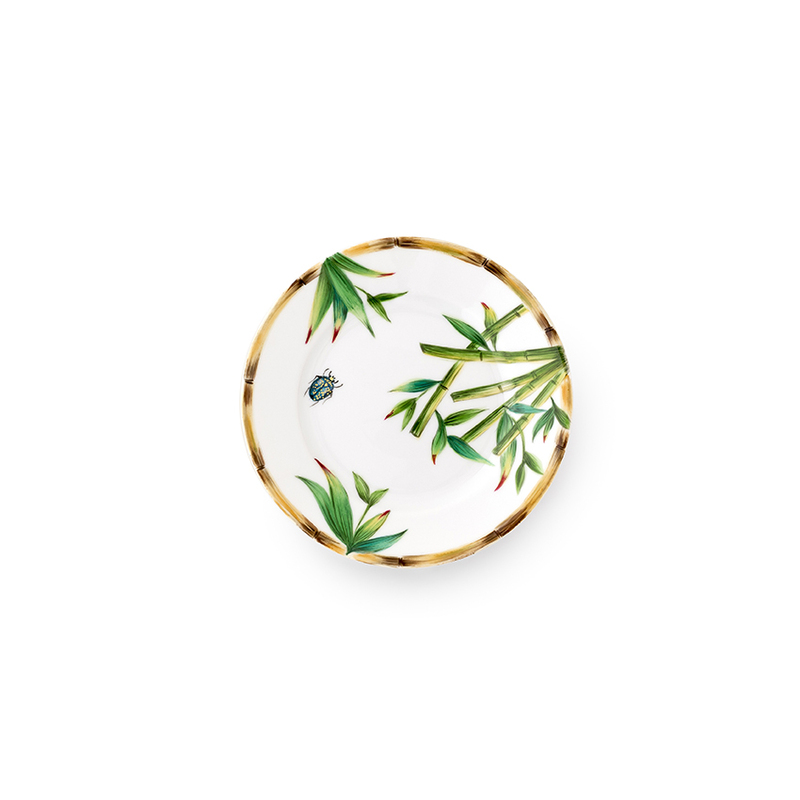 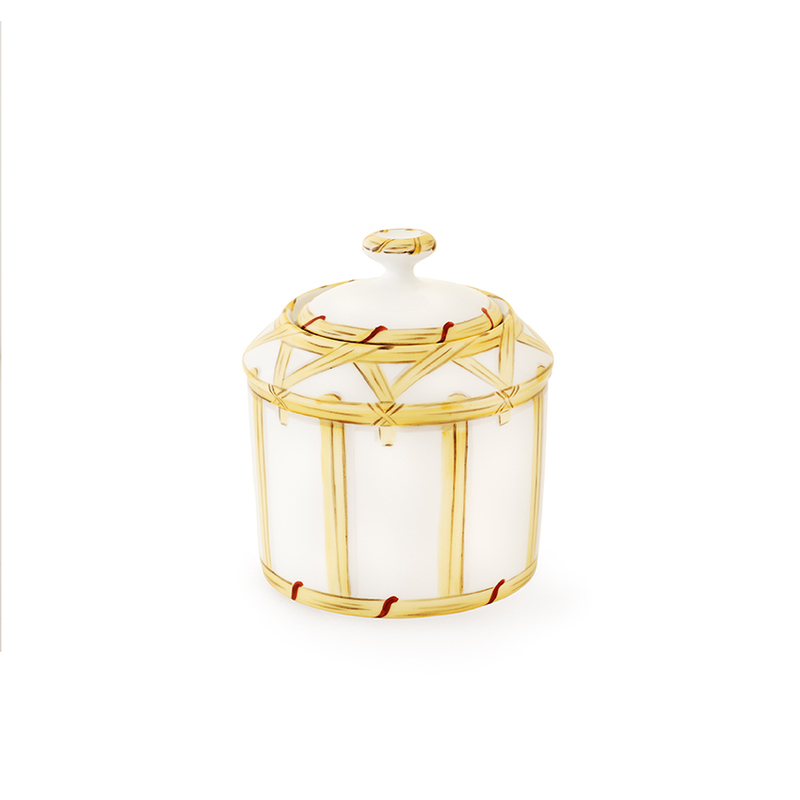 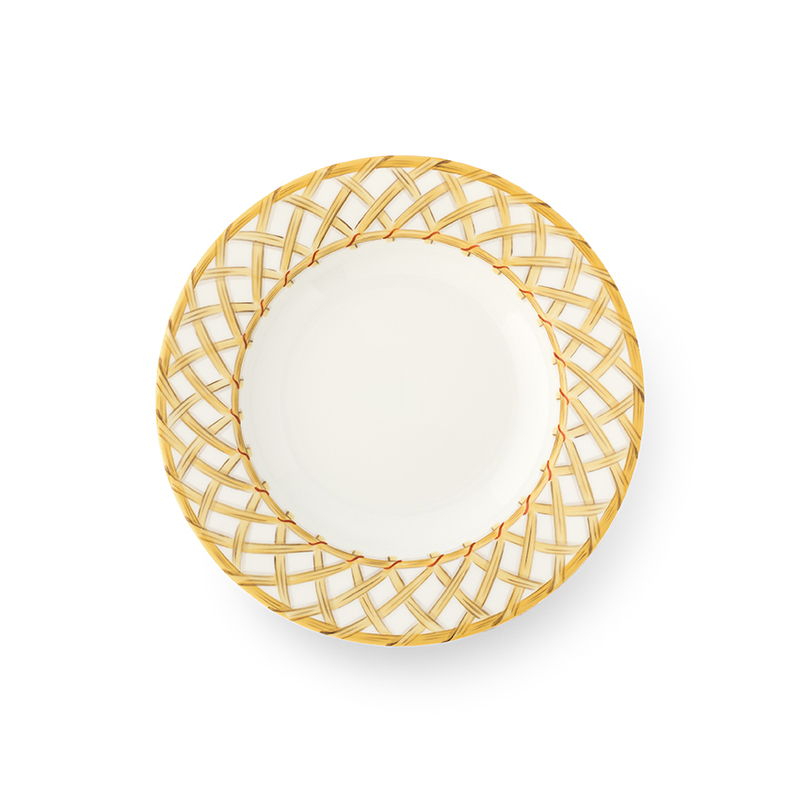 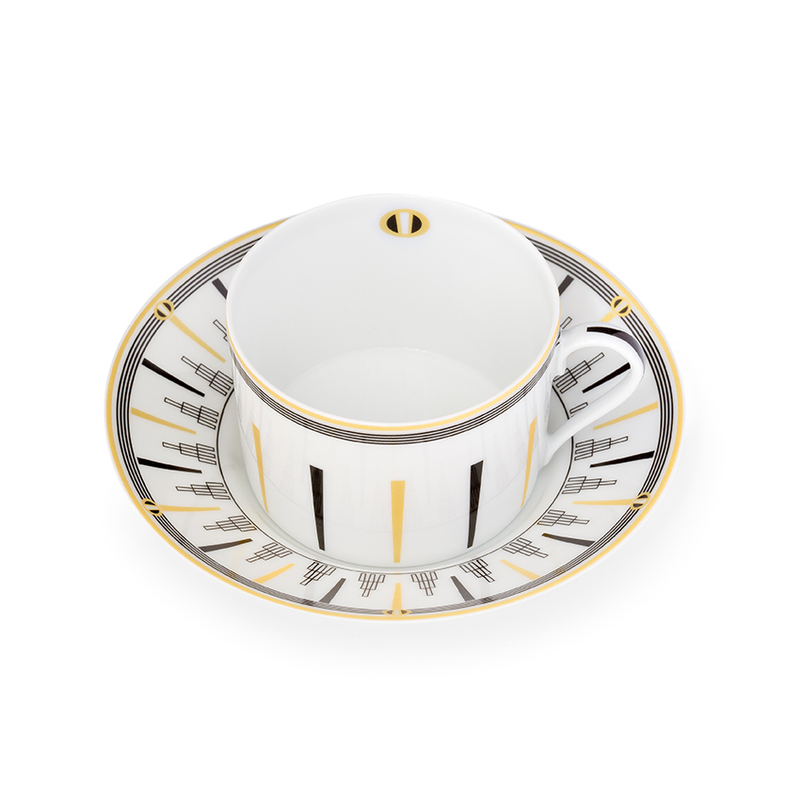 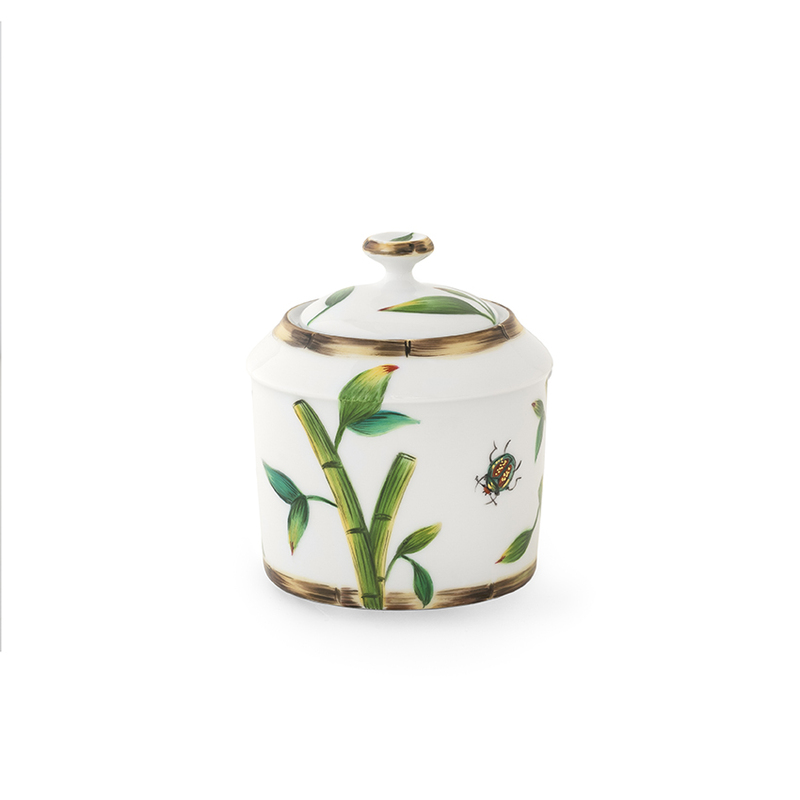 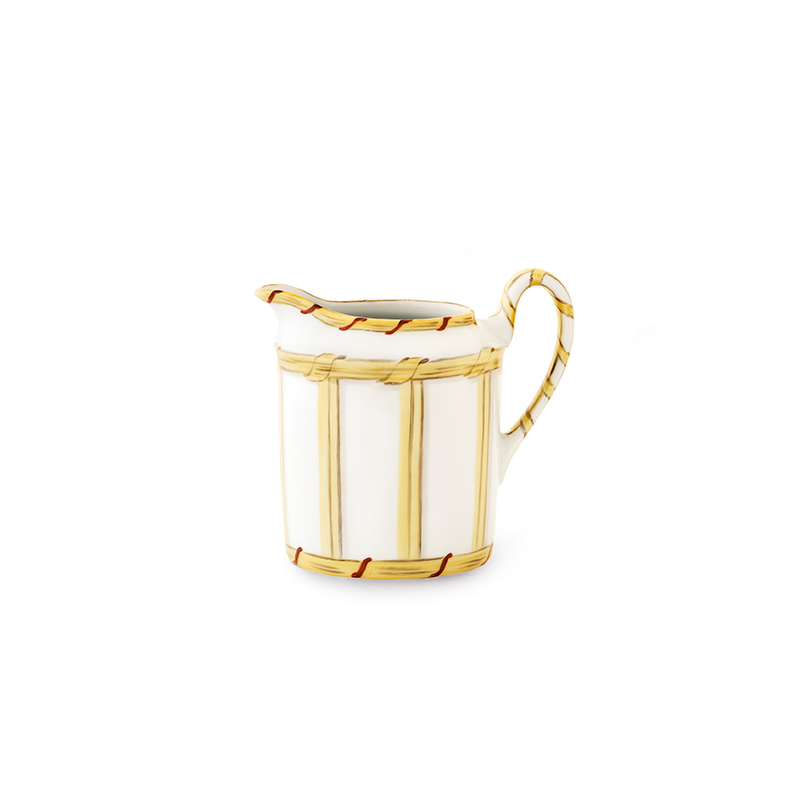 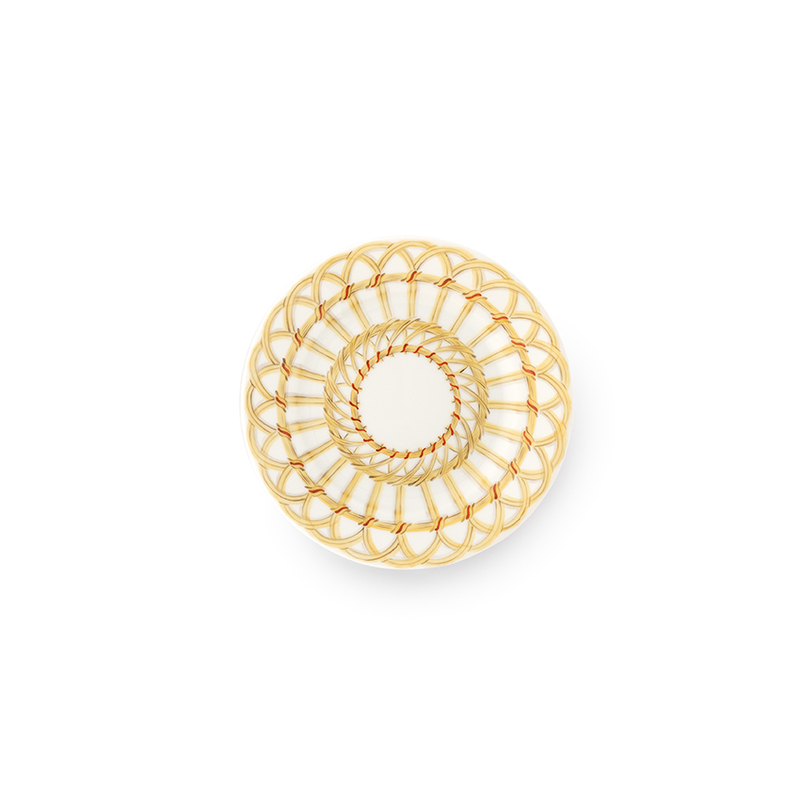 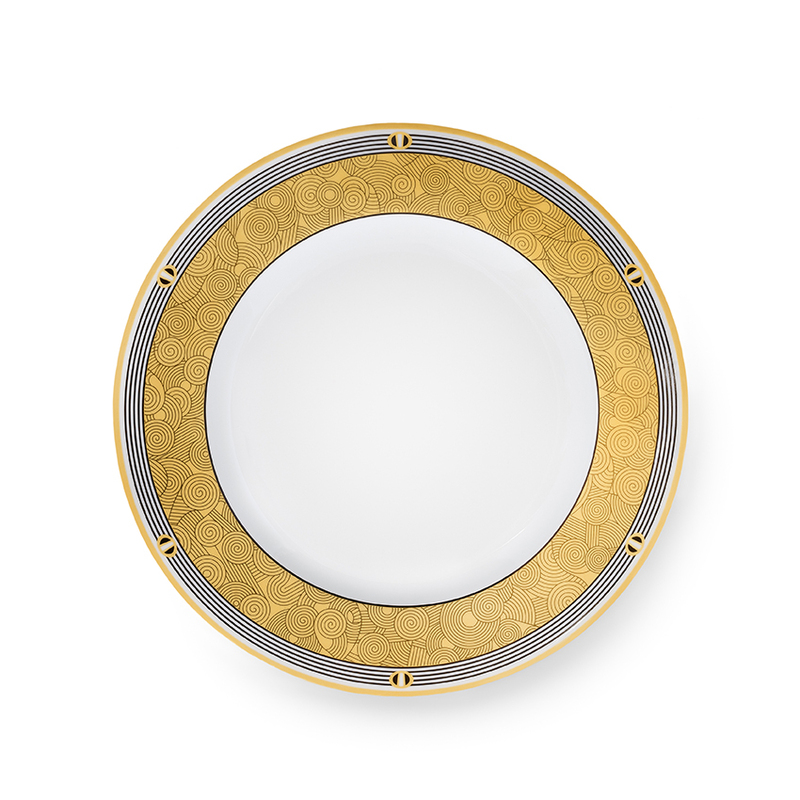 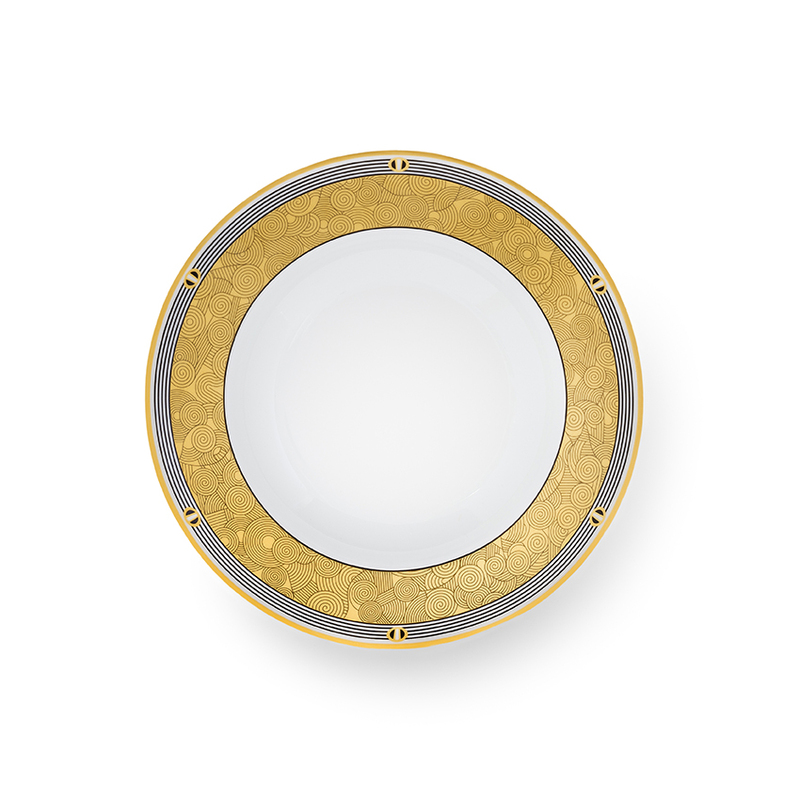 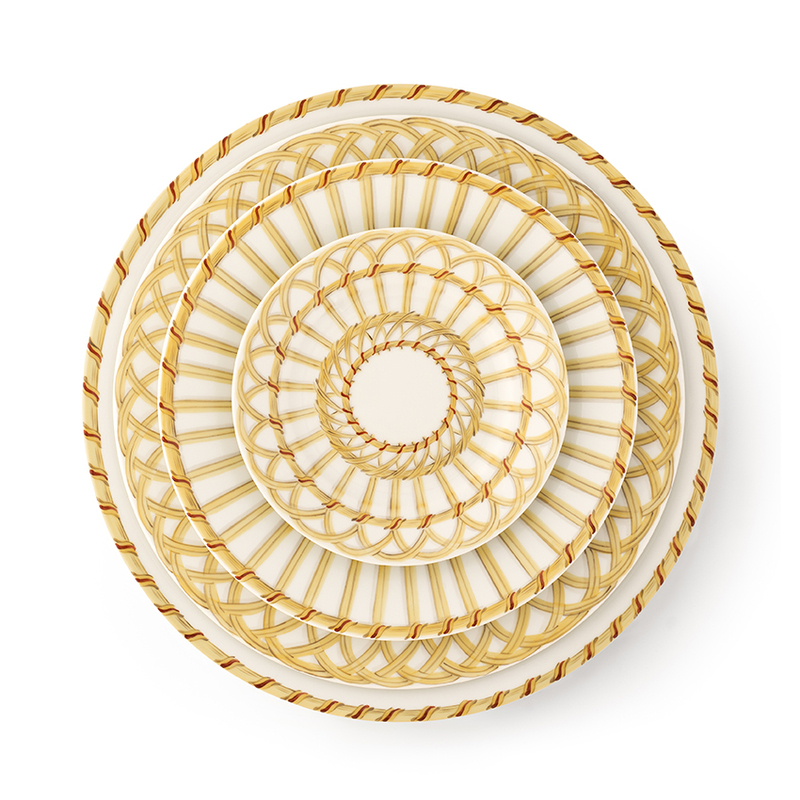 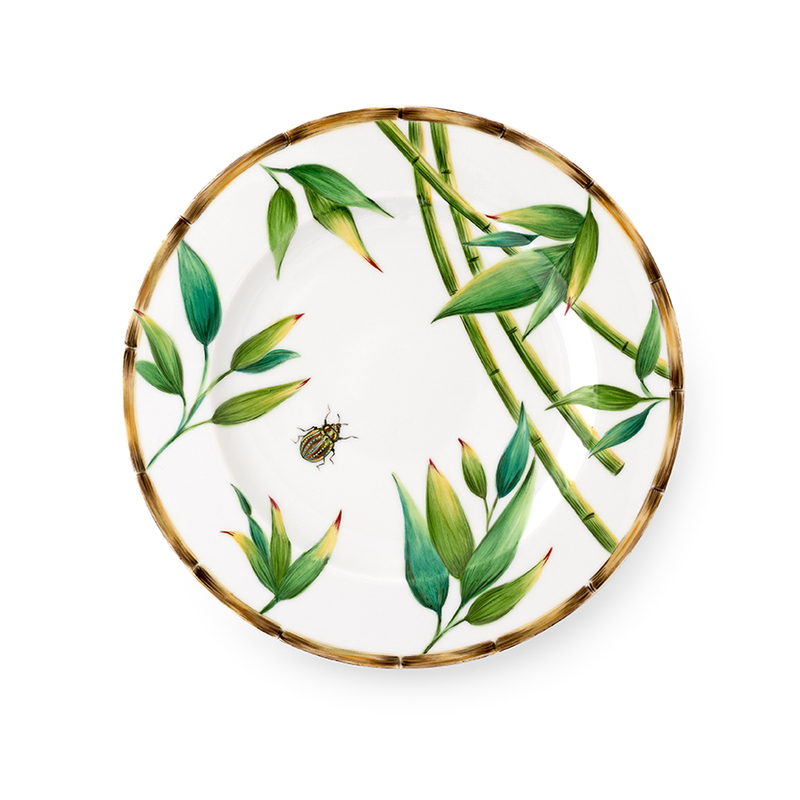 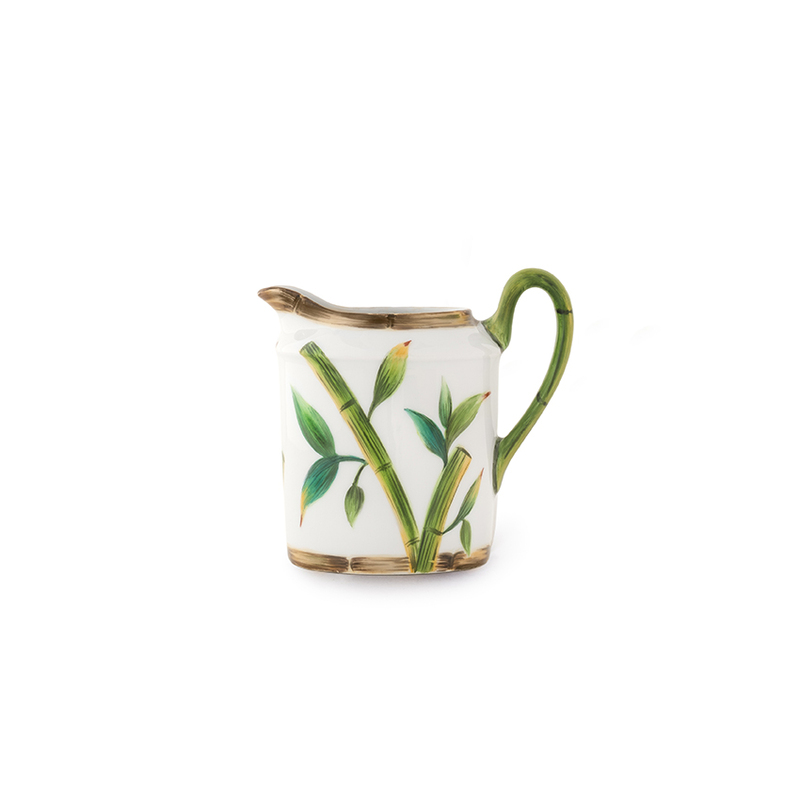 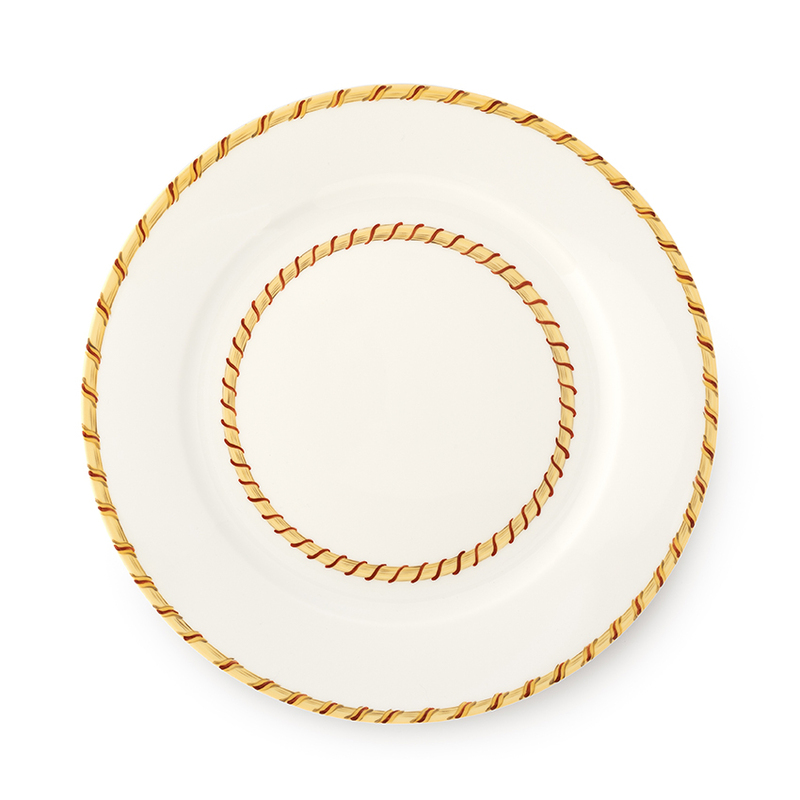 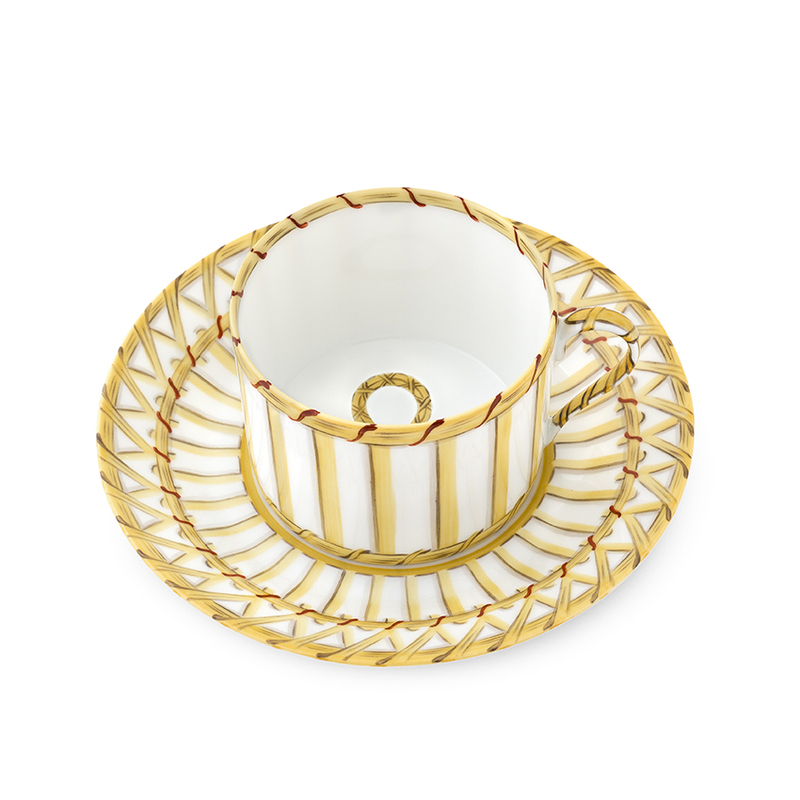 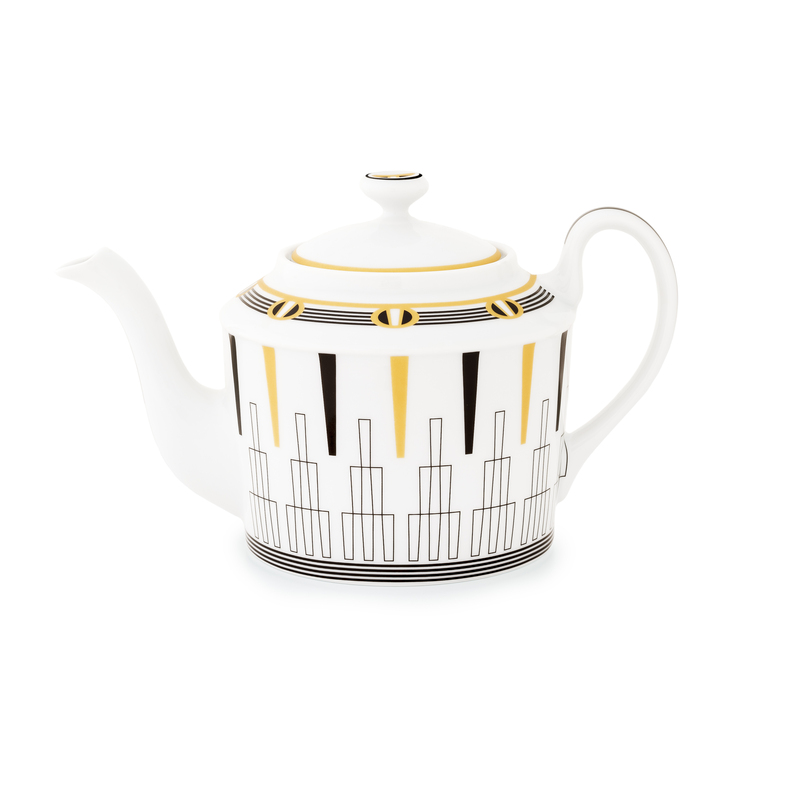 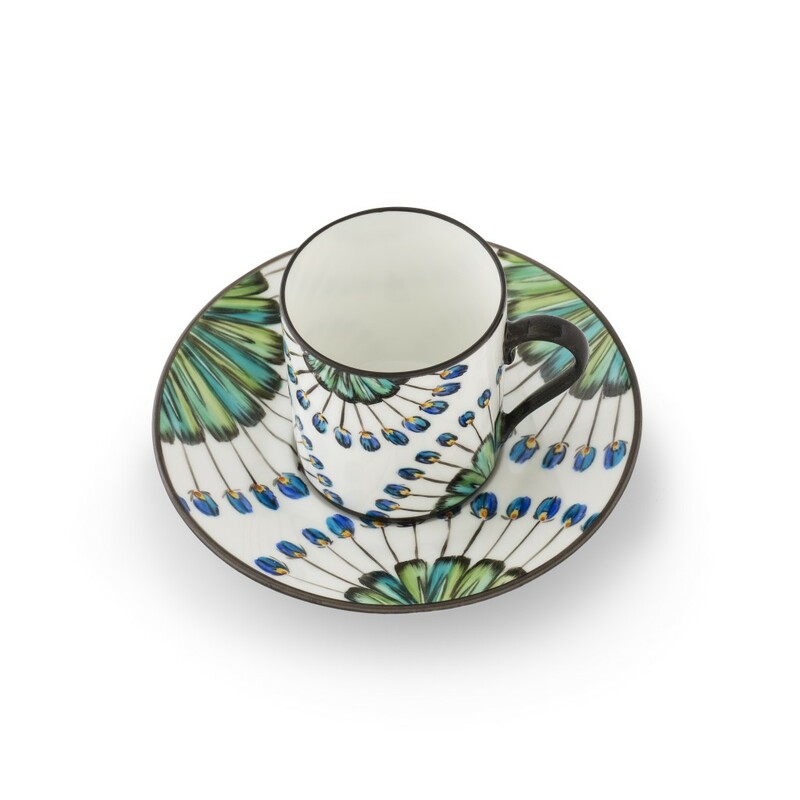 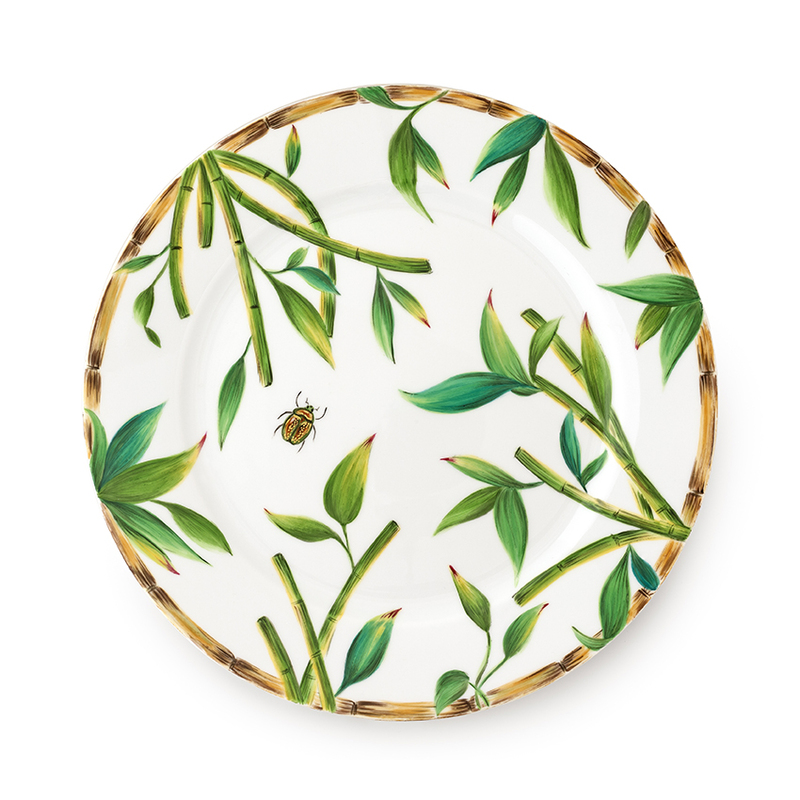 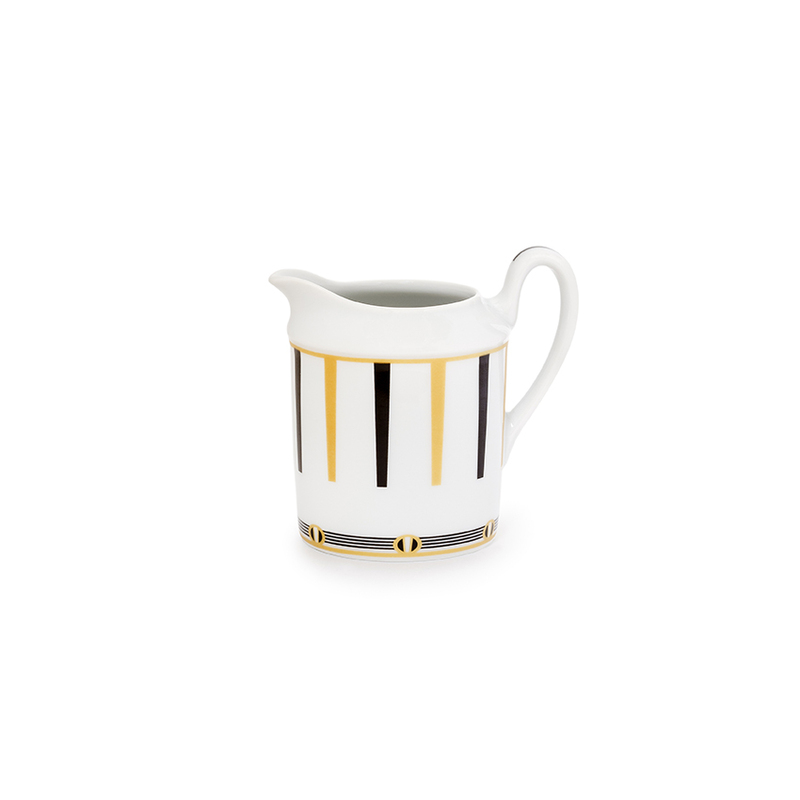 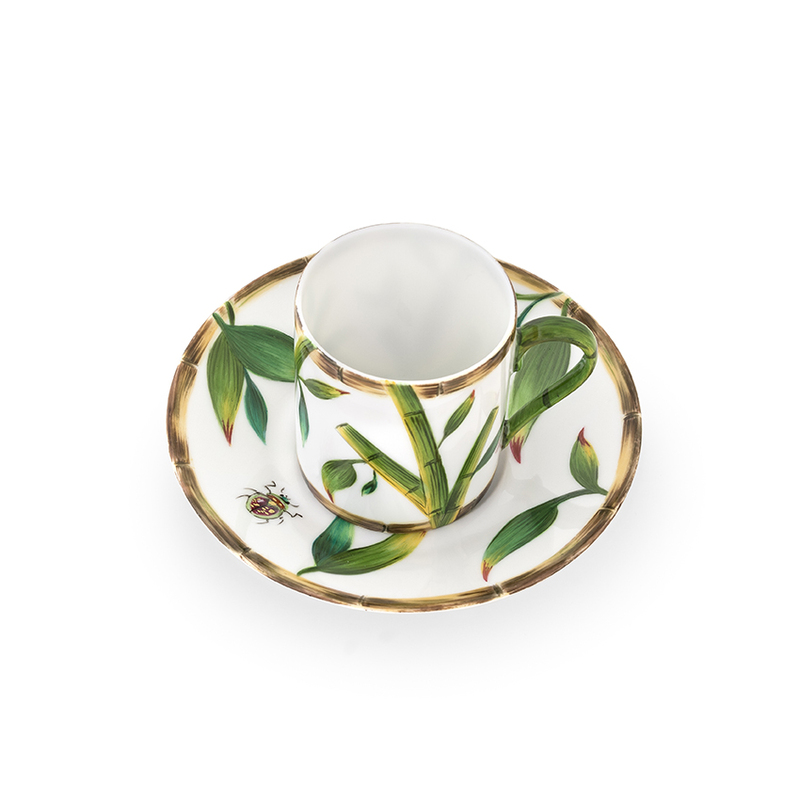 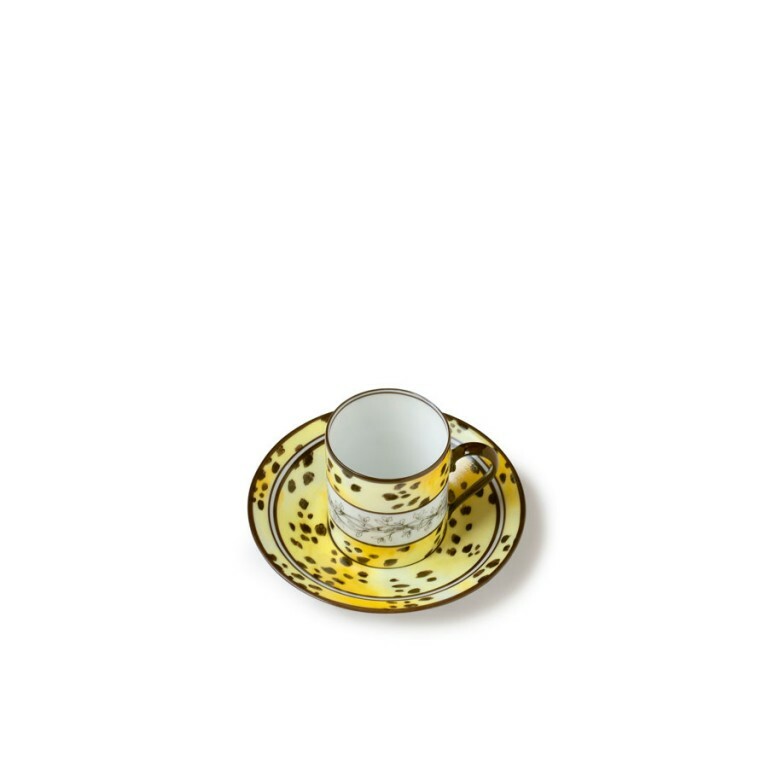 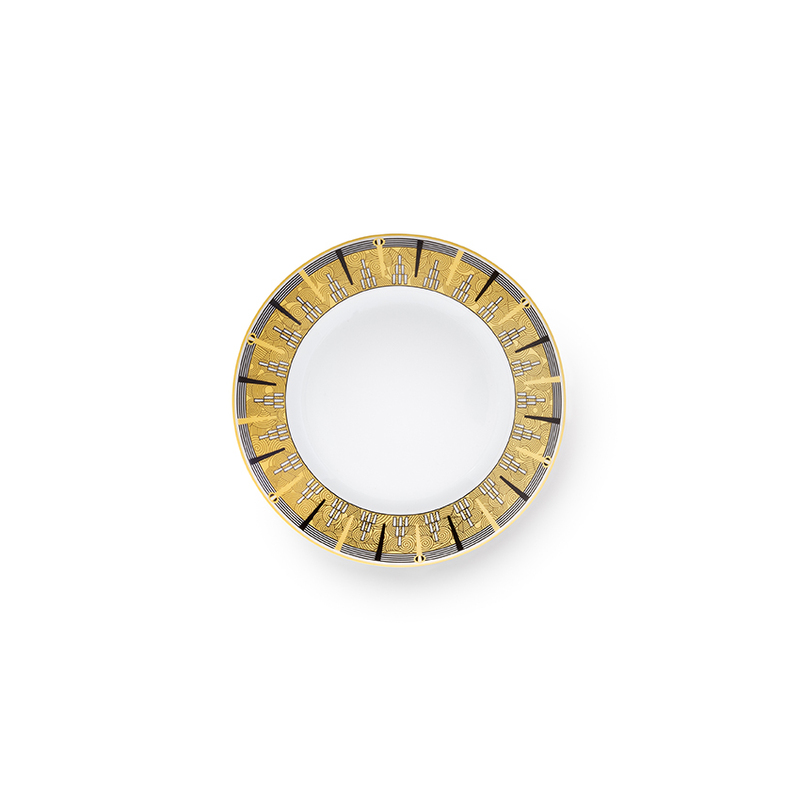 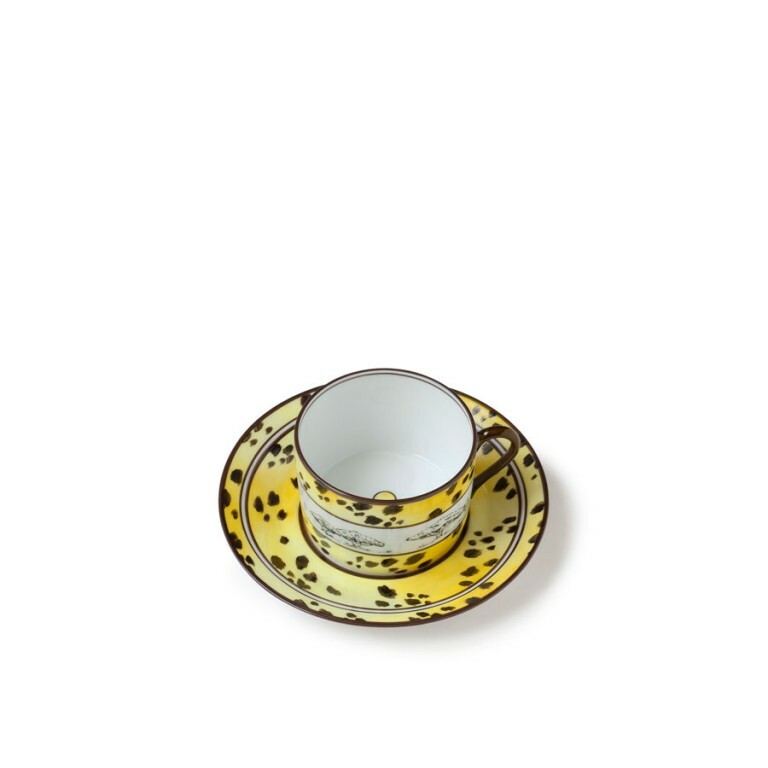 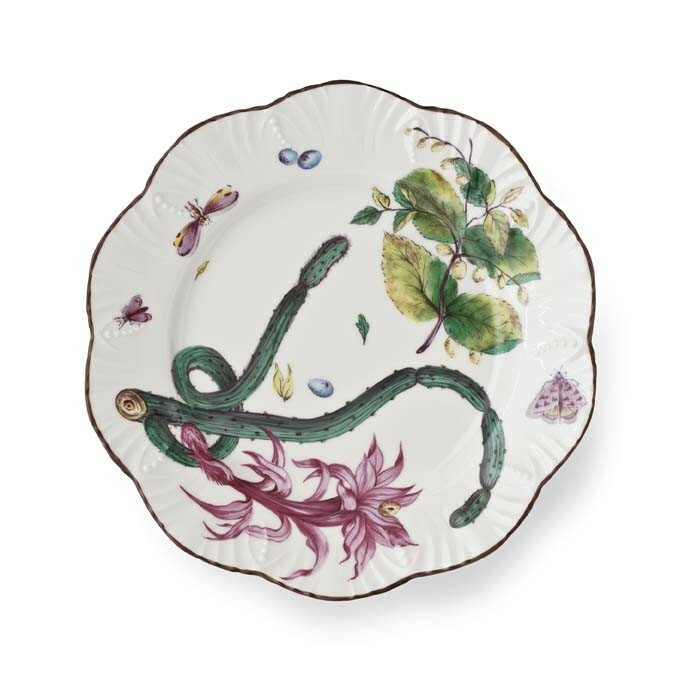 Its friendly presence animates with subtle golden touches this service hand painted on Limoges porcelain. 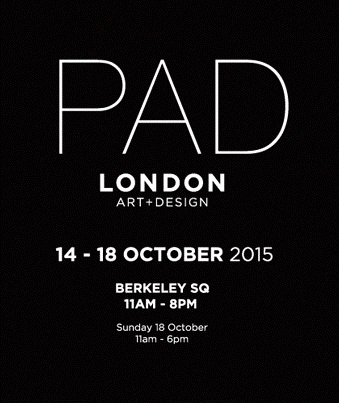 This year the PAD Paris faithful will be welcomed to the Pinto pier. 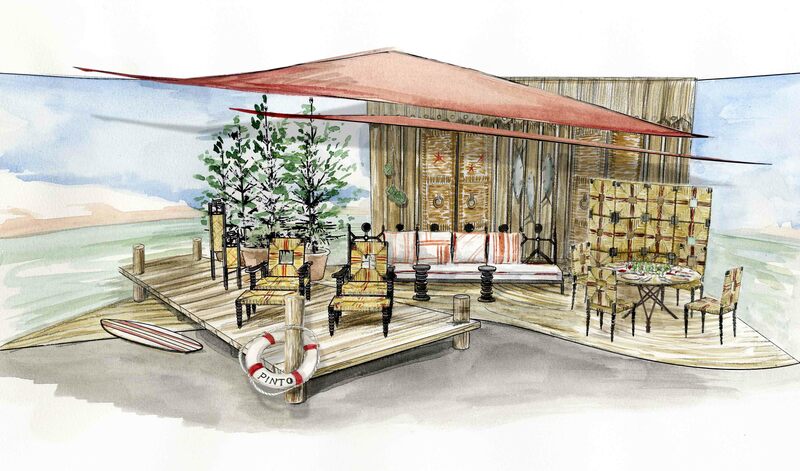 A bungalow space facing the open sea, comfortable long bench, straw and wood furniture : an elegant invitation for relaxing and being in a vacation state of mind. 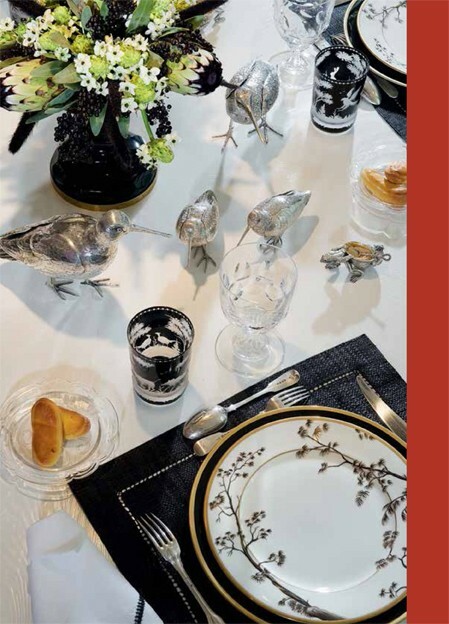 And as always at the Pintos, a beautifully set table, the promise of a convivial moment to be shared together. 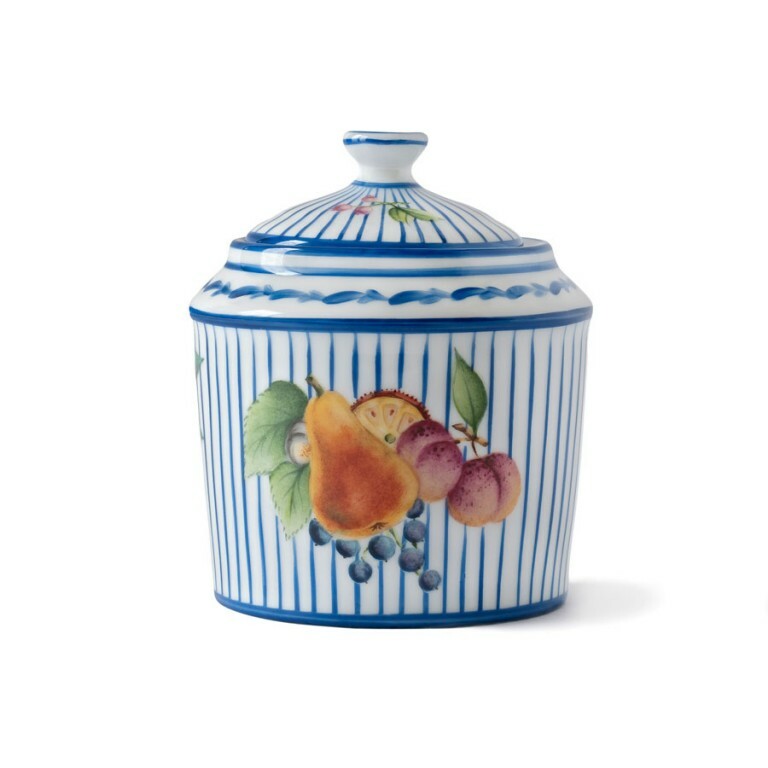 New collection COTTAGE by PINTO Paris. 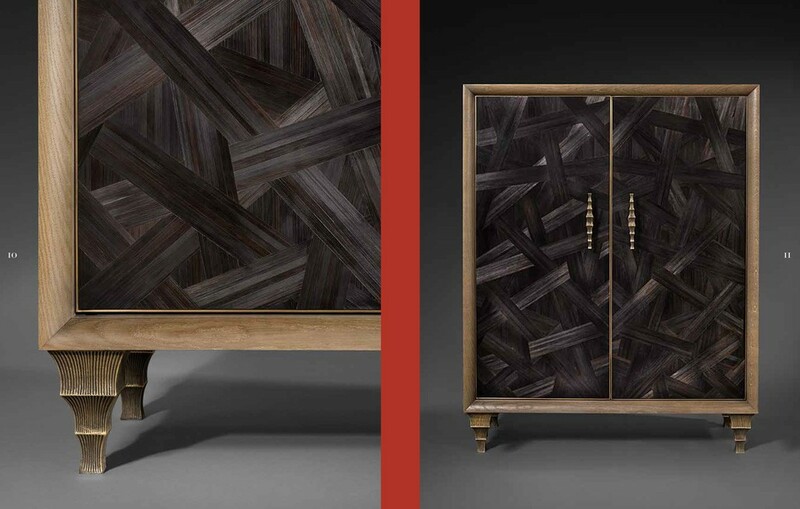 Pinto has taken a new approach to country furniture working with massive oak and natural straw in traditional French workshops, the woods are shaped in modernist forms while the straw takes the look of a graphical and colorful tartan plaid. 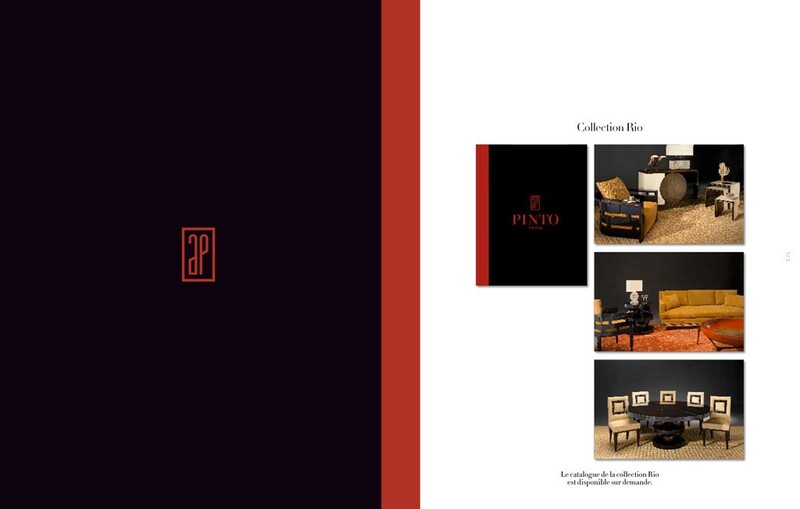 Pinto Paris puts the accent on a sophisticated conception which as usual makes the perfect furniture for refined eclectic interiors. 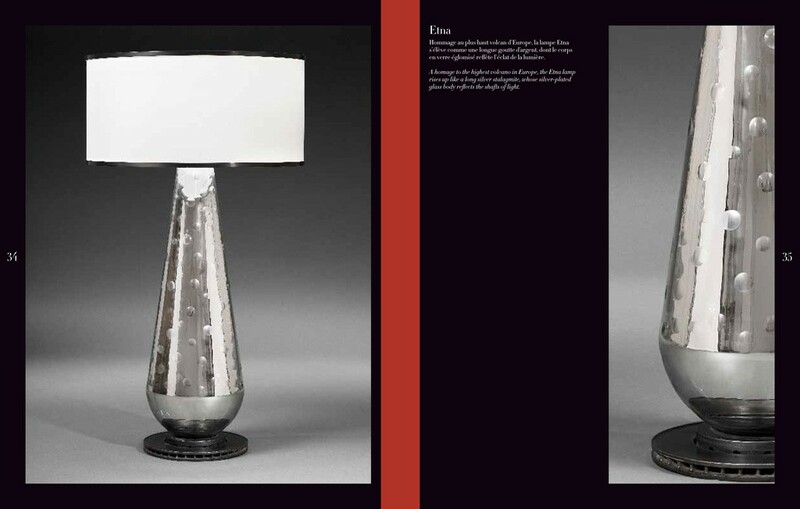 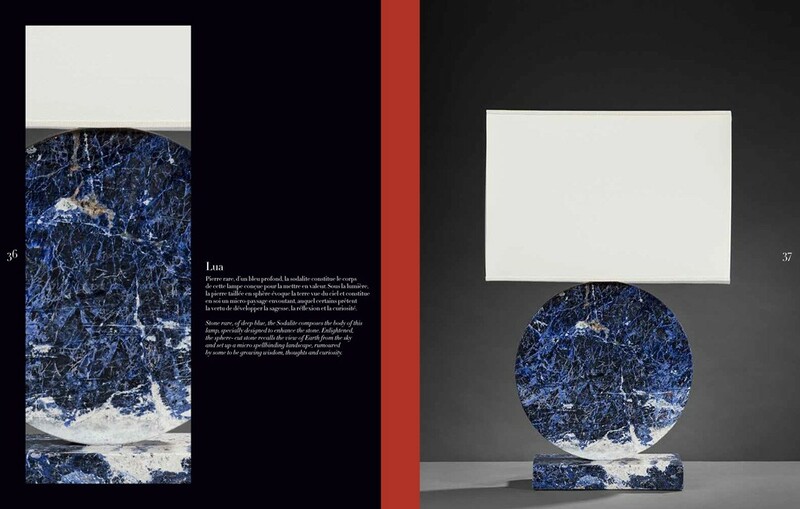 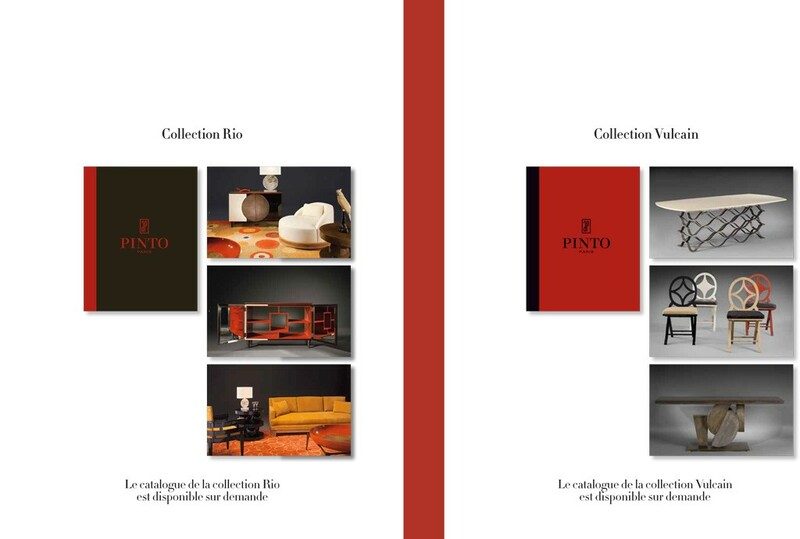 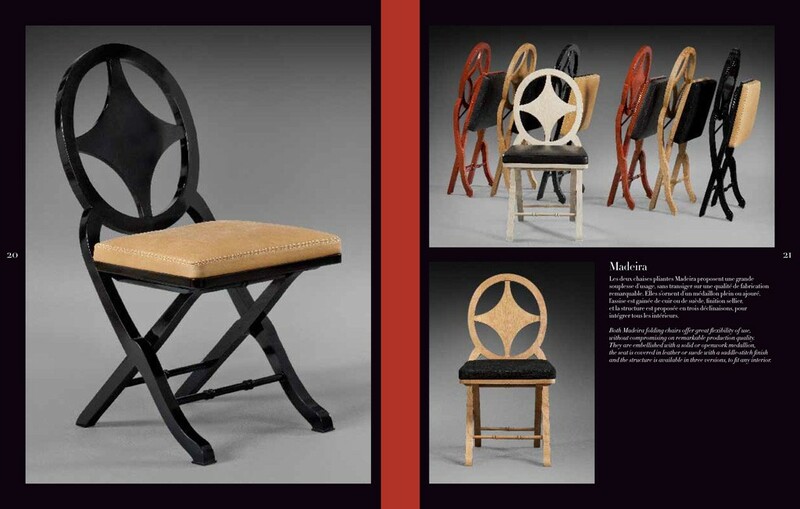 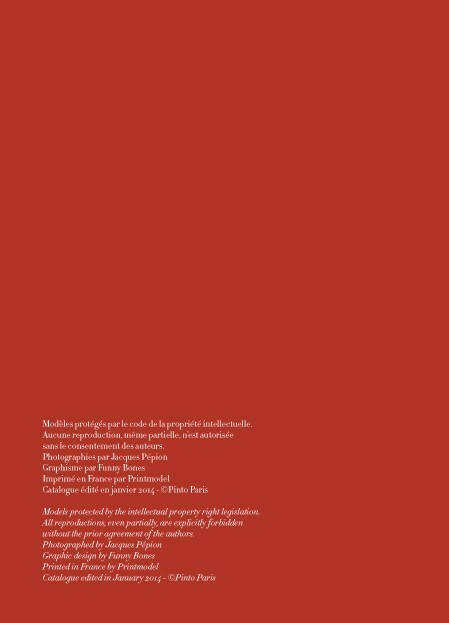 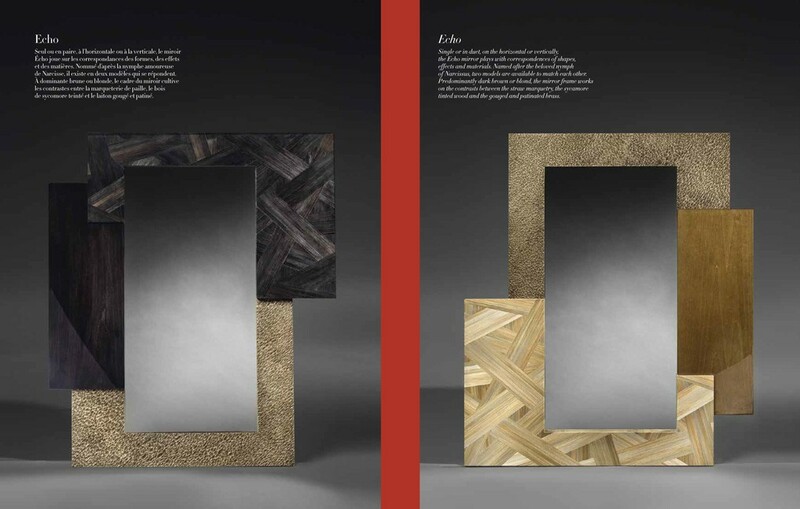 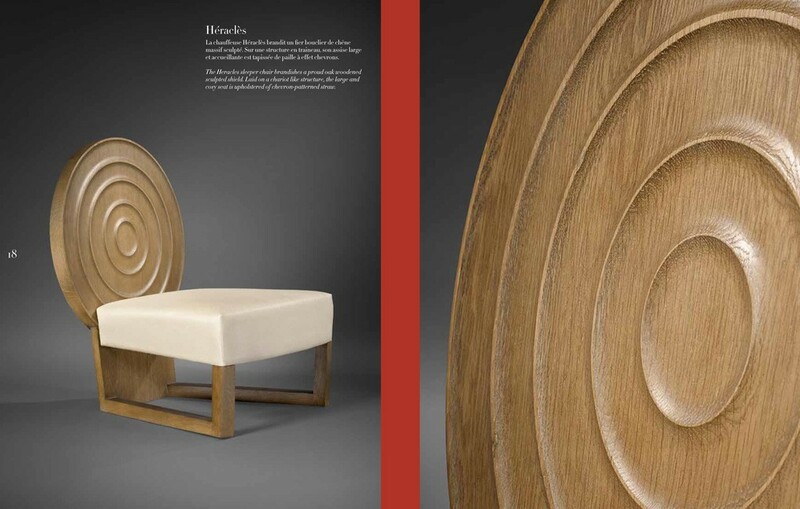 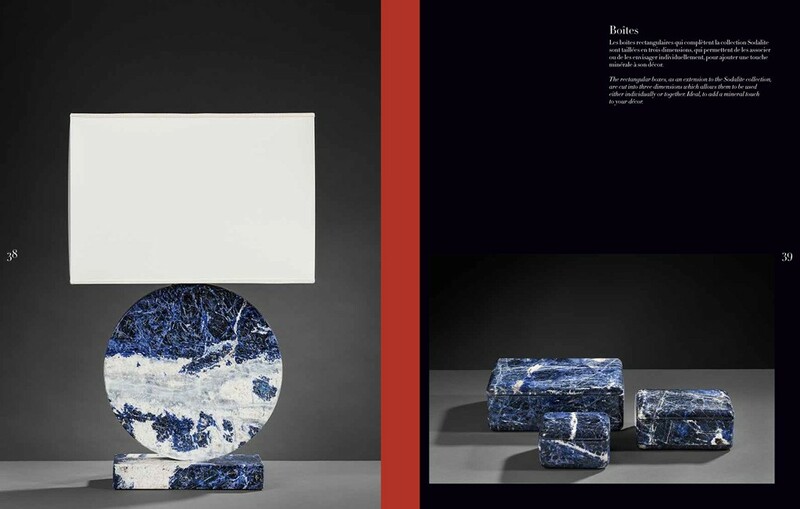 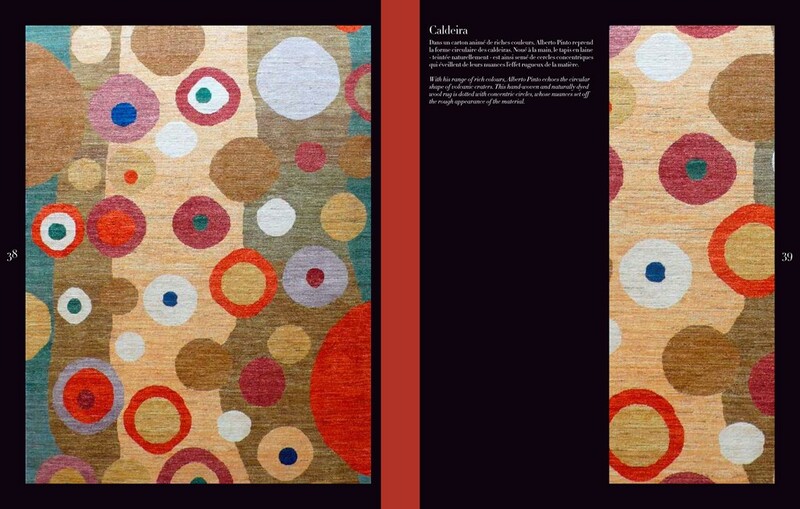 Pinto Paris is pleased to present the 2019 edition of the catalogue “Collections”, which gathers all creations since 2009. 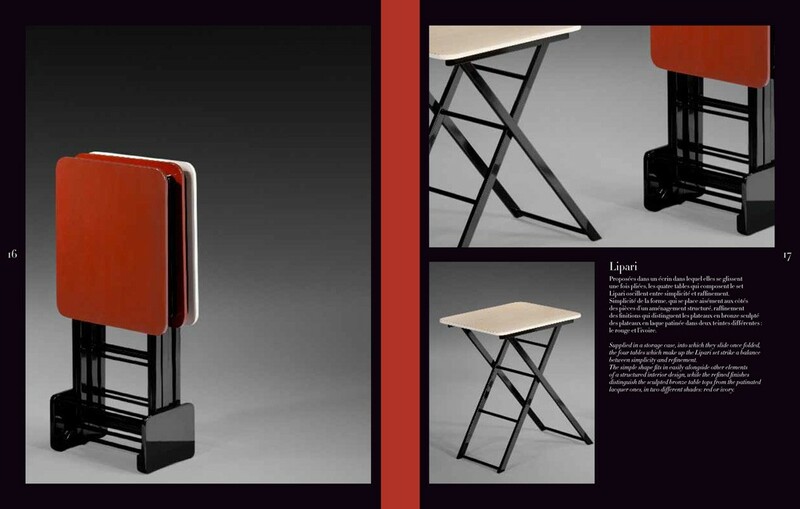 The page numbers, indicated in red, are clickable and allow you to directly access the technical description of the item. 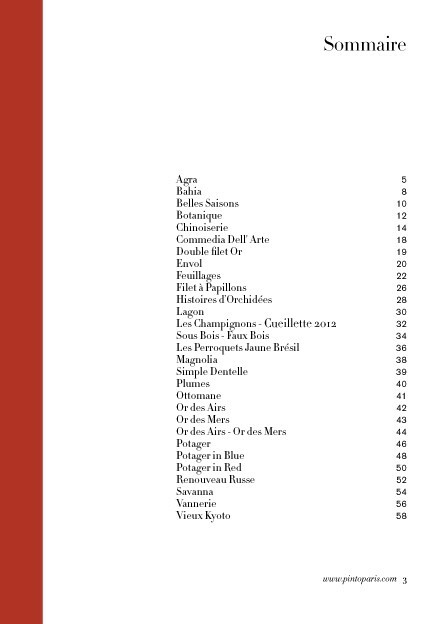 The catalogue is available in PDF on request. 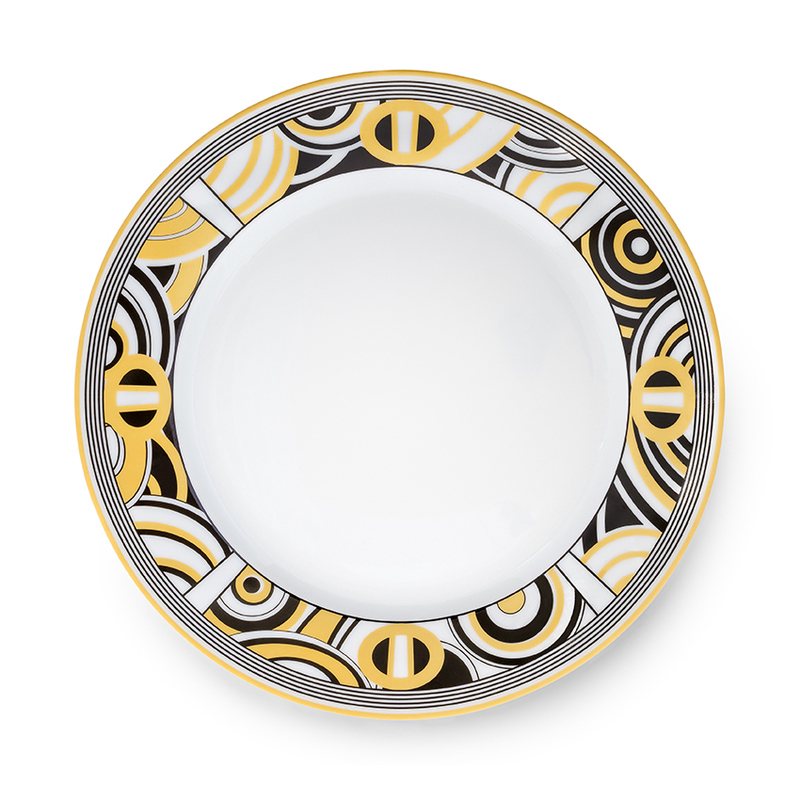 BROADWAY- Taking its’ inspiration from the grand “brasseries” of the early 20thcentury frequented by artists’ movements: Vienna Secession, Paris Art Deco, Berlin cabarets to Broadway! 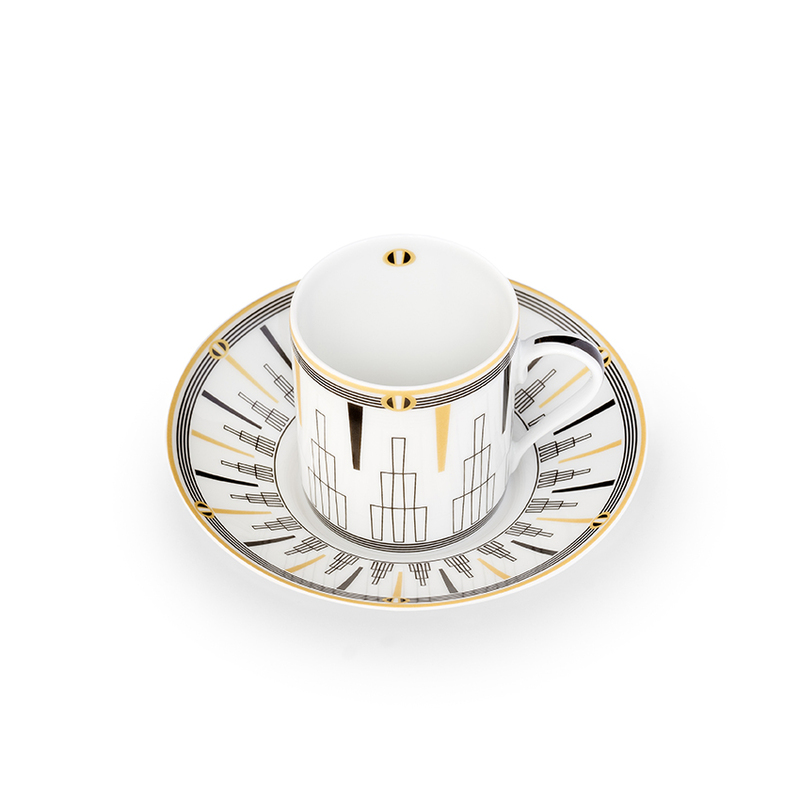 Sometimes a music hall setting where, across a pure white body of the Limoges porcelain, coffee beans and black accents rhyme and enchant the honey and gold tones, or sometimes the subtle evocation of New York city skyscrapers with their breathtaking verticality. 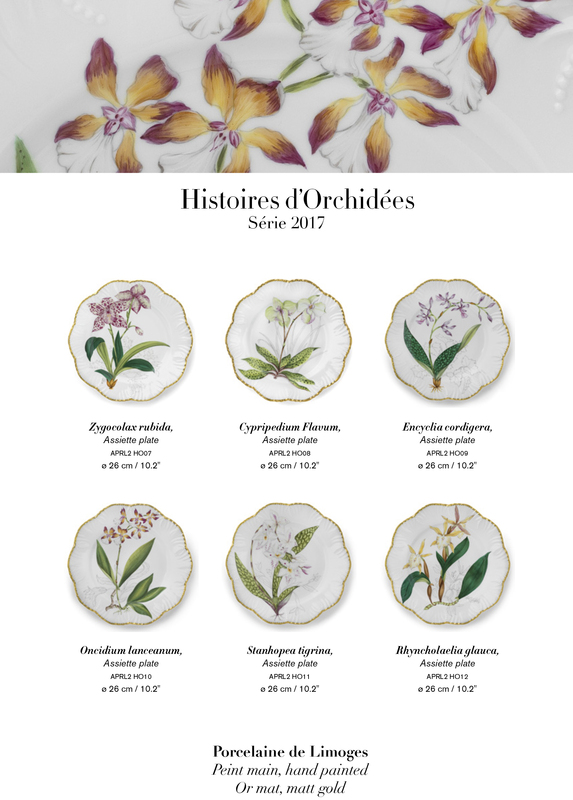 Discover our new serie of Orchids during Maison & Objet in our showroom on September 2017. 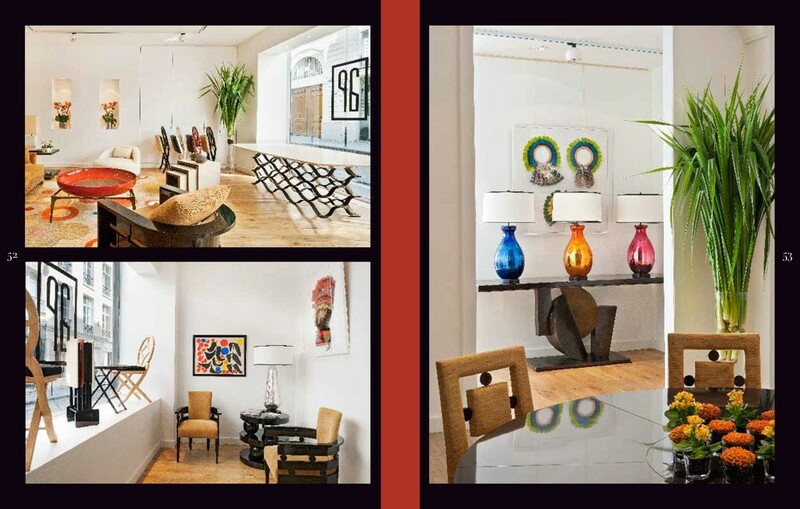 World renowned interior designer Alberto Pinto invariably worked his decorative magic to give form to the wildest of dreams. 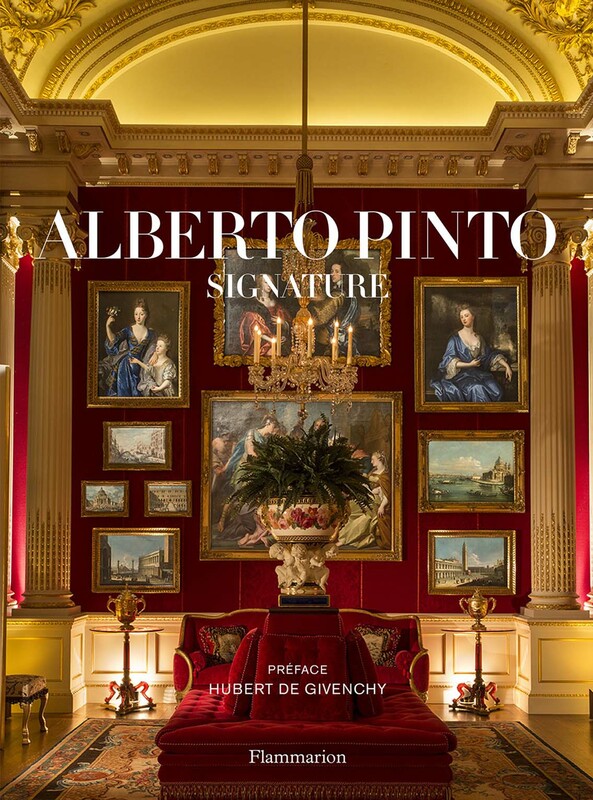 This volume invites readers inside these exceptional interiors for the first time, revealing the quintessential Pinto style in all its splendour and diversity. 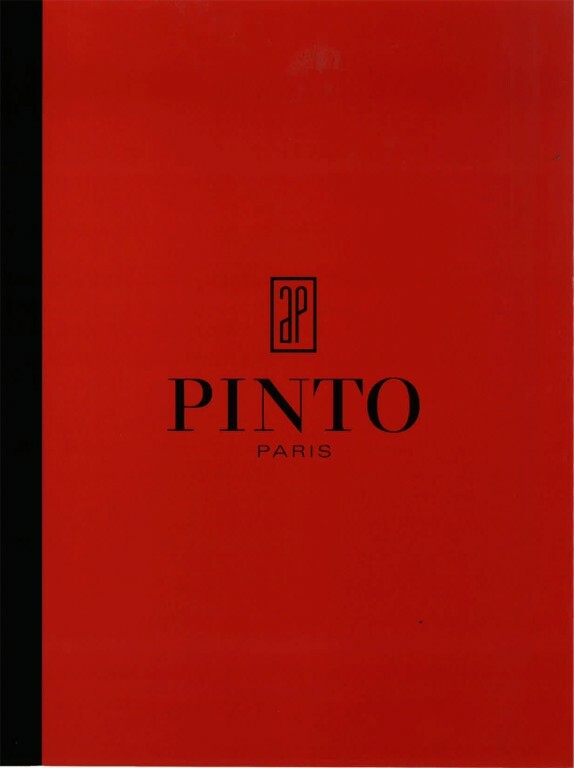 You will also discover a chapter on Pinto Paris universe. 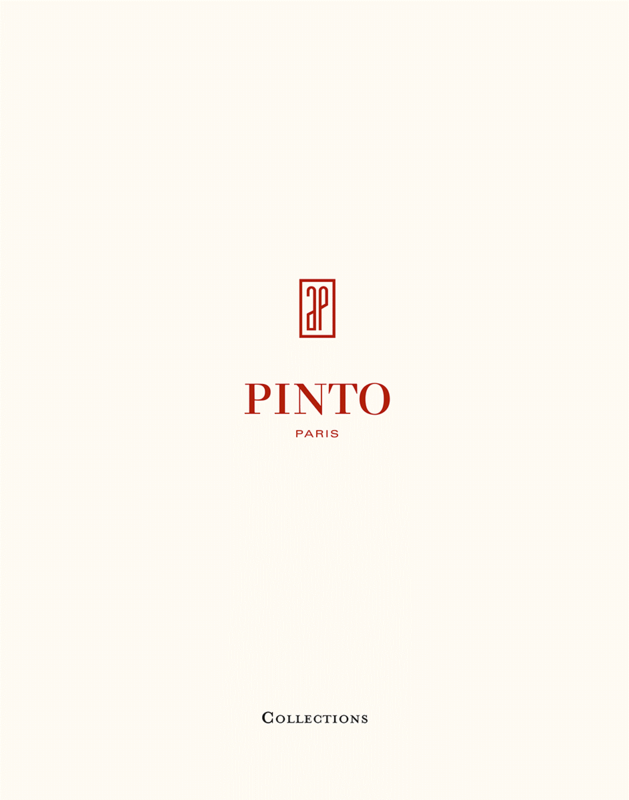 During the PAD London 2016, and for its second participation, PINTO PARIS will present in exclusivity its new creations, from the 5th to 9th of October . 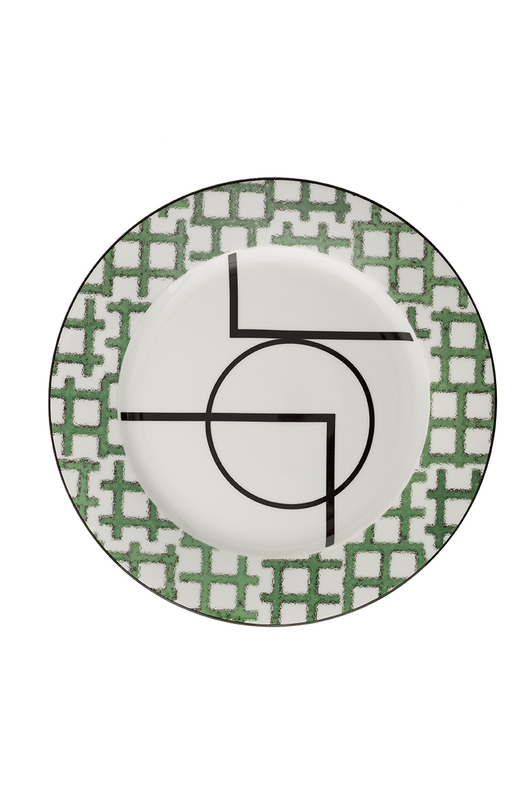 MENTA is a new Pinto Paris porcelain creation with a determined sporty and modern spirit. 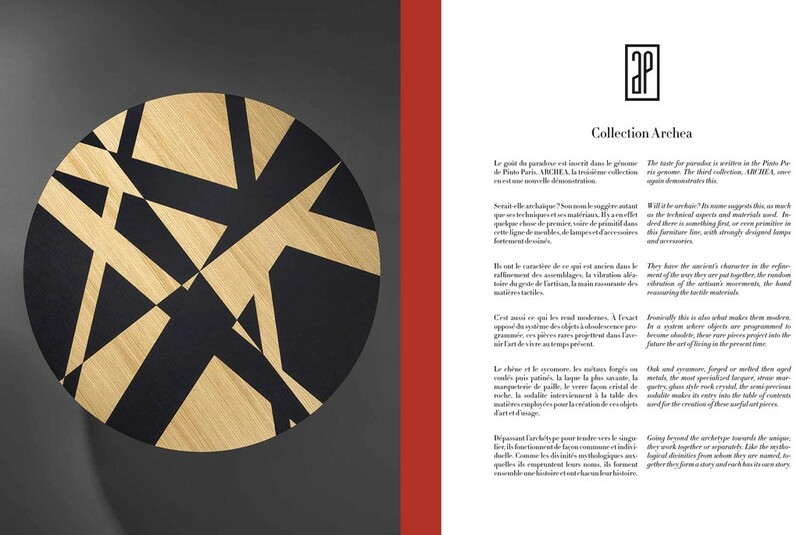 A design of perpendicular and parallel lines, a pure circle inserted into a minimal and abstract composition – evoking sports grounds and gymnastic moves. 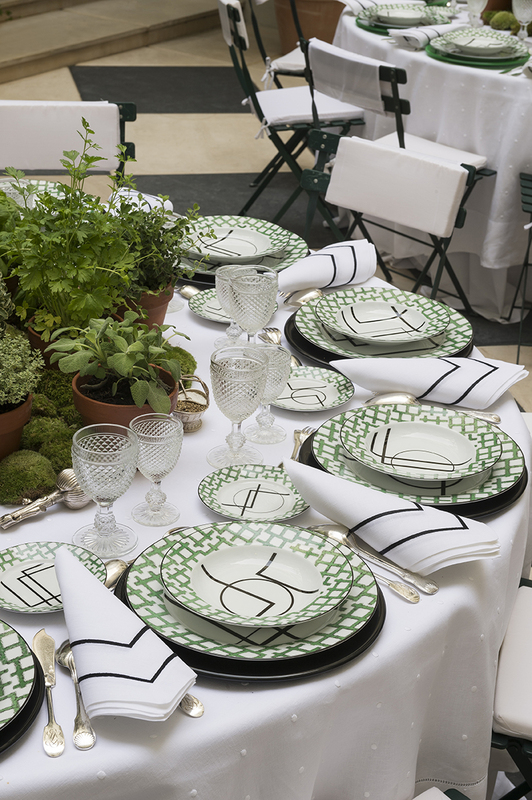 Menta in latin designates gym apparatus: parallel bars, rings, balance beam…The rims of the plates with their labyrinth greenery brings to the exercise a fresh surrounding, green chlorophyll…menta. 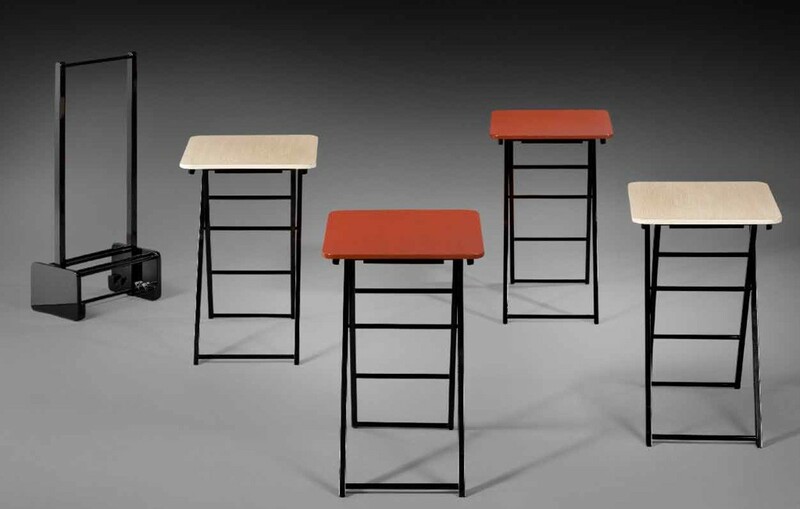 Out of the gymnasiums and onto the playing fields! 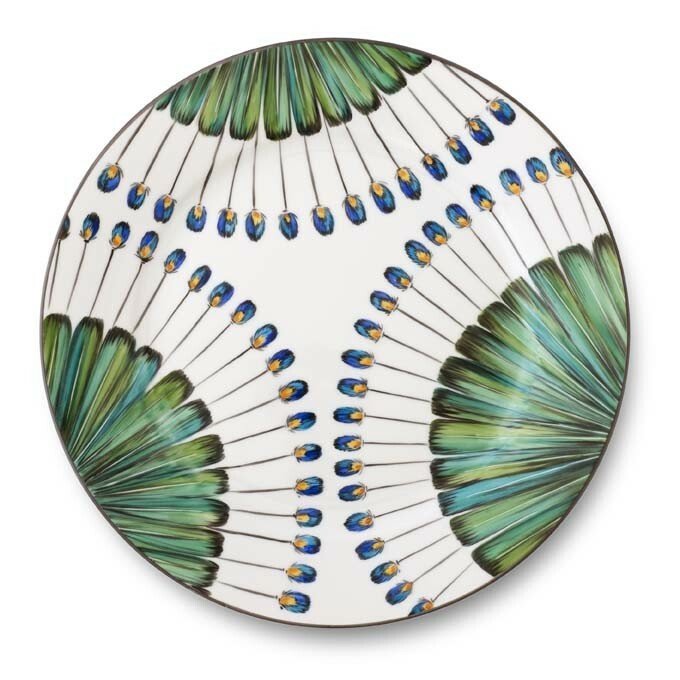 The MENTA collection offers six applied designs on Limoges porcelain which makes for multiple and dynamic mixing and matching. 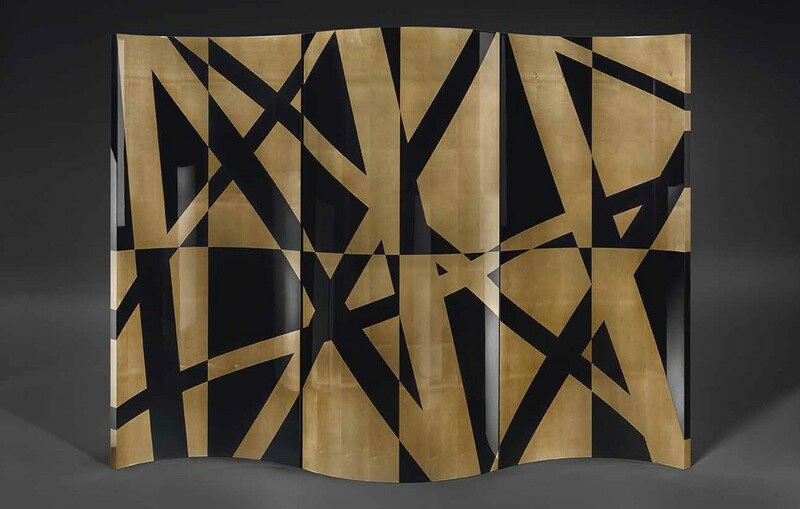 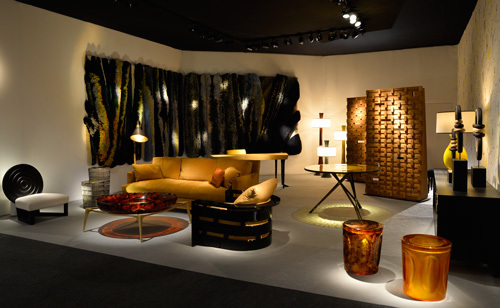 Pinto Paris has presented its last creations at PAD London 2015 fair last october. 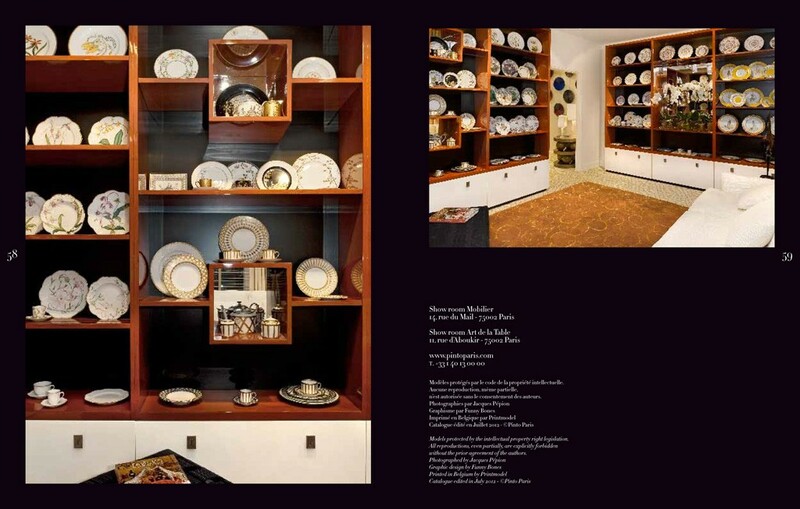 The collection was really appreciated by visitors, collectors and decorators. 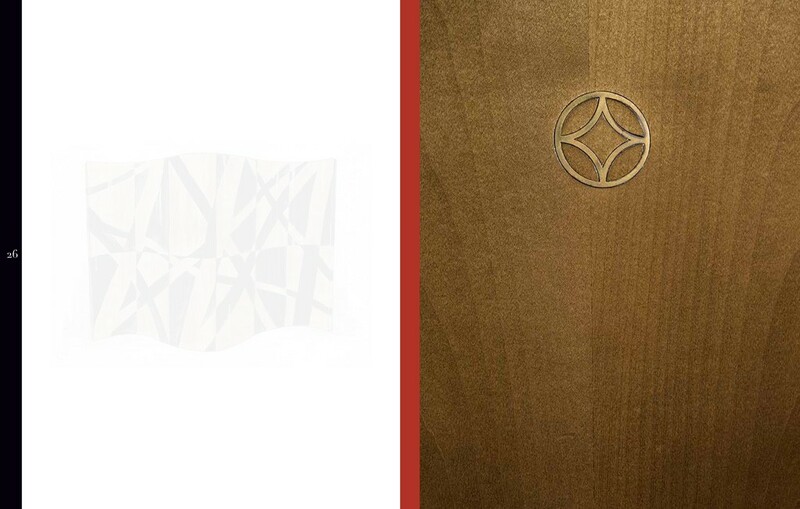 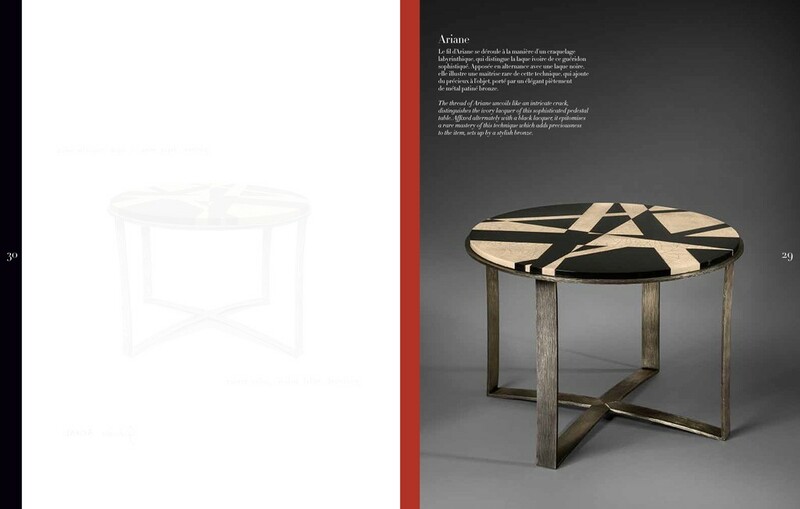 The LODGE collection of furniture is made by French creative craftsmen in noble materials adapted for exterior use. 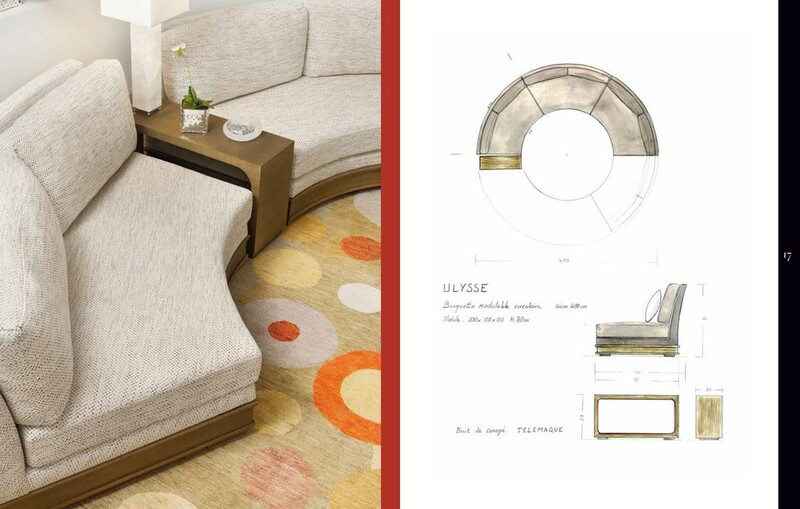 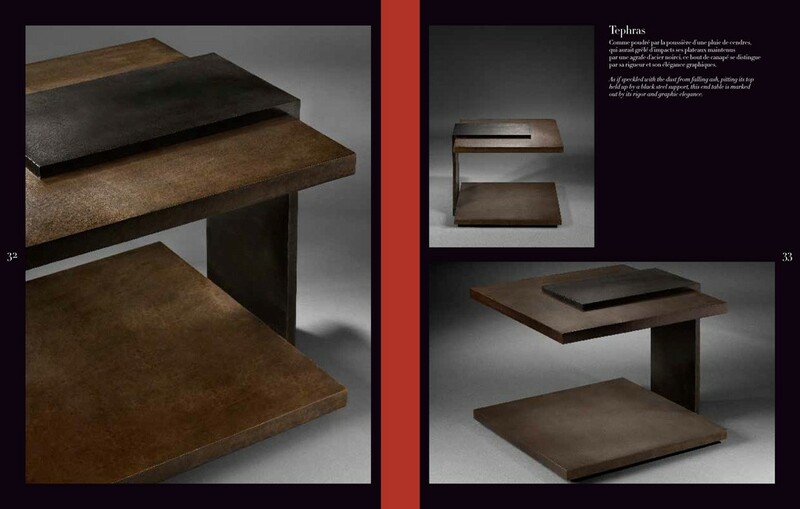 Simple and luxuous, its design revisits the minimalism of th XXth cntury but with an added sophistication. 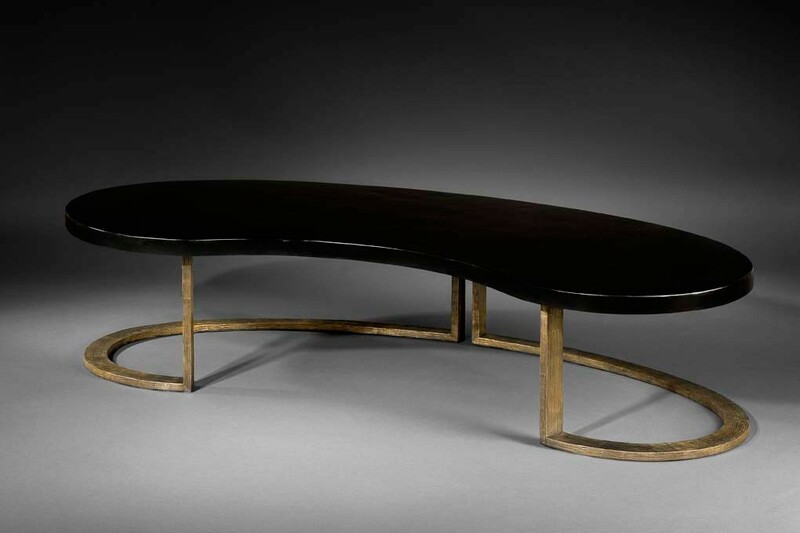 The structure of brass textured and patinated in two tones supports the very finest upholstery produced by French artisans. 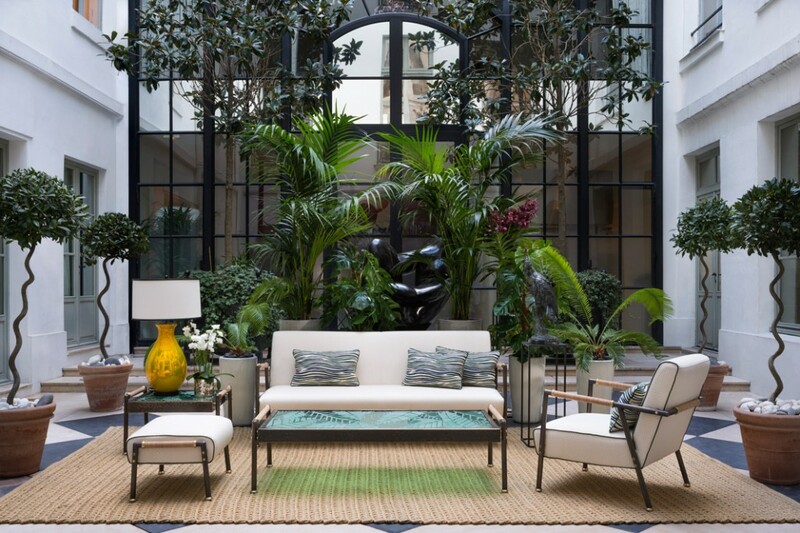 The outdoor fabric has been exclusively made by the prestigious house of LE MANACH by PIERRE FREY for PINTO PARIS. 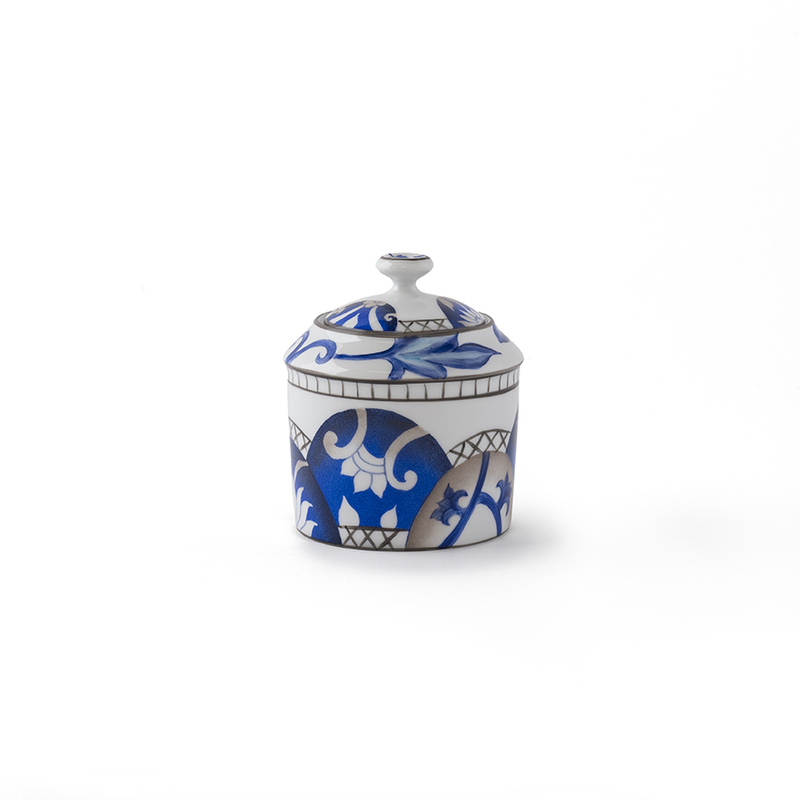 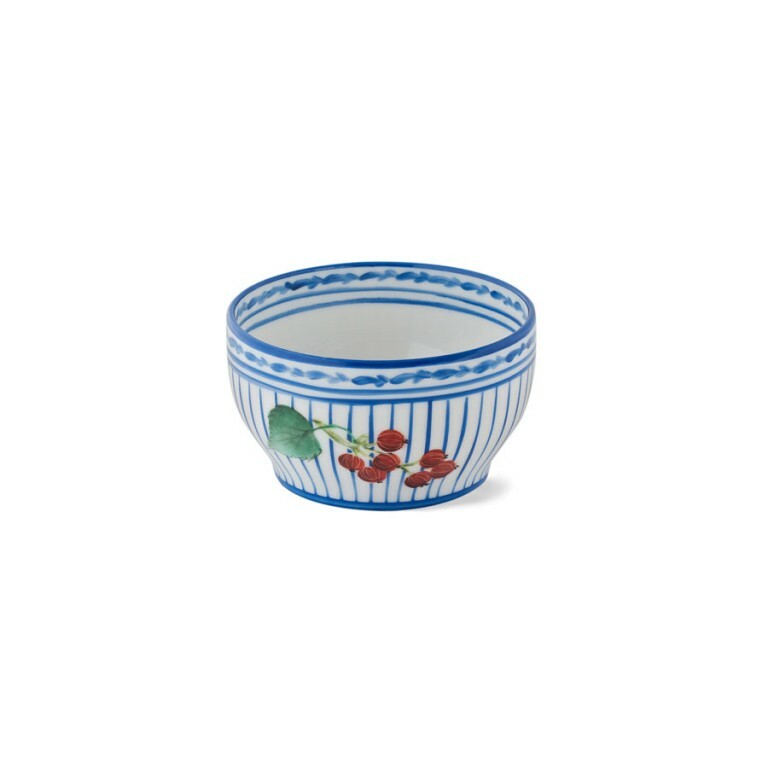 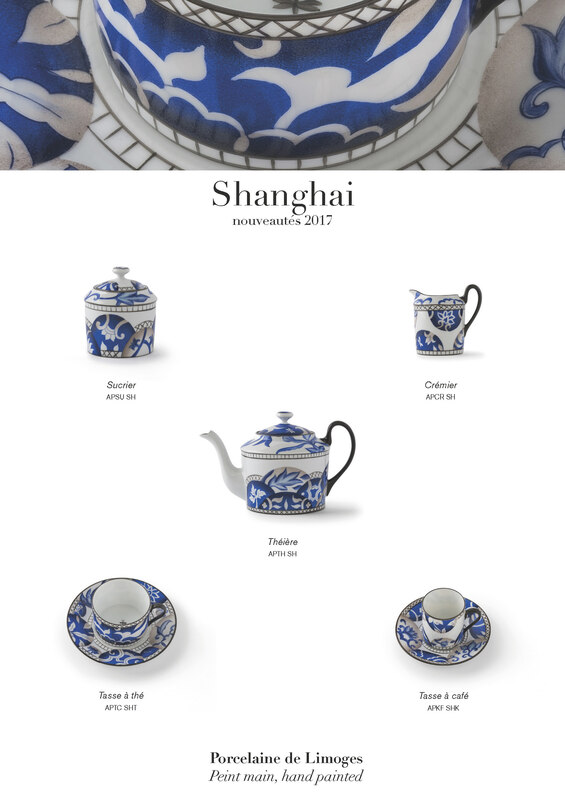 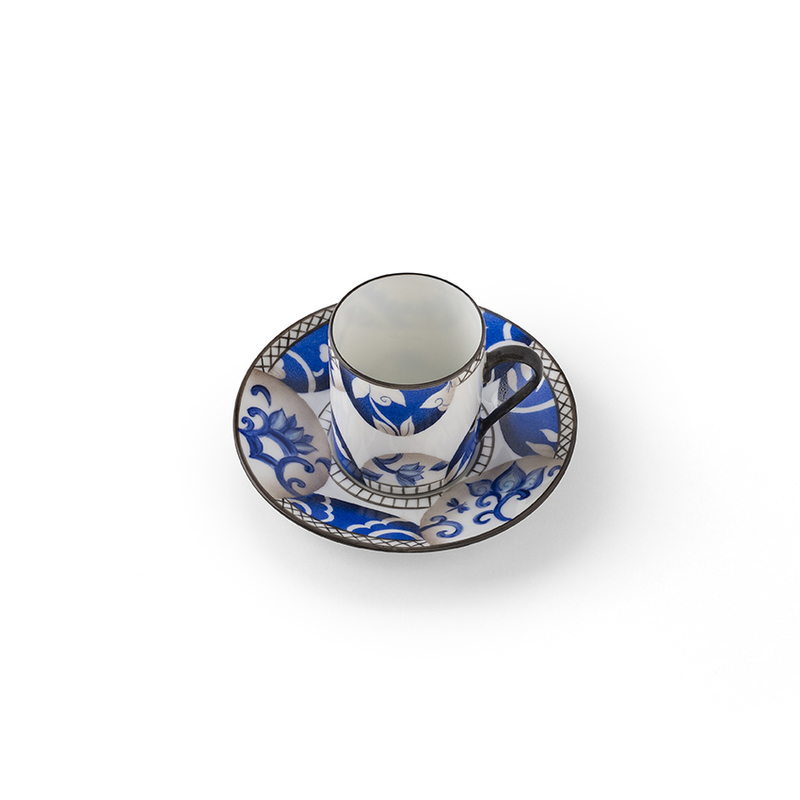 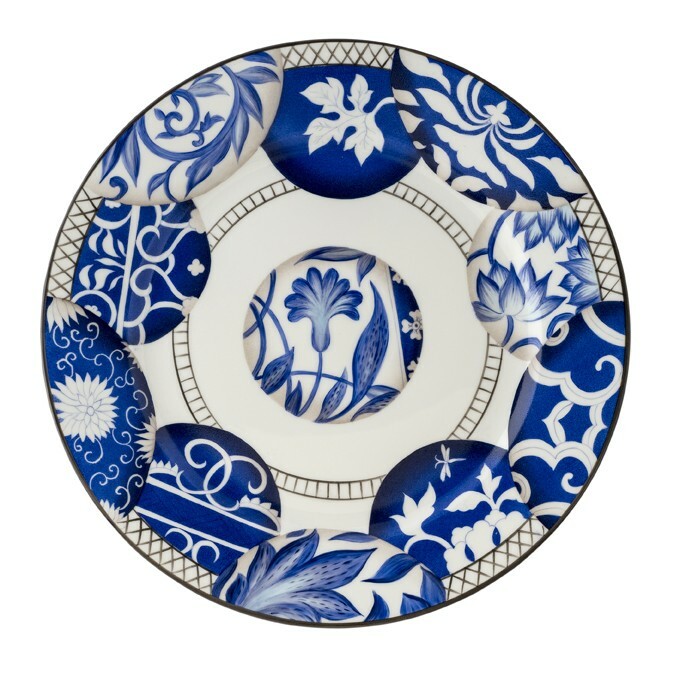 SHANGHAI, the Chinese “blue and white” porcelain modernized by Pinto Paris. 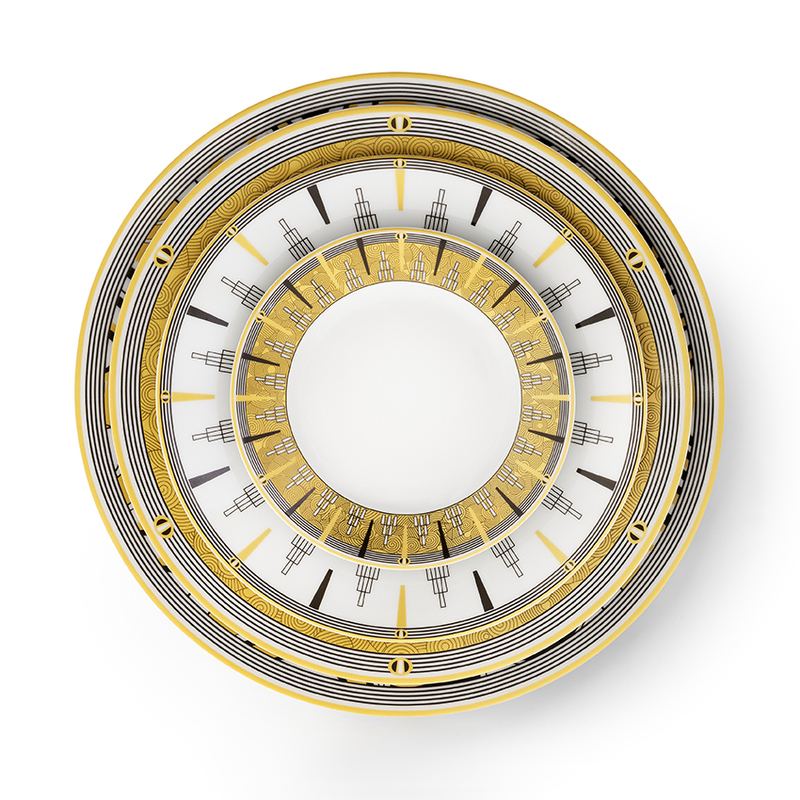 Positioned on architectural lines, a round of Chinese globes span out in knowledgeable variations using a classic vocabulary. 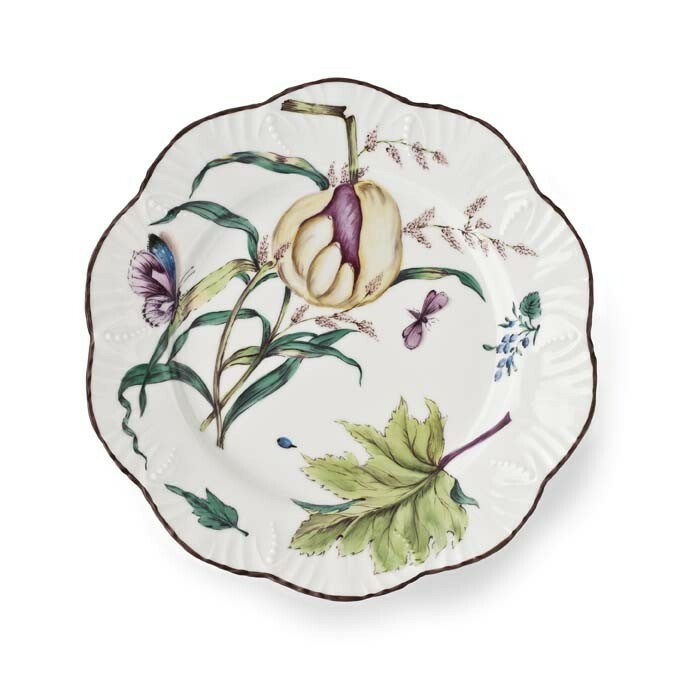 Each sphere captures the beauty of a well-known Chinese porcelain design – here a lotus, there a peony flower or a simple leaf unfolding. 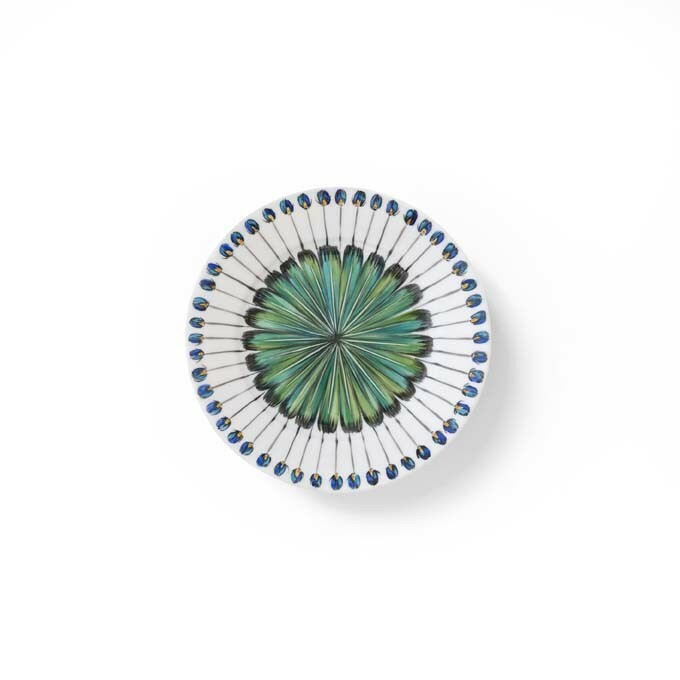 A dark blue background, delicate shadows creating a spherical illusion. 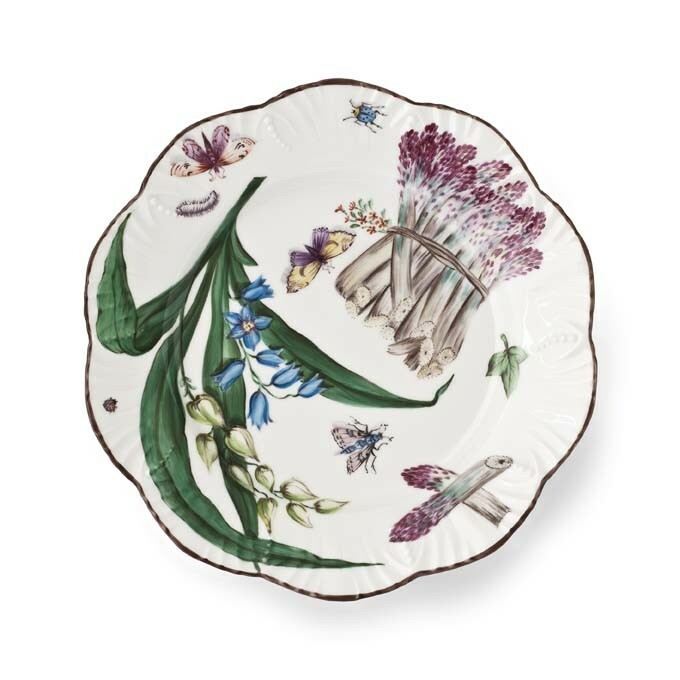 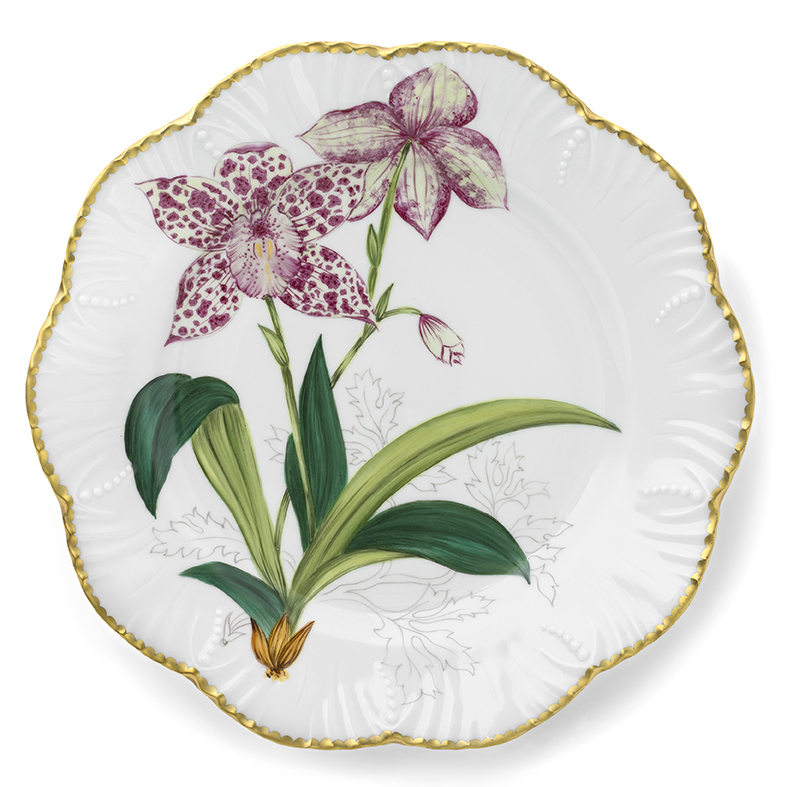 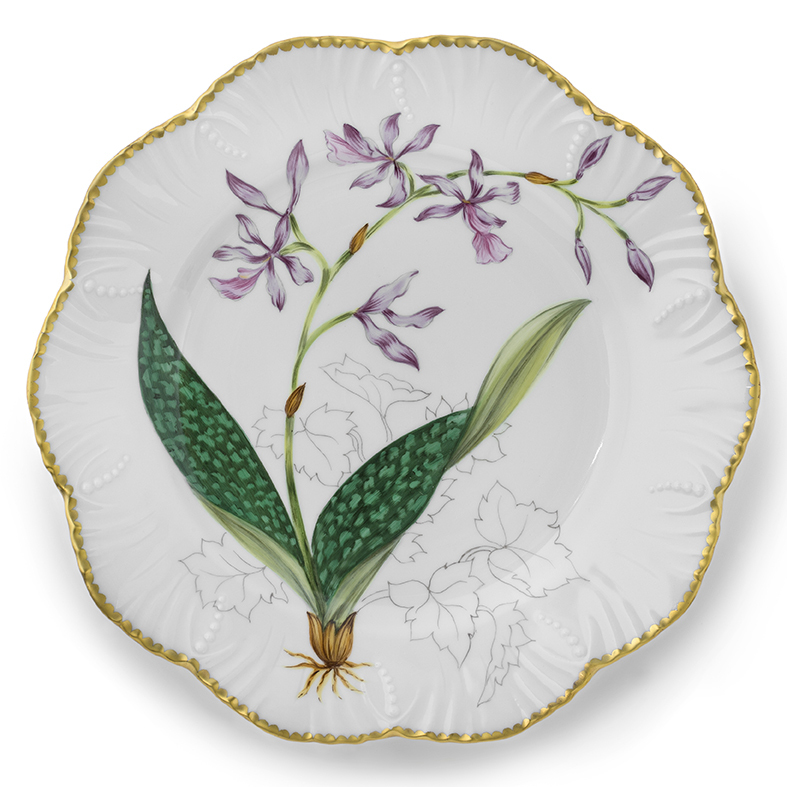 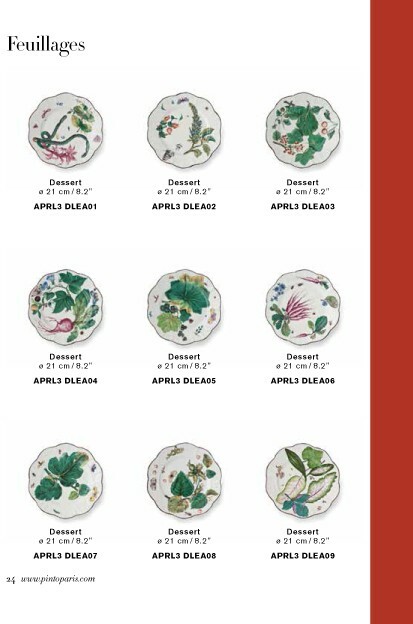 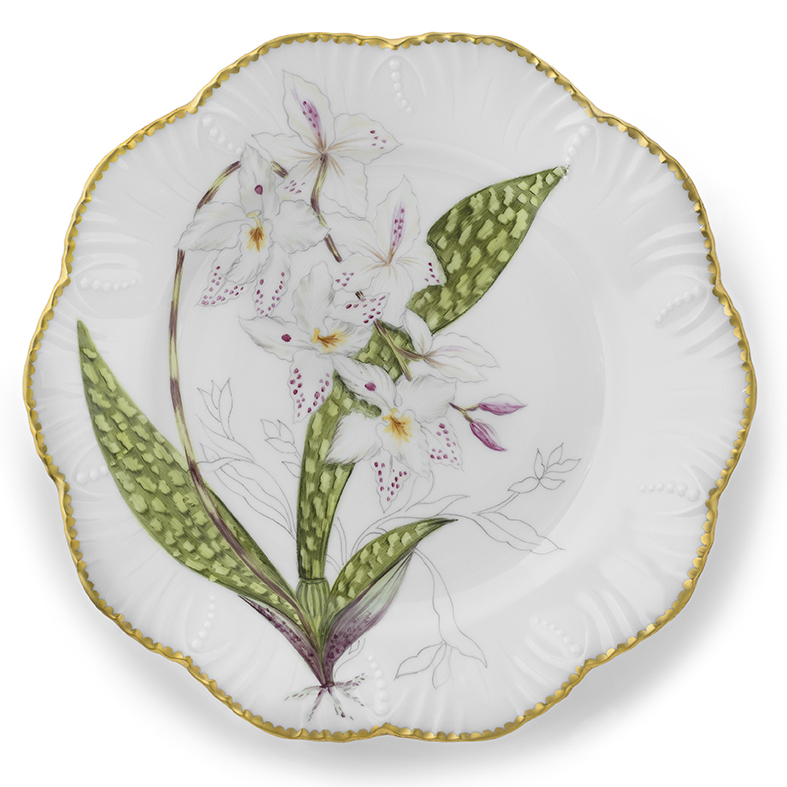 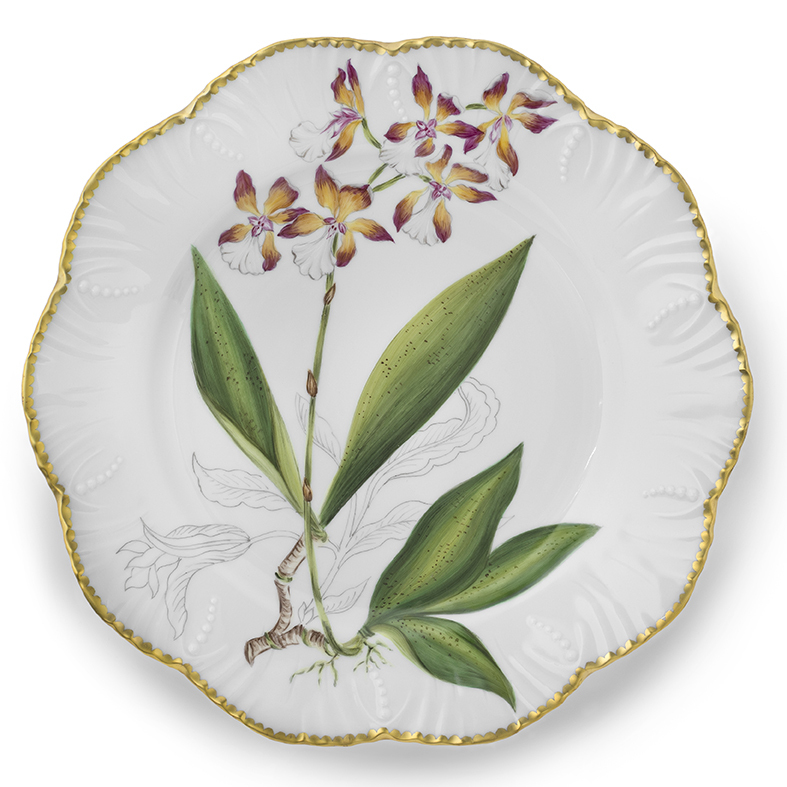 This is the apogee of hand-painted artwork on pure Limoges porcelain. 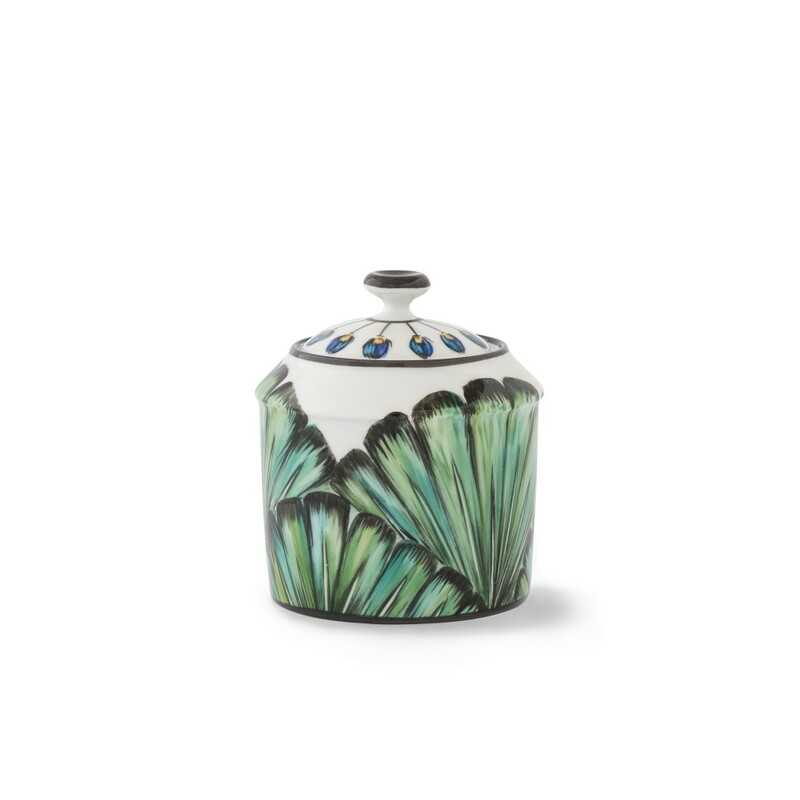 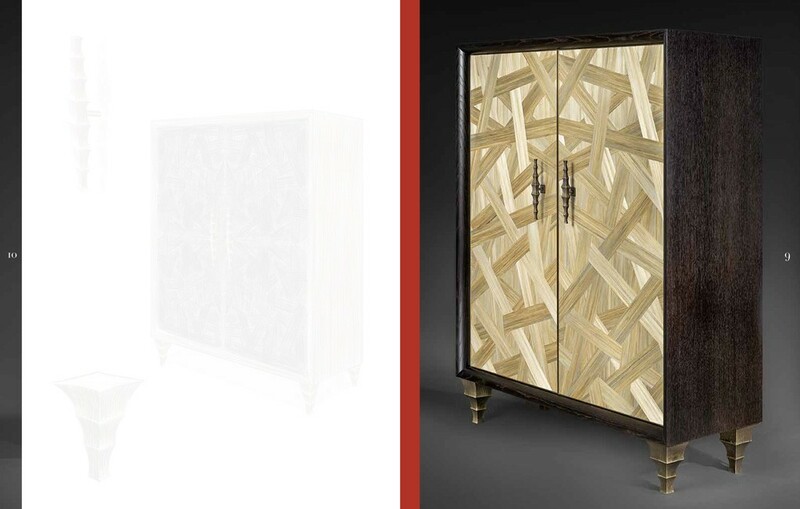 The collection ARCHEA grows rich this year with pieces forming a complete set, recreating a powerful landscape of legend.Drawing together, materials of exception and the very finest quality of ther arts and crafts, are the fundamental principals of PINTO PARIS style.  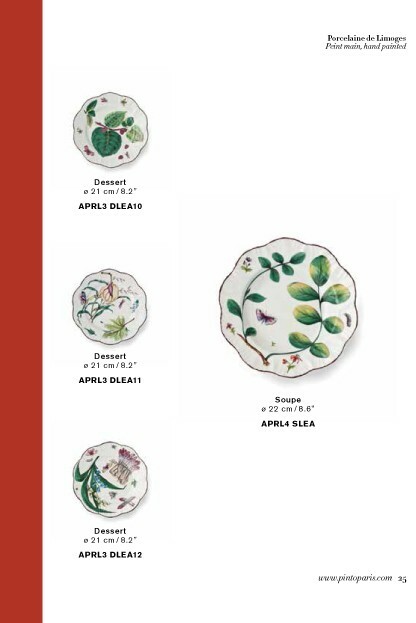 The Archea collection catalog is available upon request. 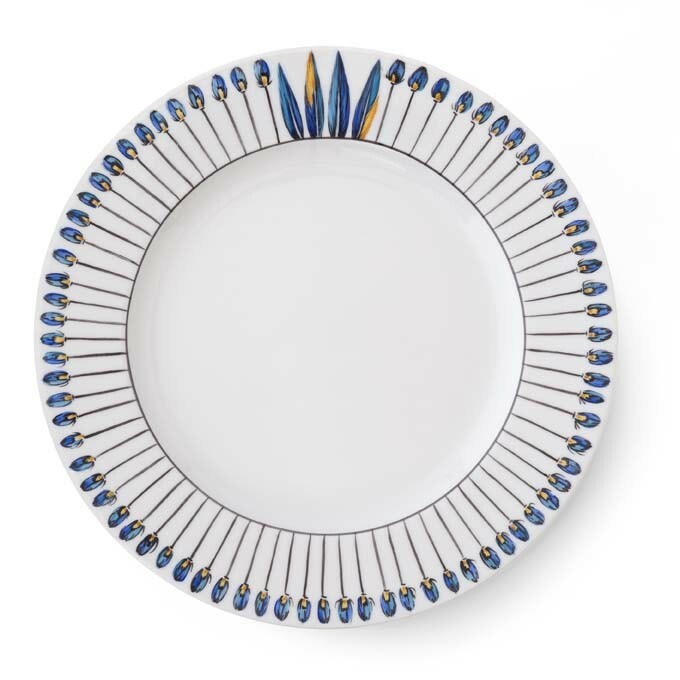 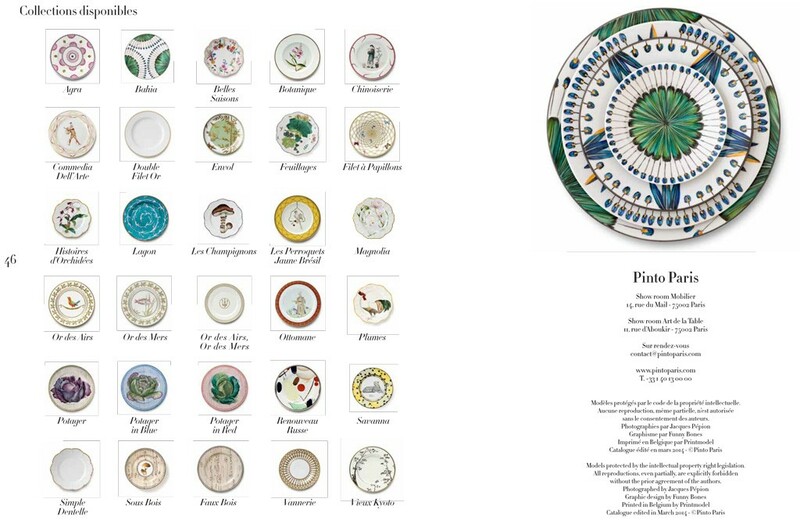 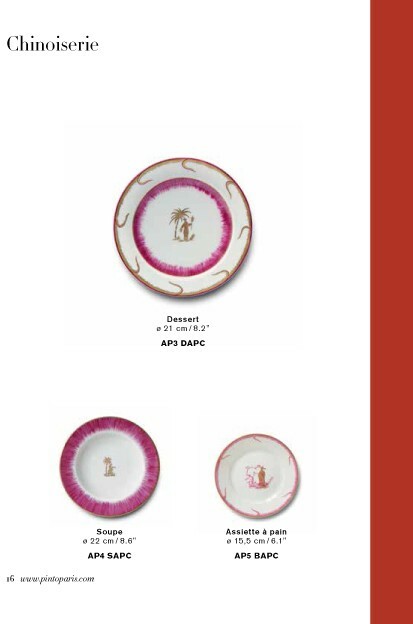 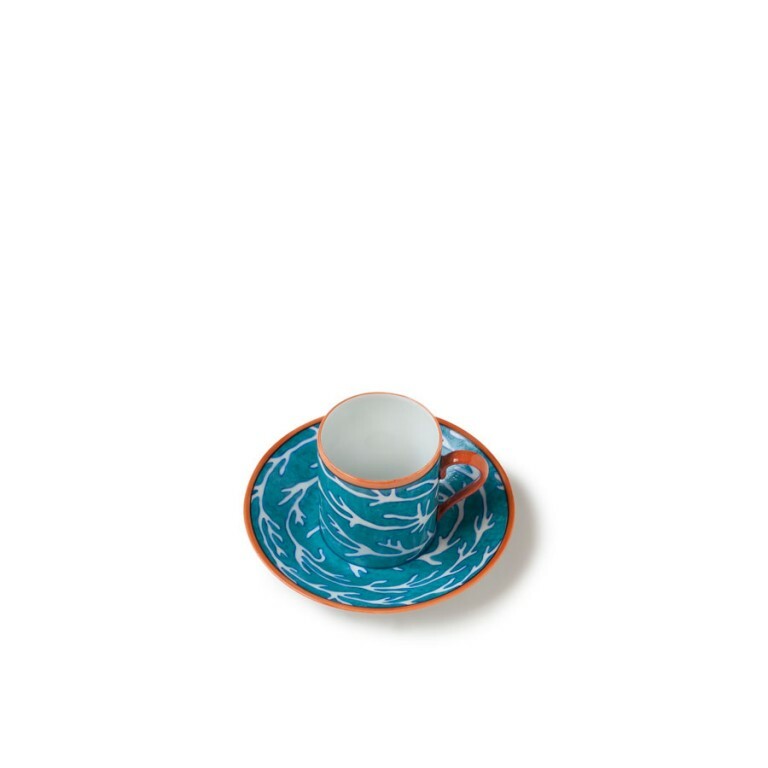 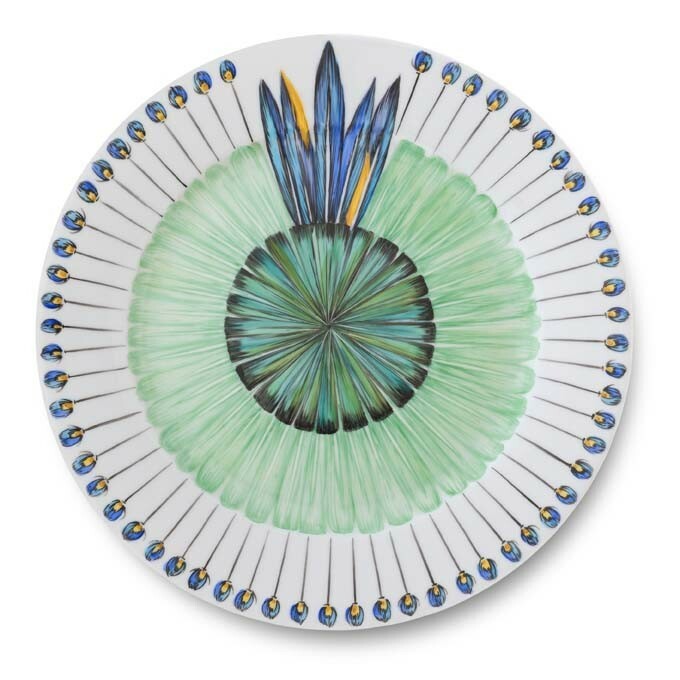 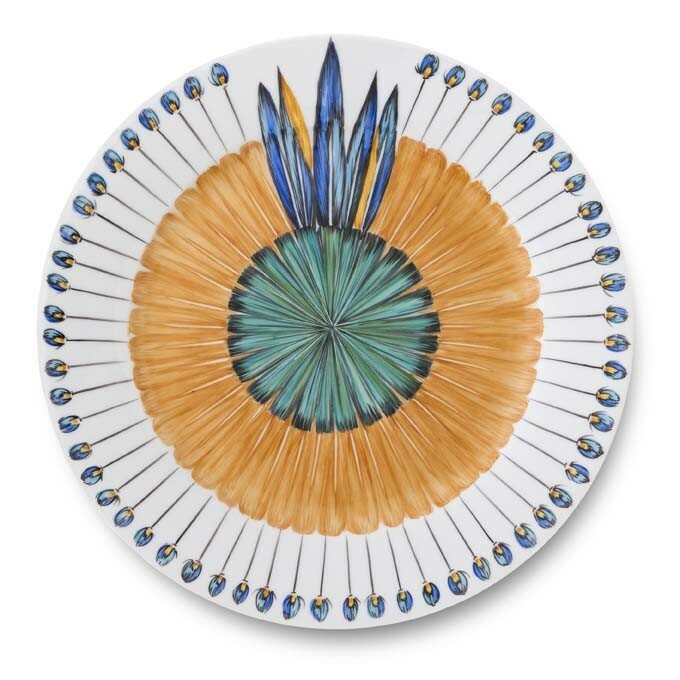 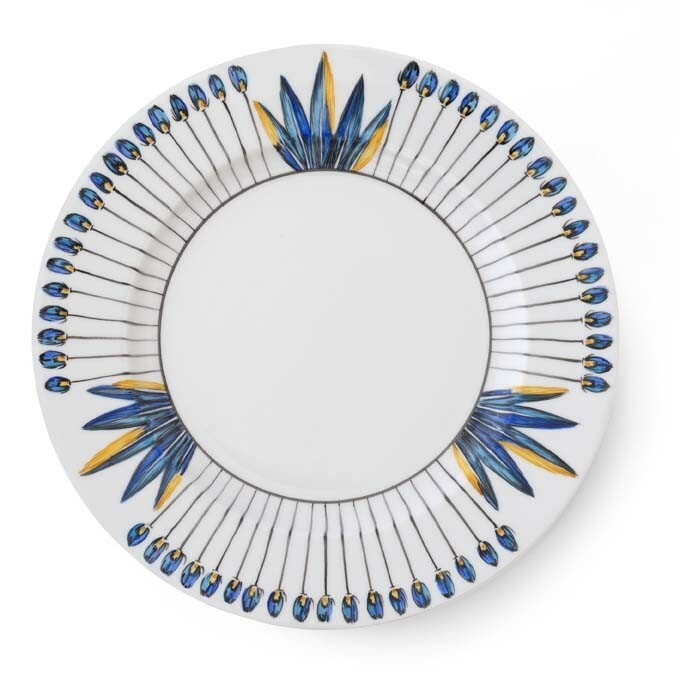 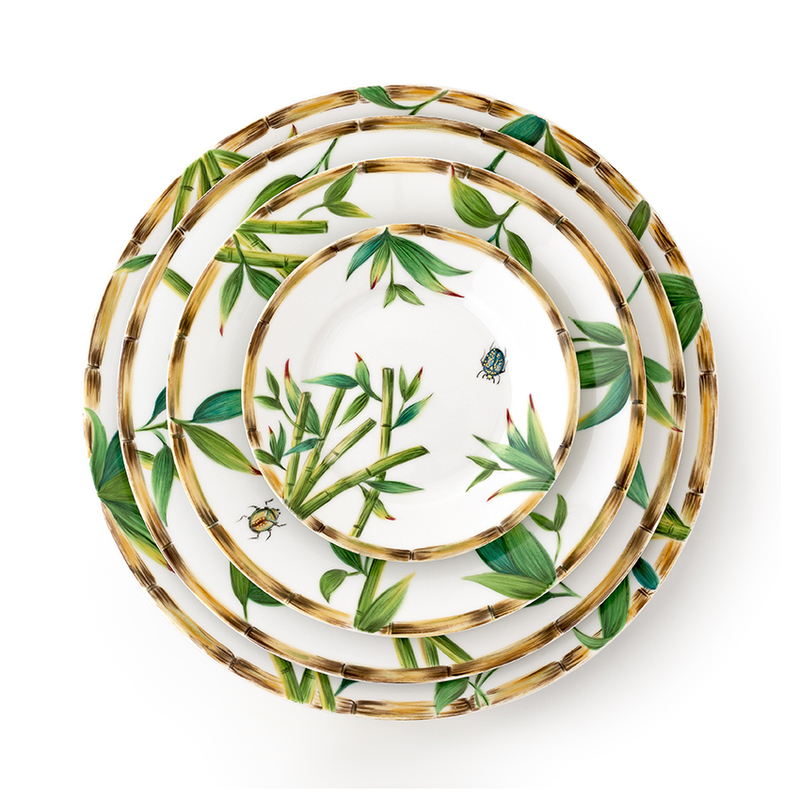 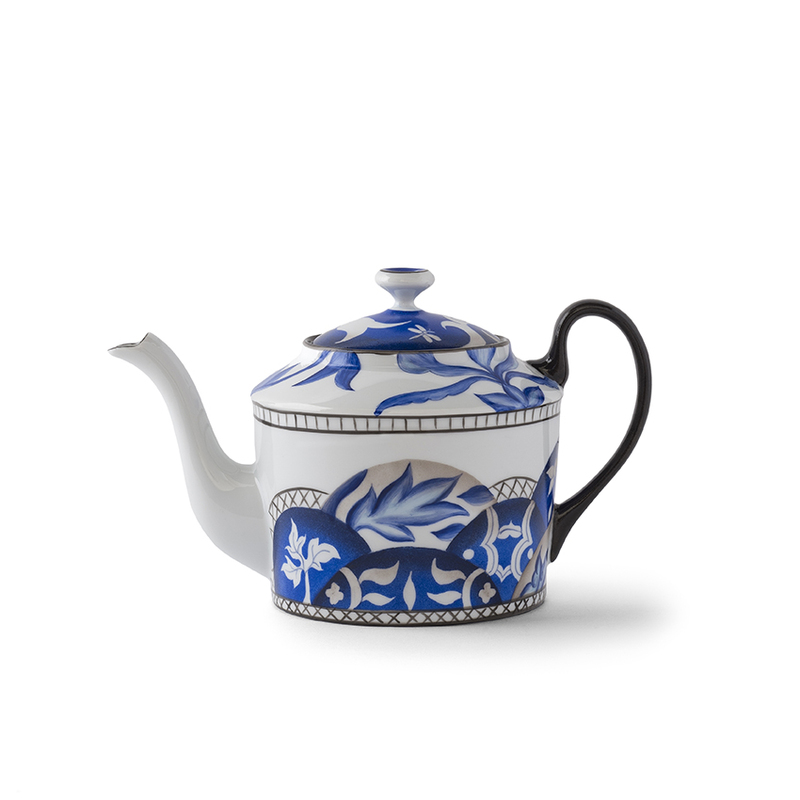 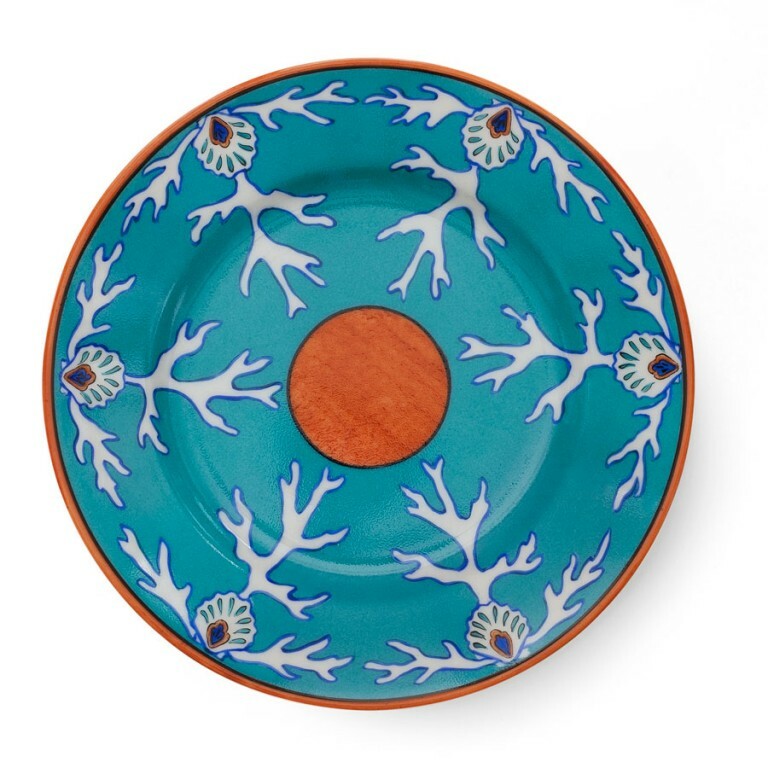 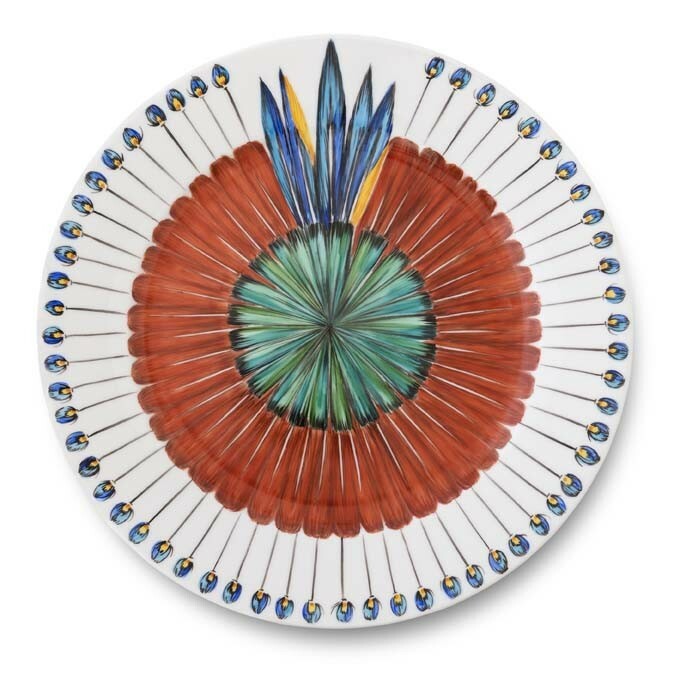 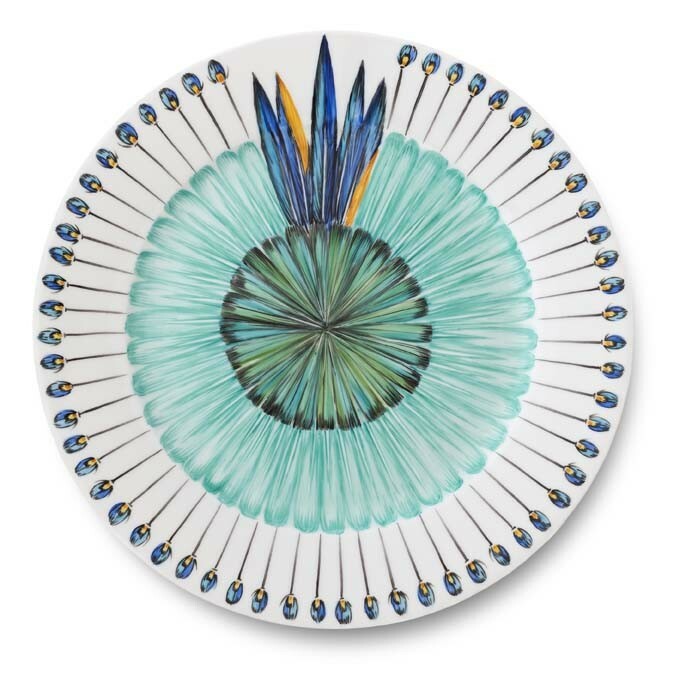 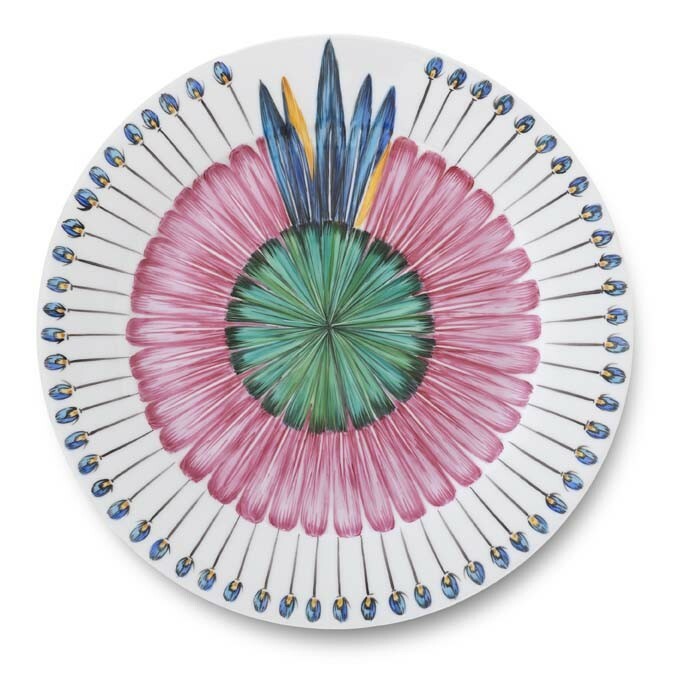 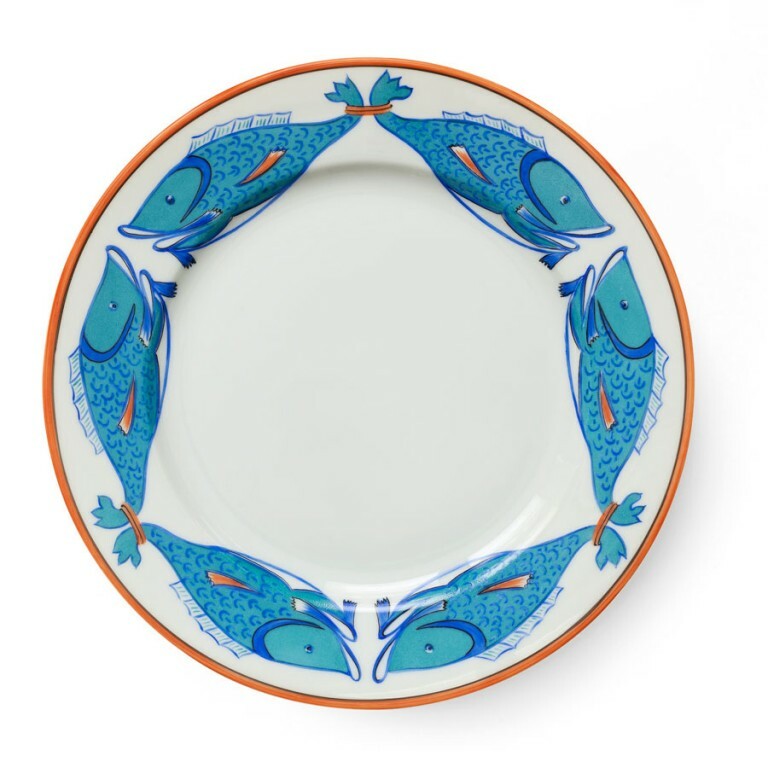 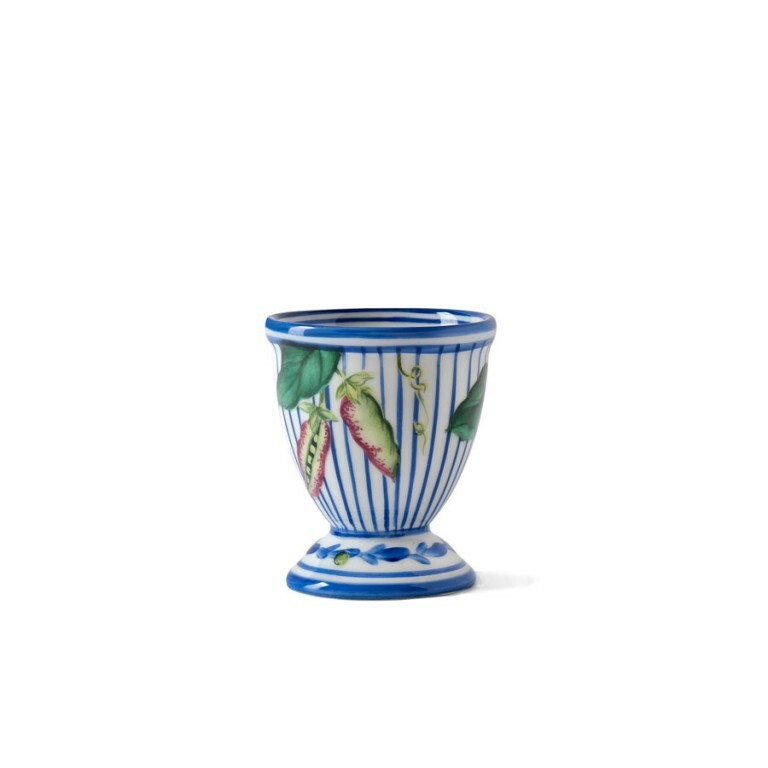 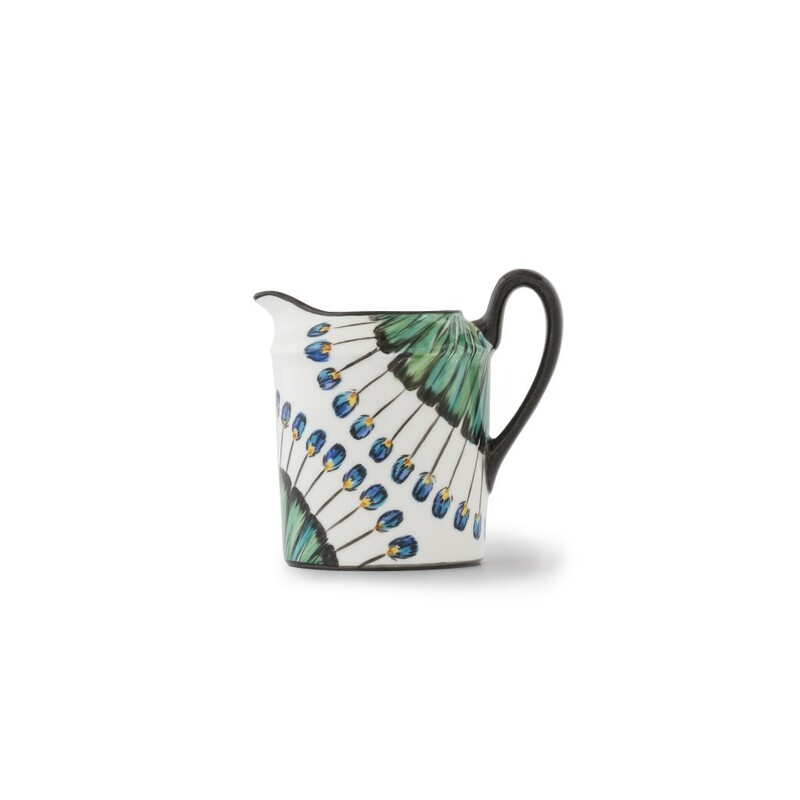 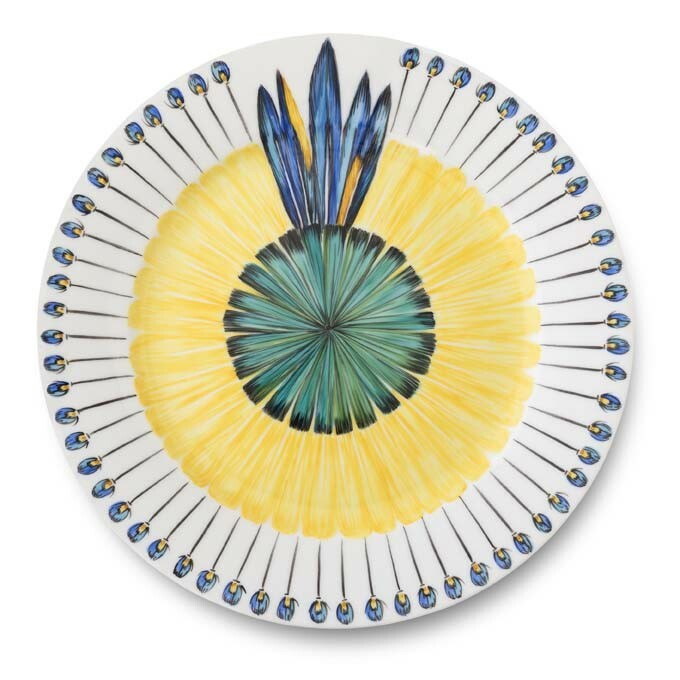 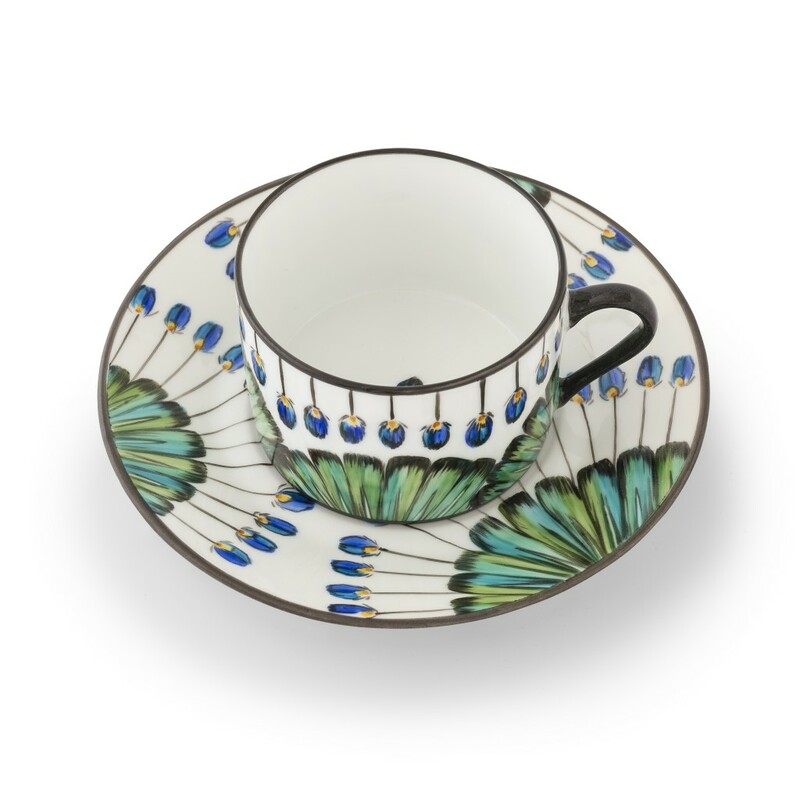 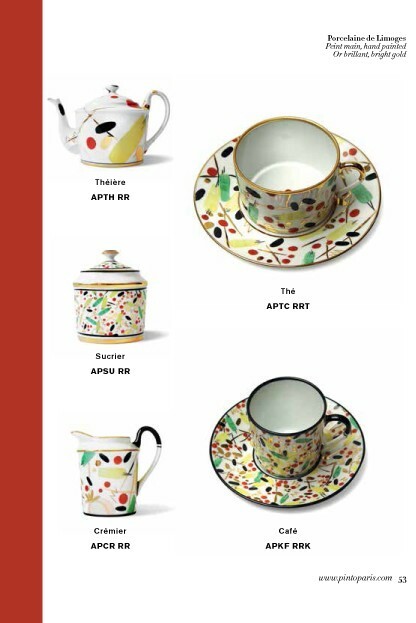 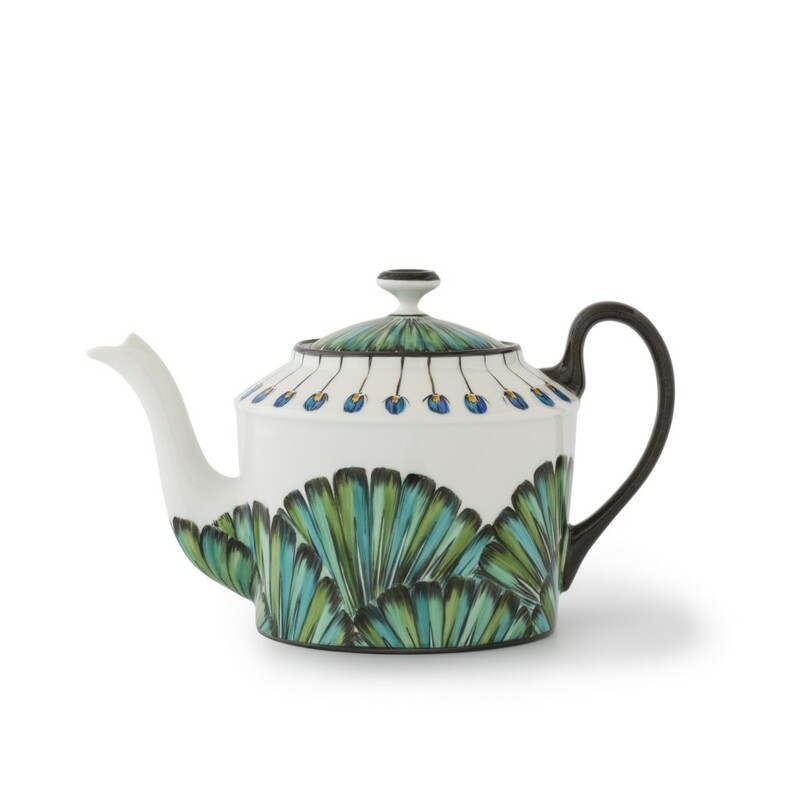 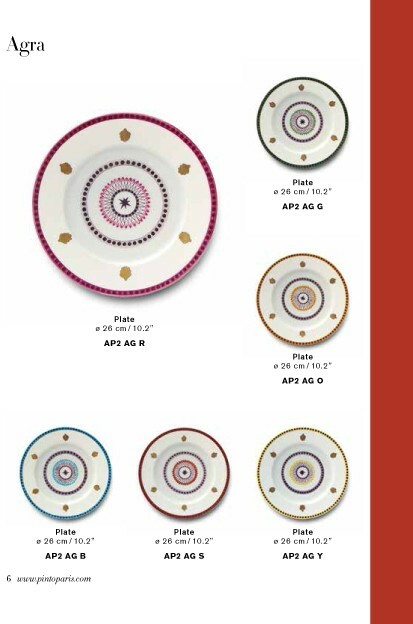 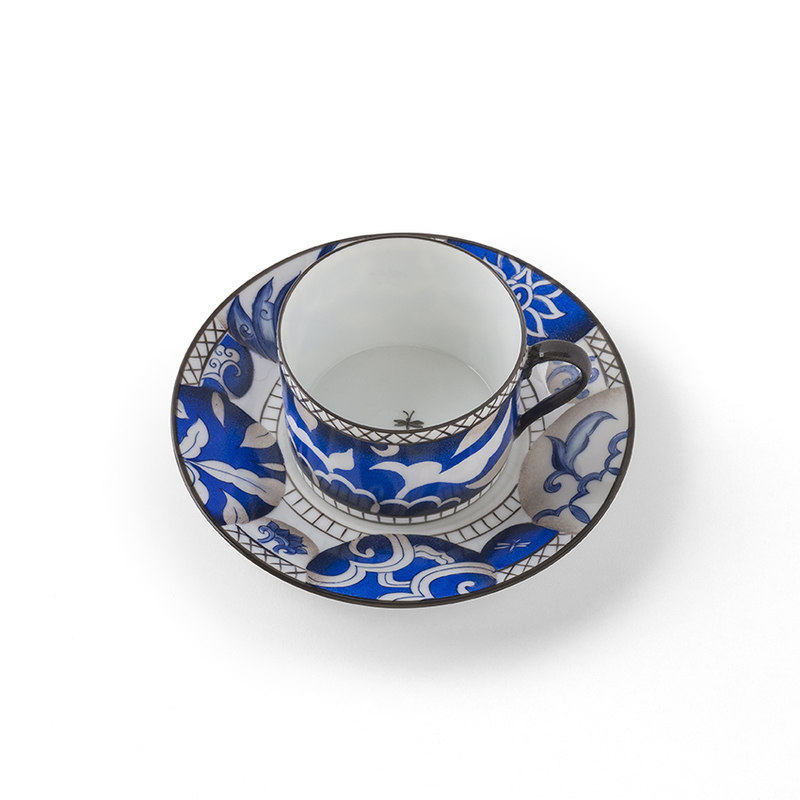 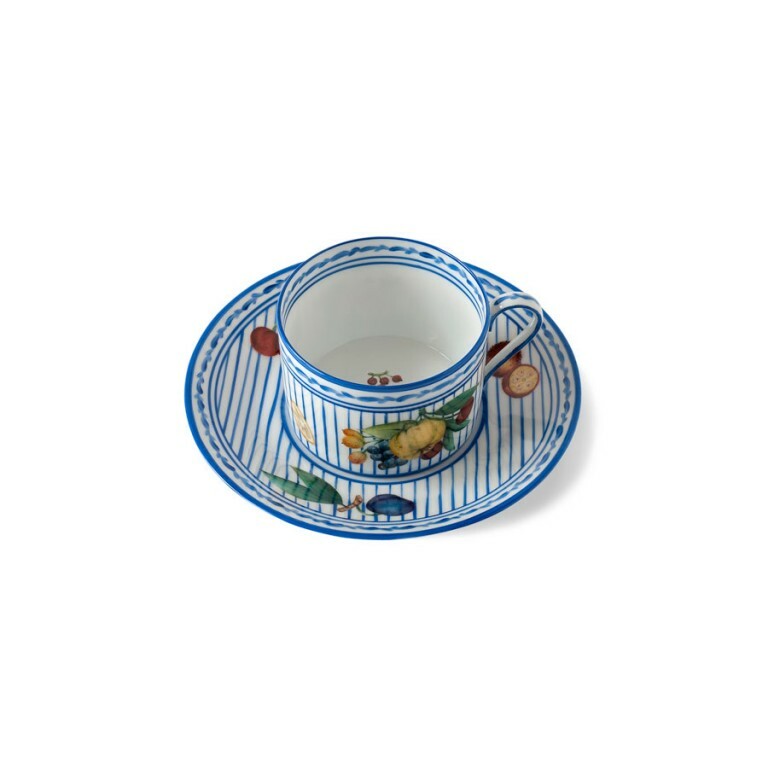 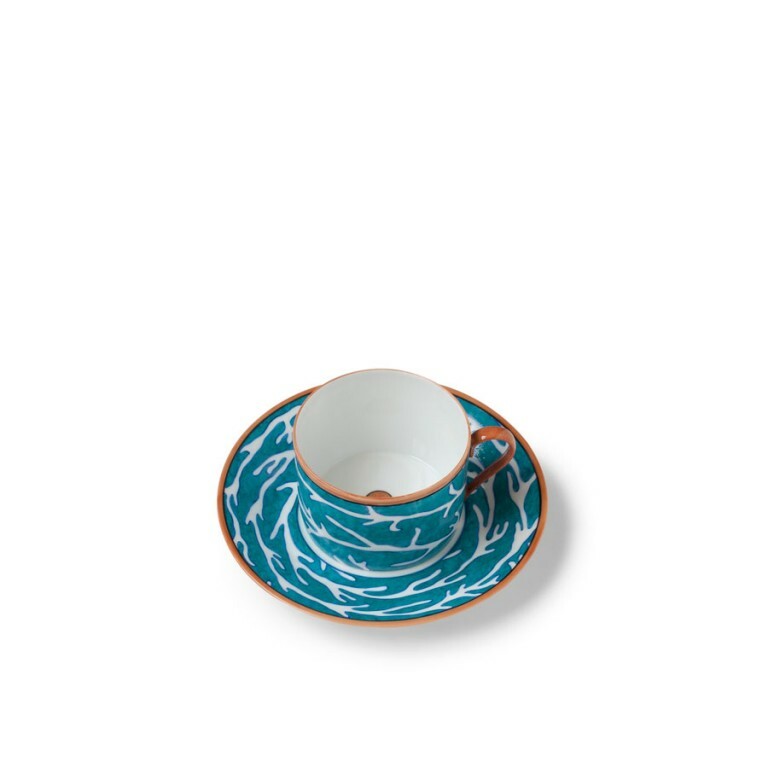 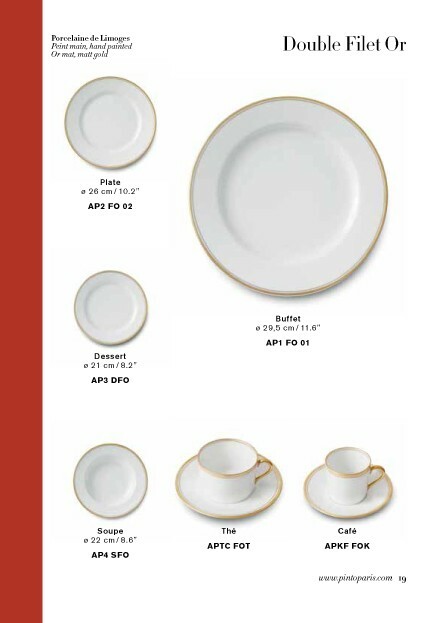 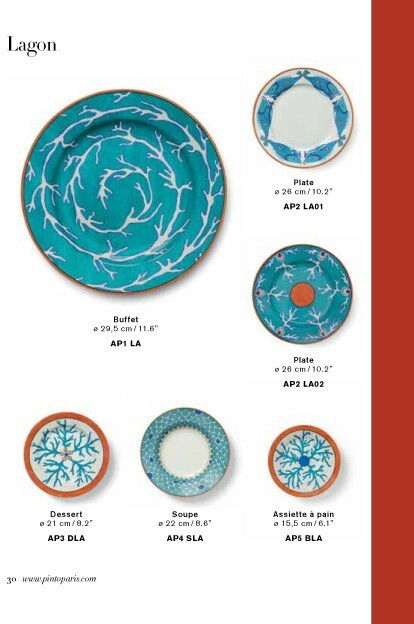 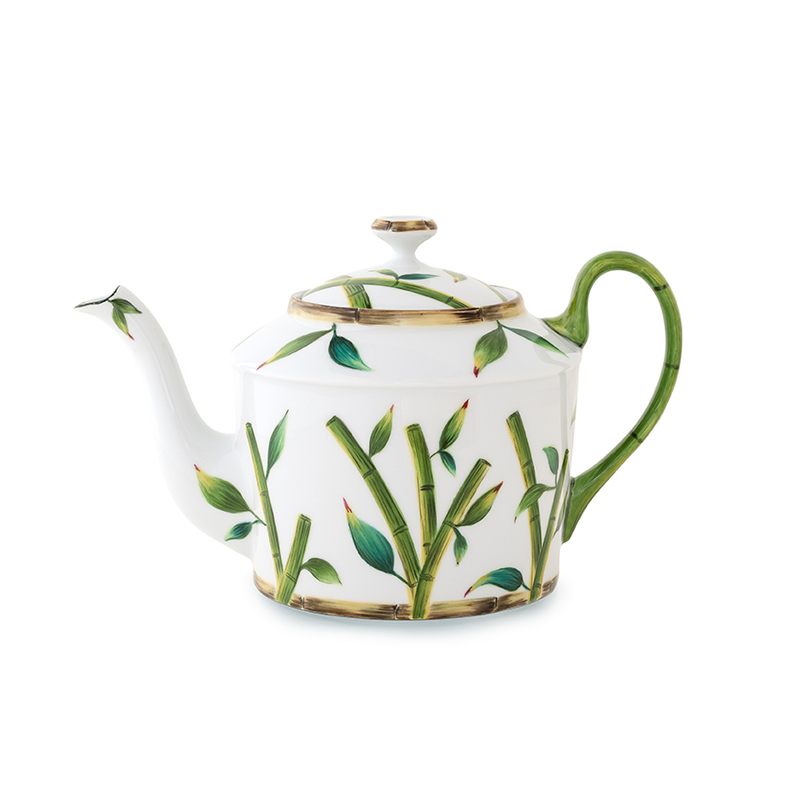 This year Brazil is honored on Pinto Paris’ new porcelain collection « Bahia ». Northern Brazil Amerindian ceremonial feathered head pieces have been reinvented in luminous and iridescent colors on the six presentation plates. 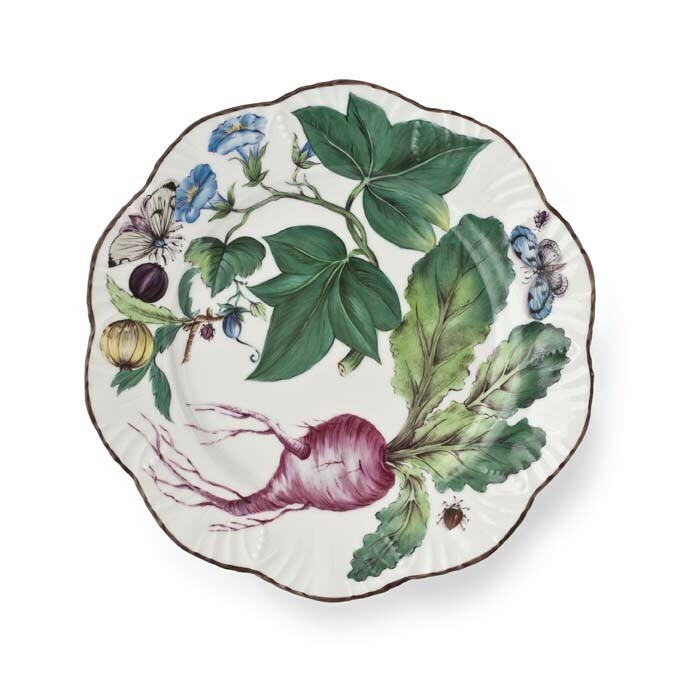 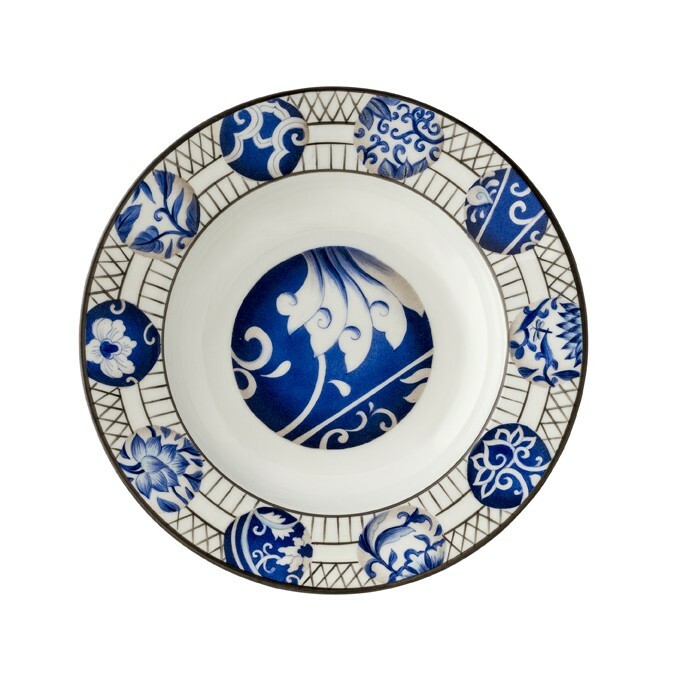 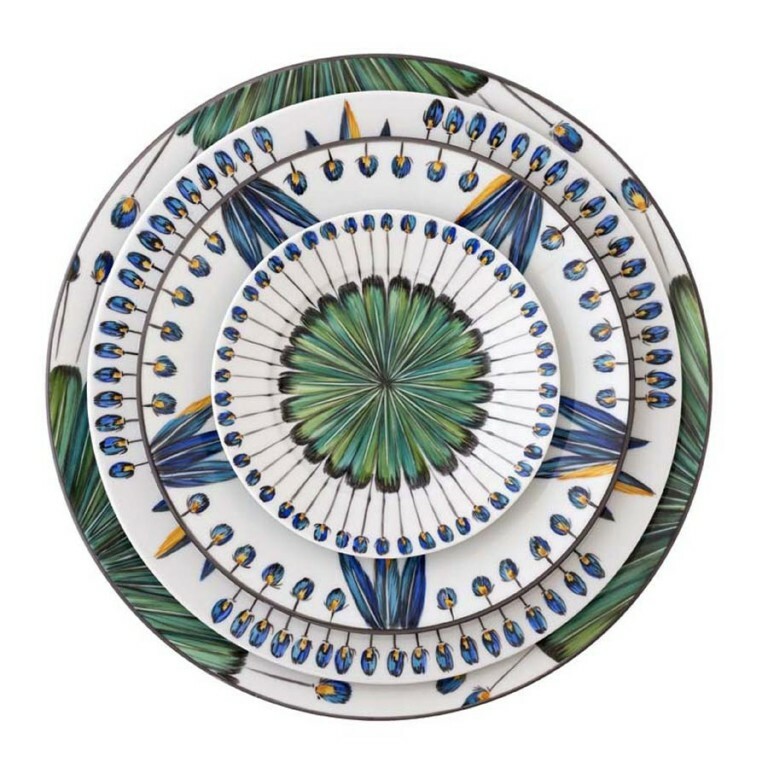 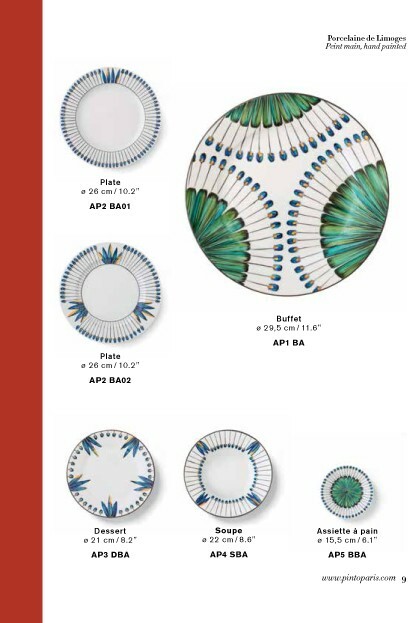 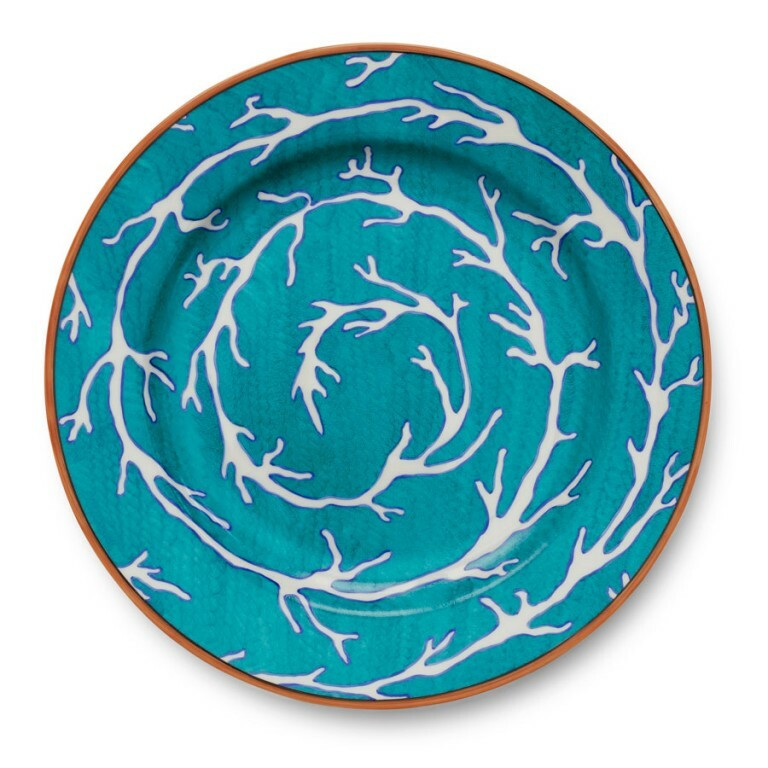 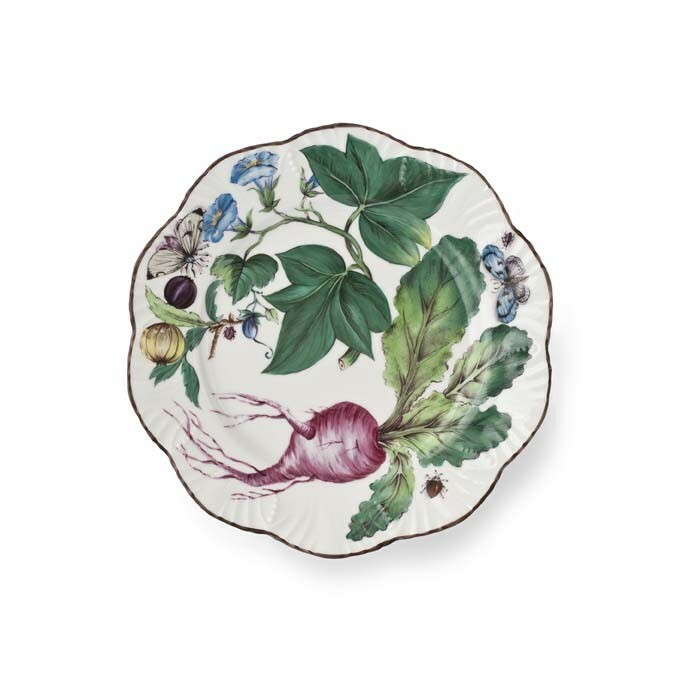 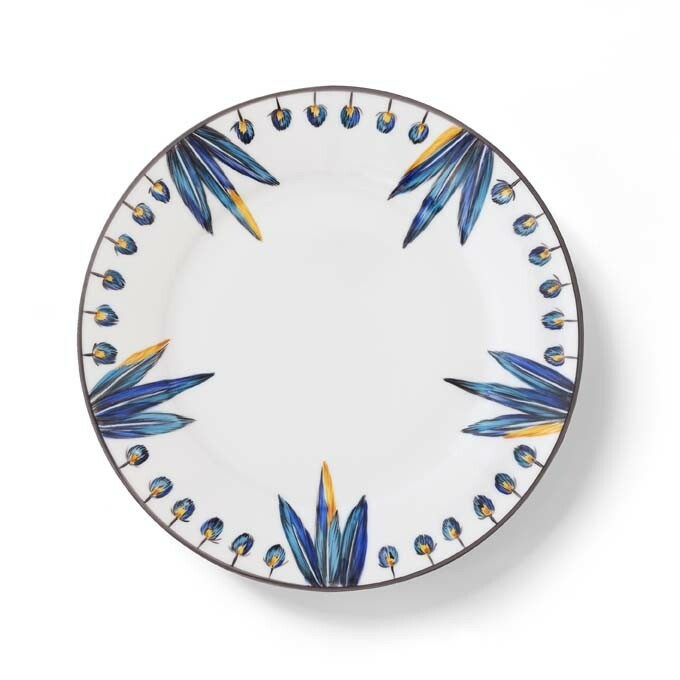 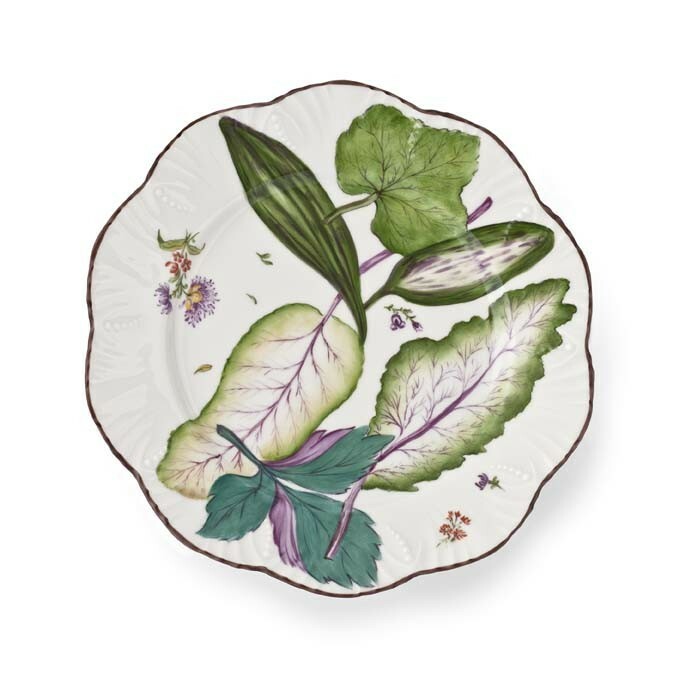 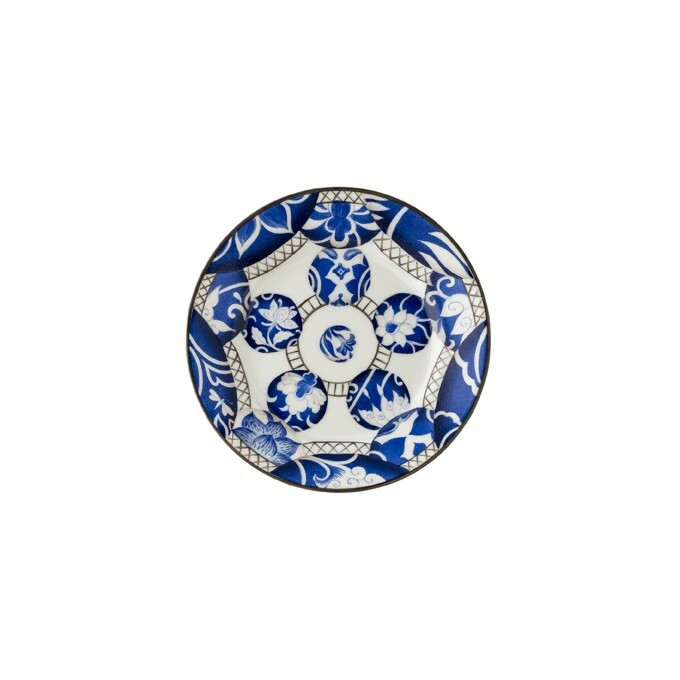 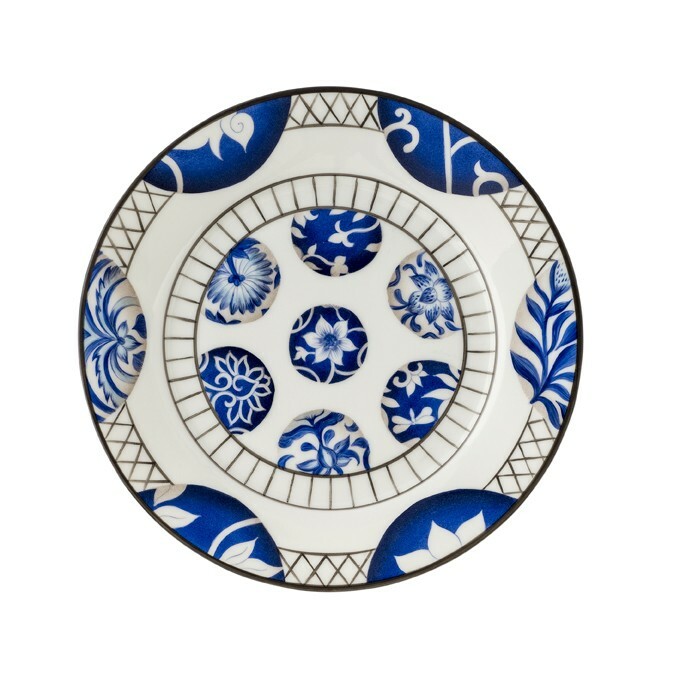 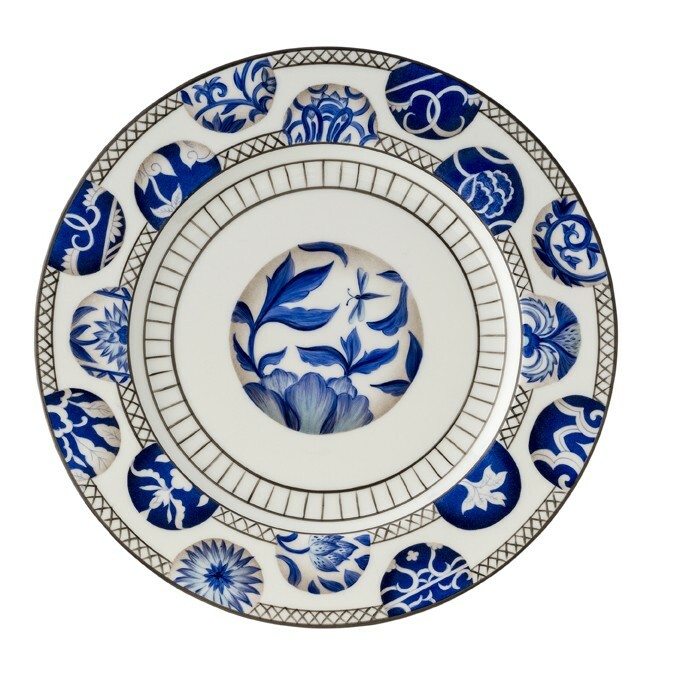 This same pattern has also been repositioned with dominating blues and greens for a complete set from the presentation plate down to the bread plate all hand painted on Limoges porcelain. 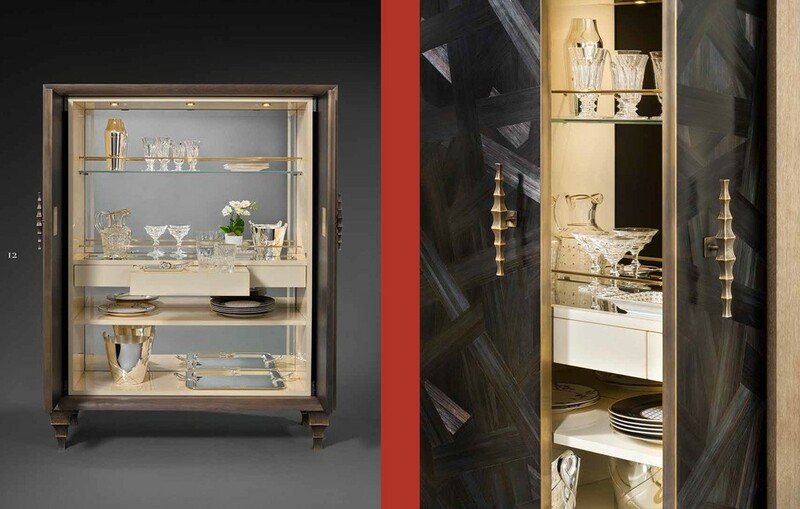 With the Archea collection, Pinto Paris returns to the fundamentals: simplicity of shapes, sophistication of materials, generosity and comfort. 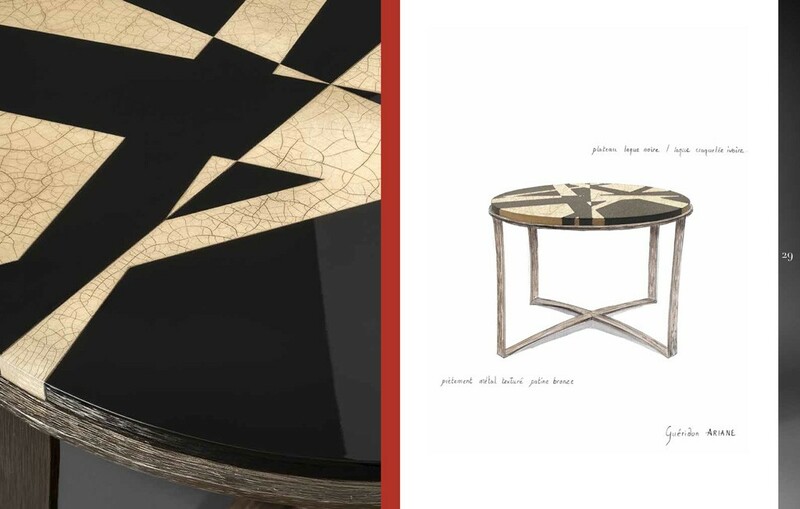 Archea brings to life a family of Gods and primitive heroes who breath into this new line their strengh and personalities. 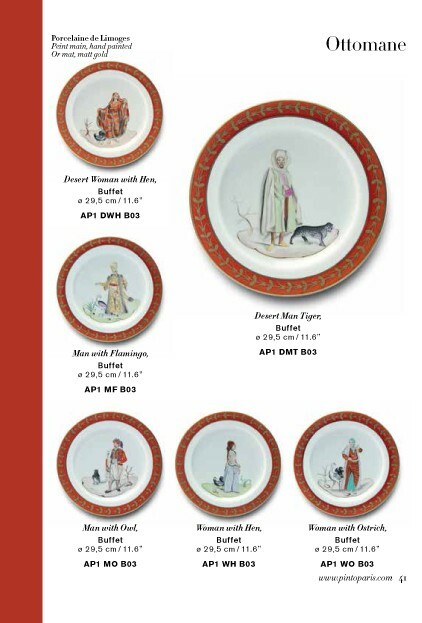 The Vulcain collection catalog is available on request. 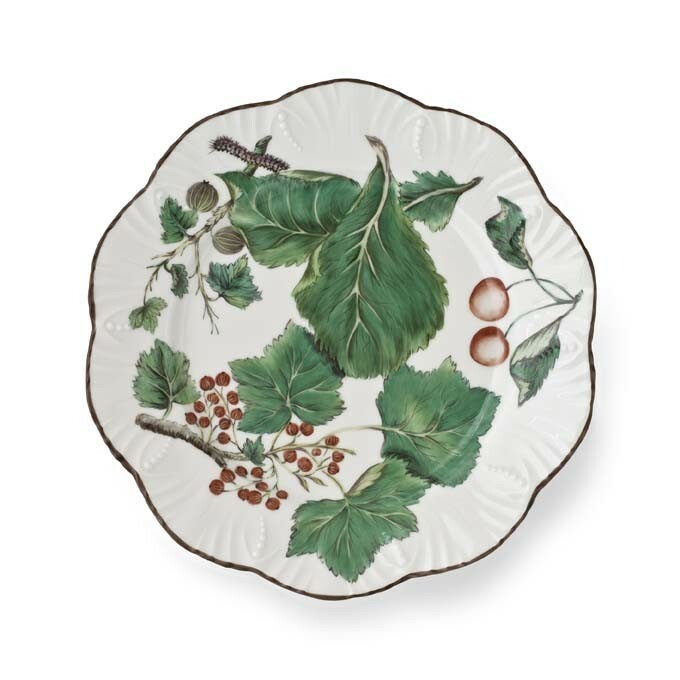 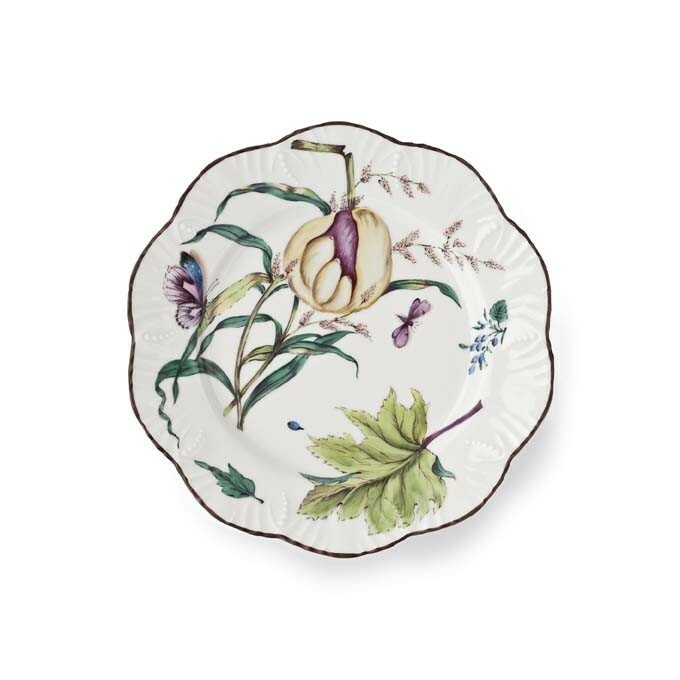 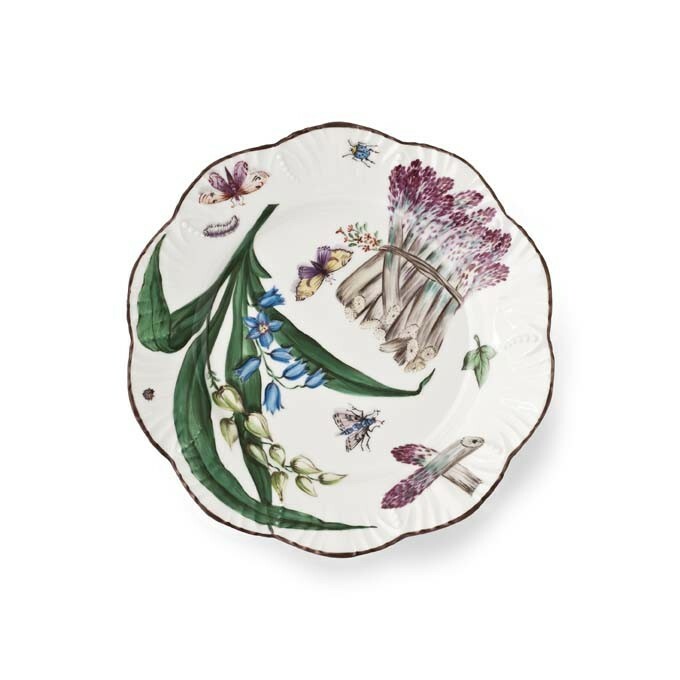 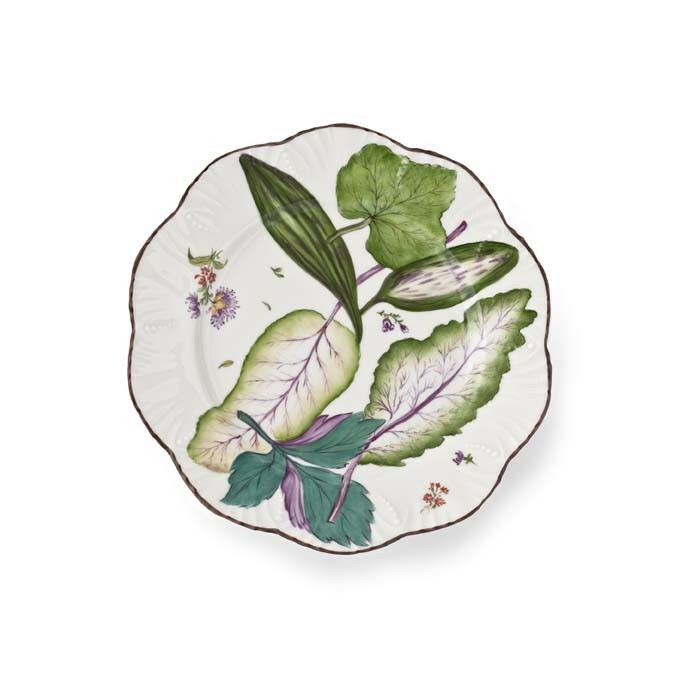 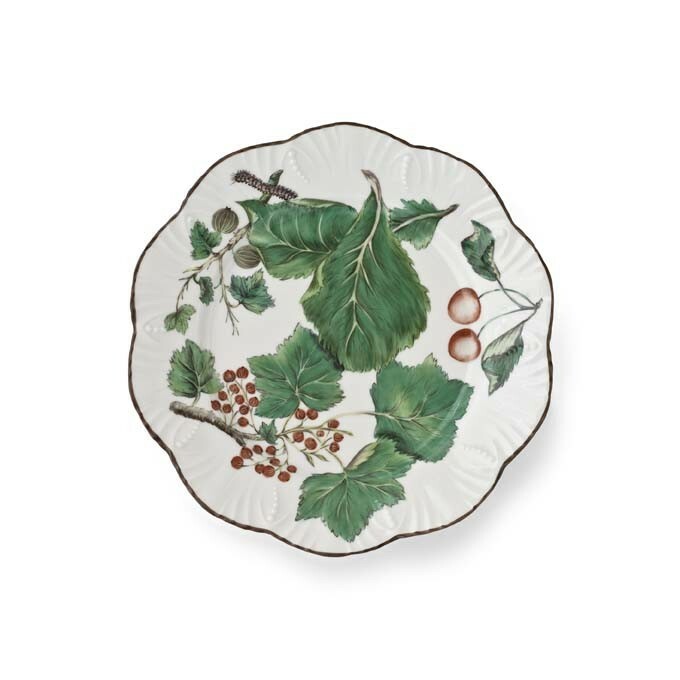 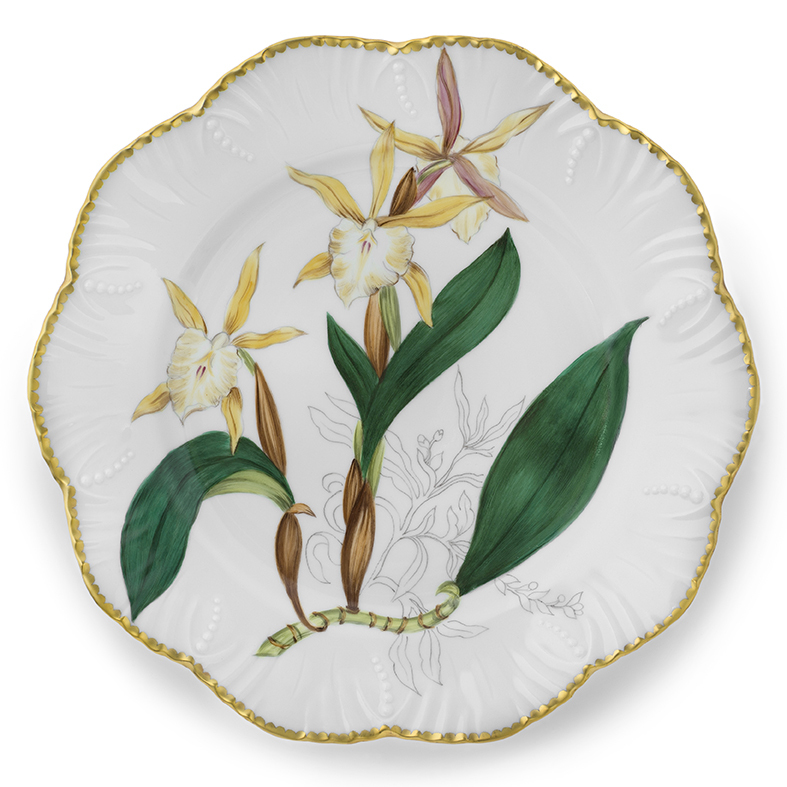 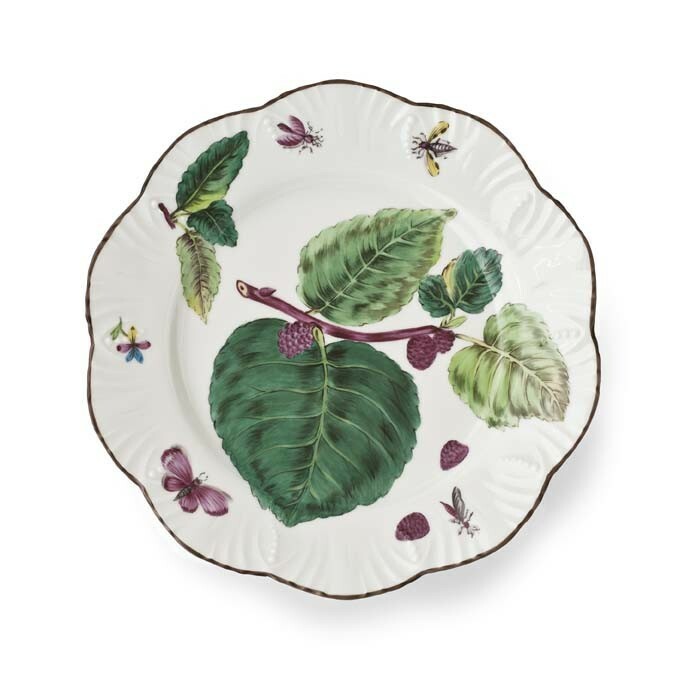 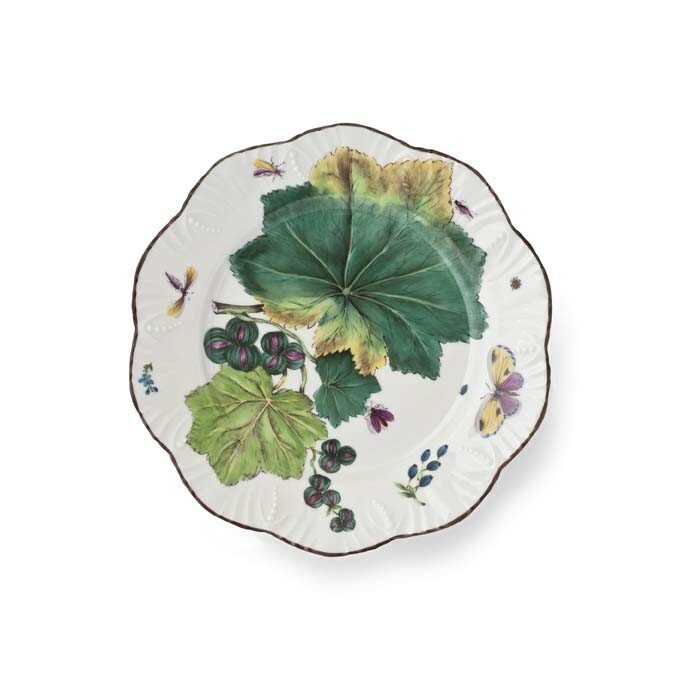 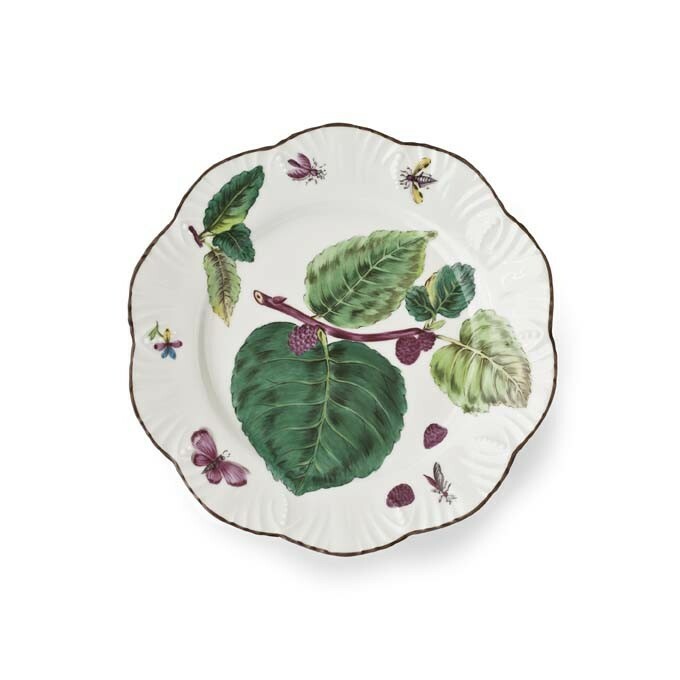 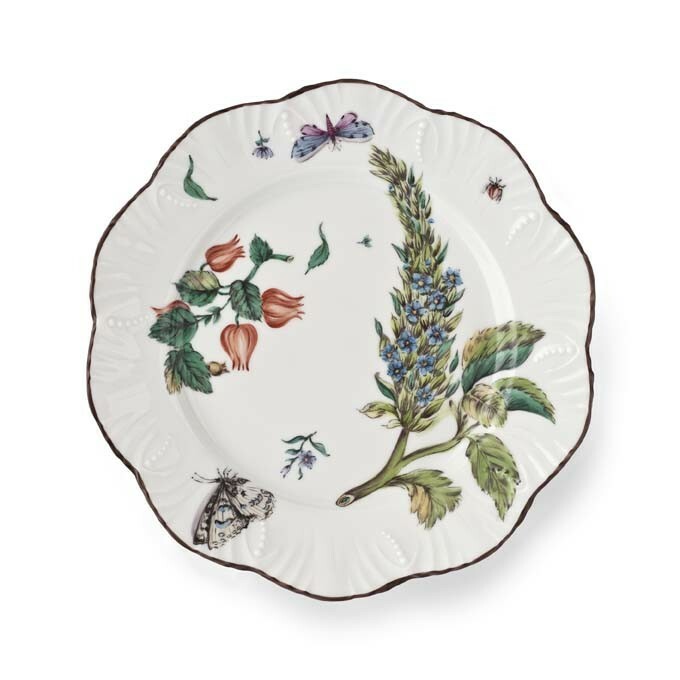 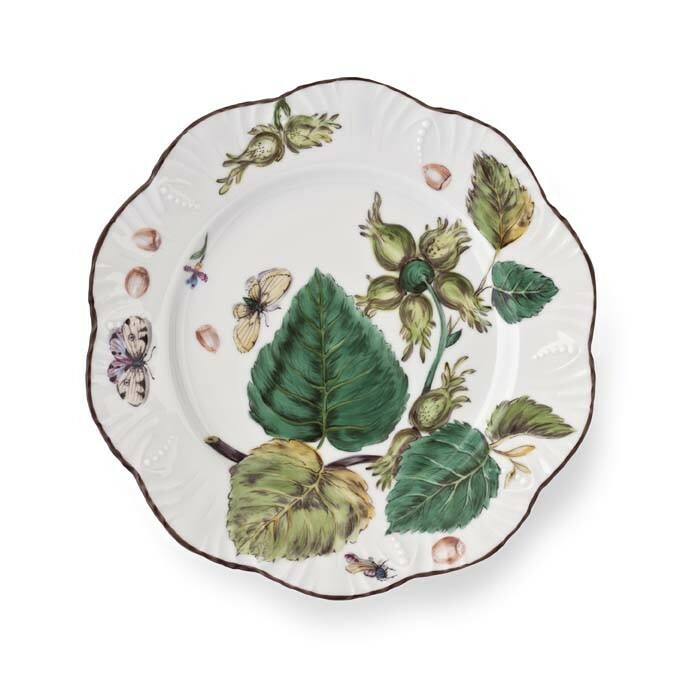 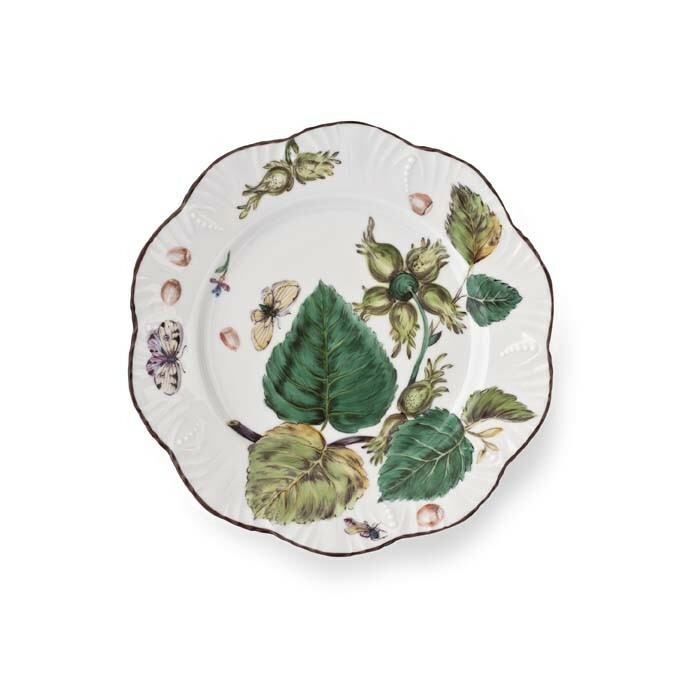 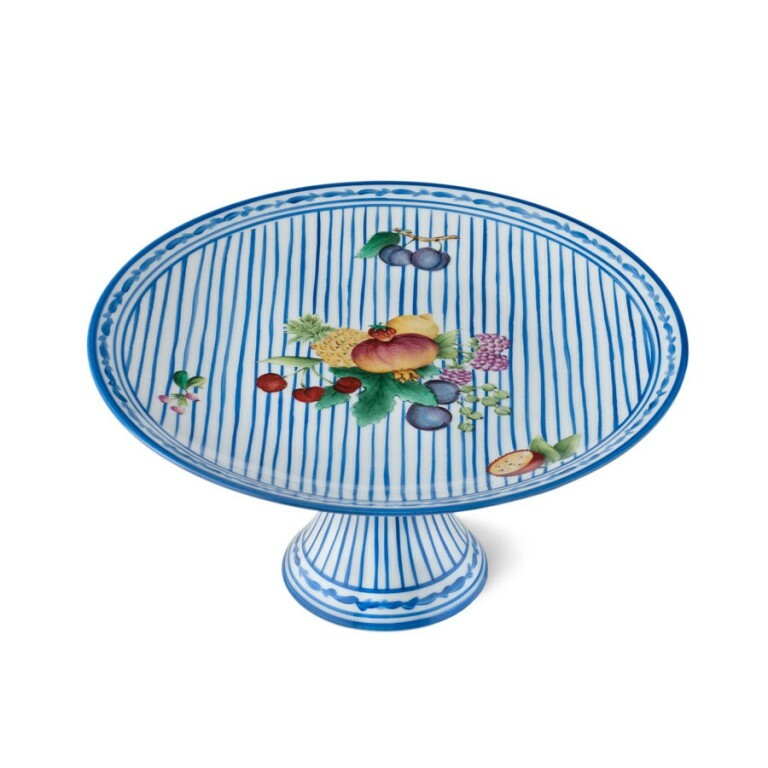 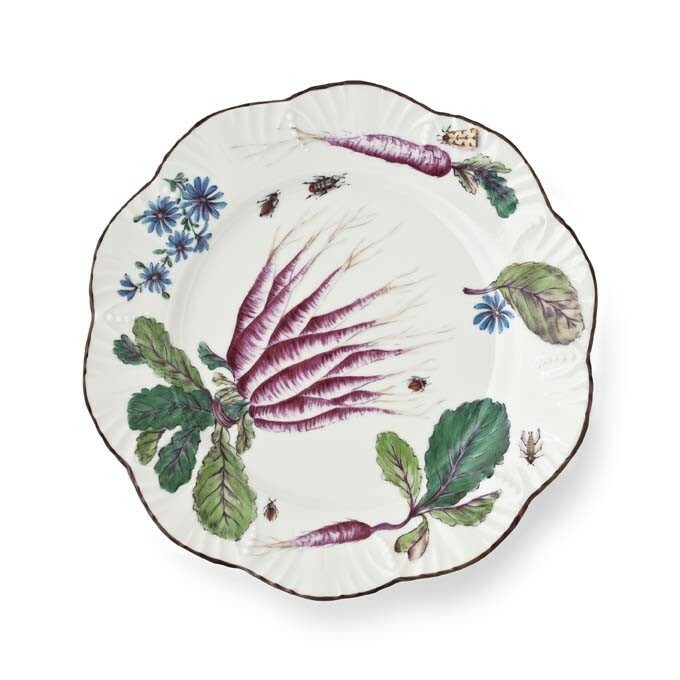 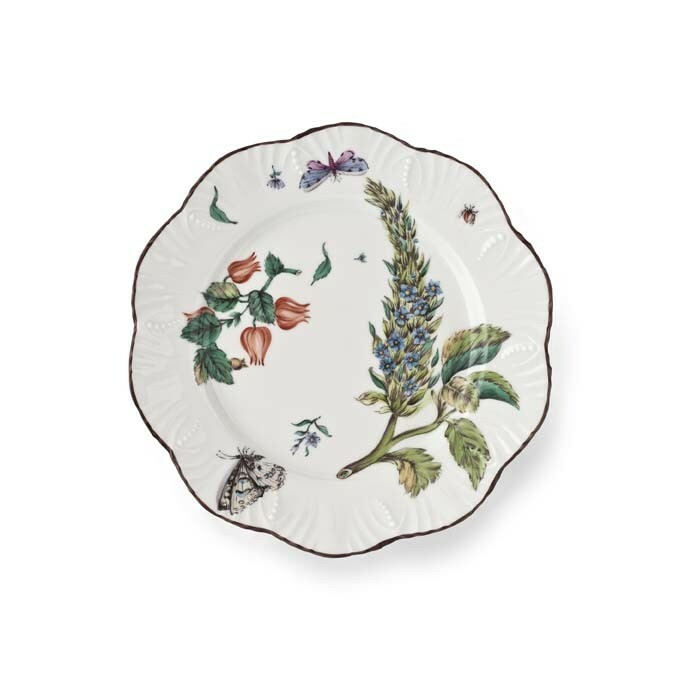 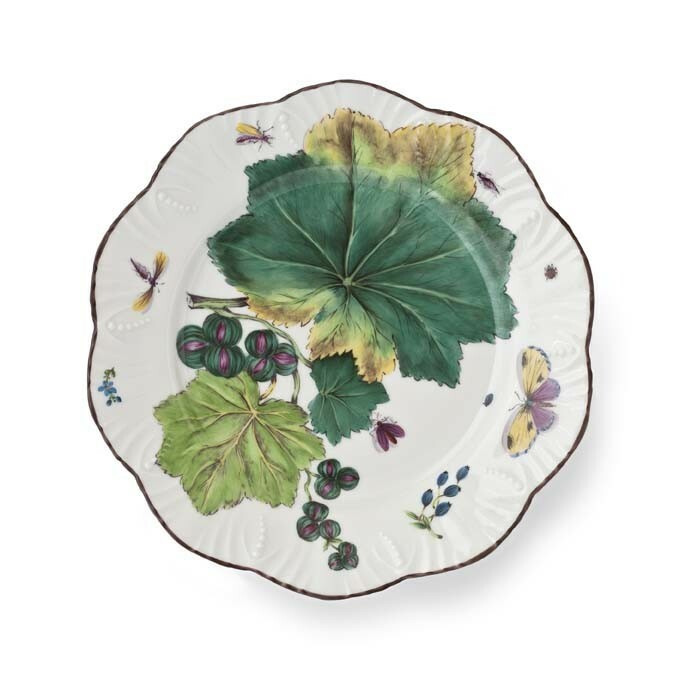 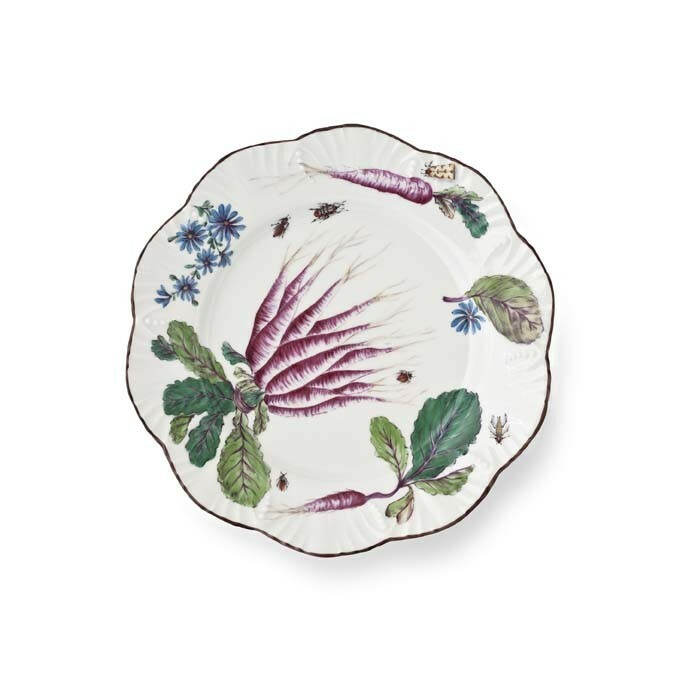 A knowledgeable collector of antique porcelain, Alberto Pinto shares his latest heart throb for an 18th century English service, which he brings to life for us with twelve different decors on dinner and dessert plates, completed with a soup dish. 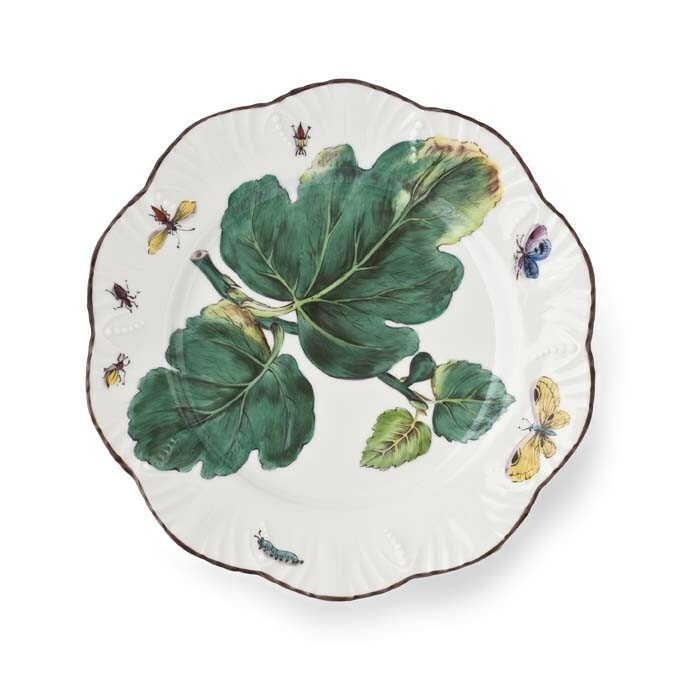 Leaves, flowers, berries, fruits, vegetables and insects, juxtaposed in this delicate series, evoking the precision of botanical boards as much as the poetry of an herbal garden. 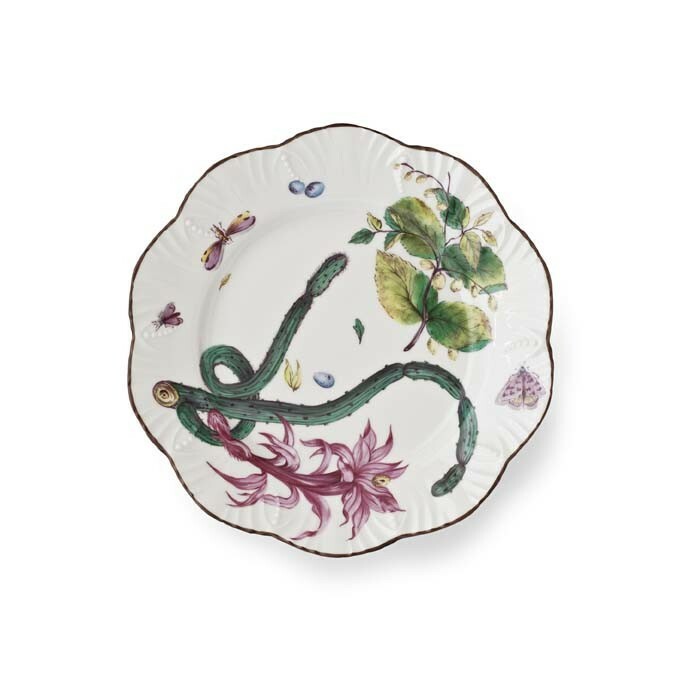 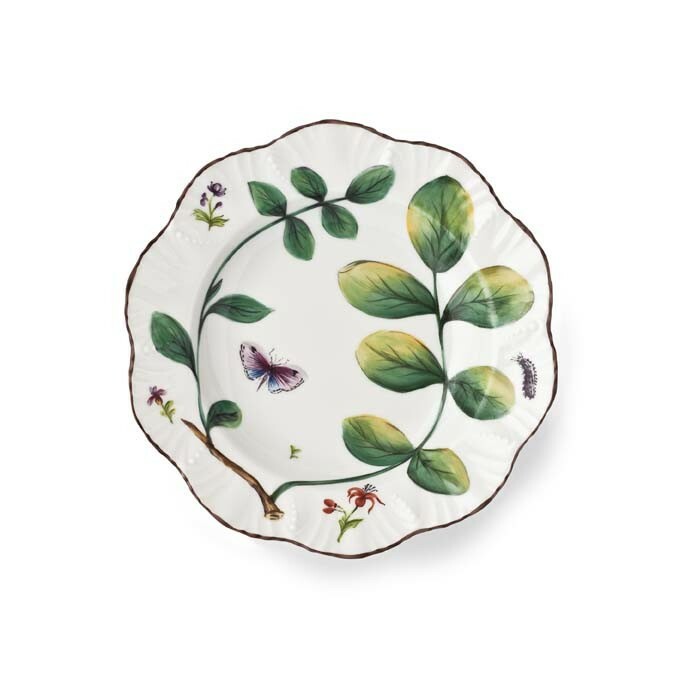 Hand painted on Limoges porcelain, renewed with the emotion and the inimitable grace of artistic treatment, tied with the master technique and the immense talents of our artists, giving to each the character of a unique master-piece. 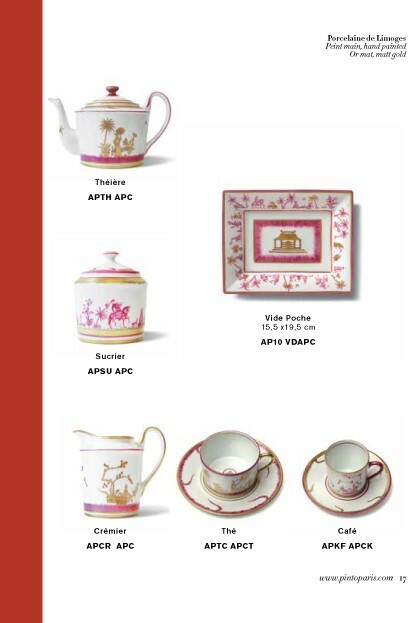 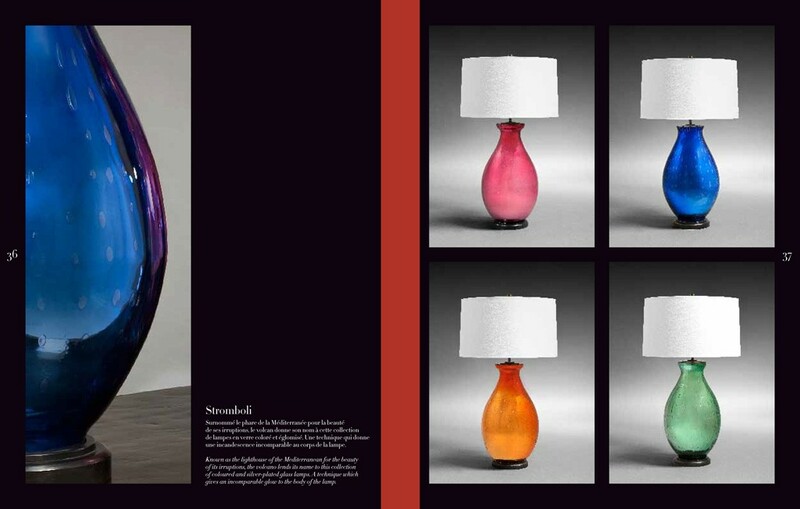 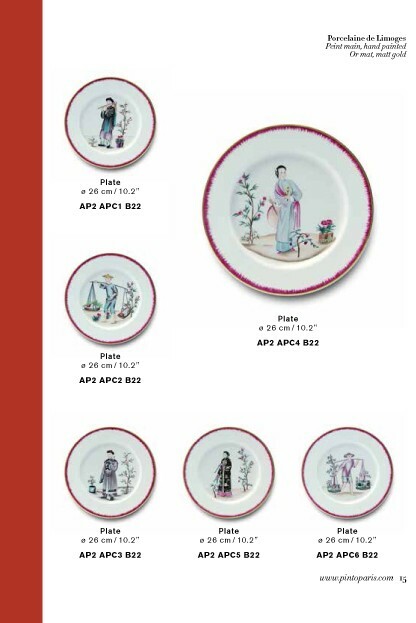 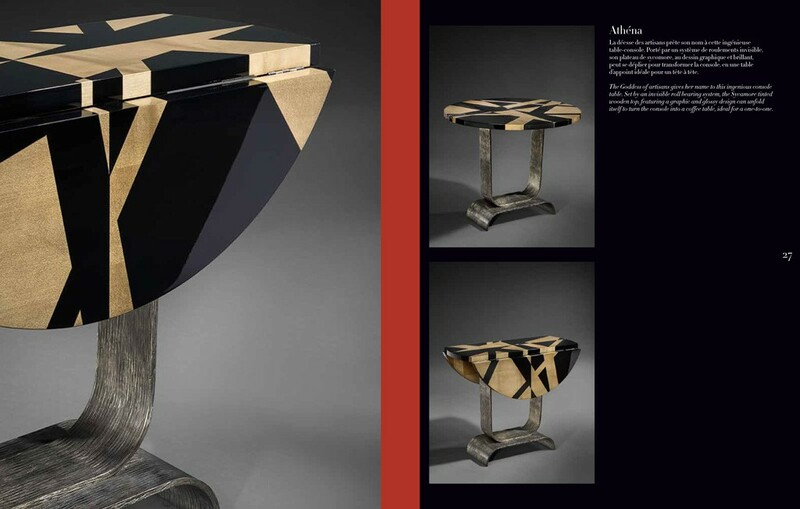 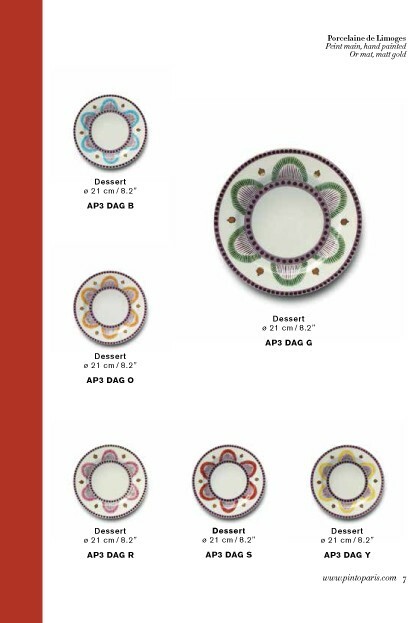 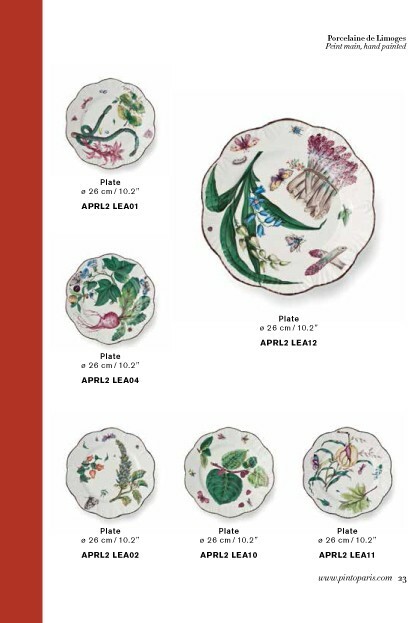 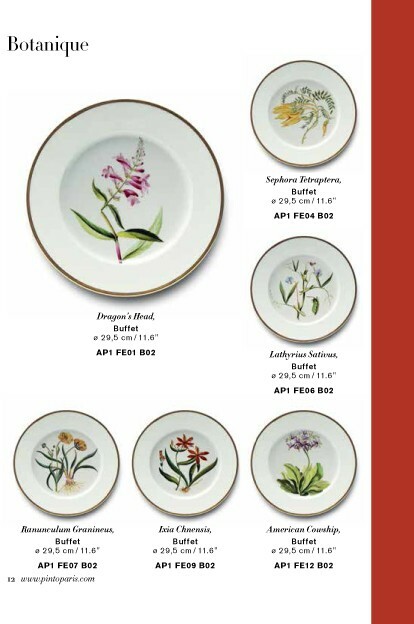 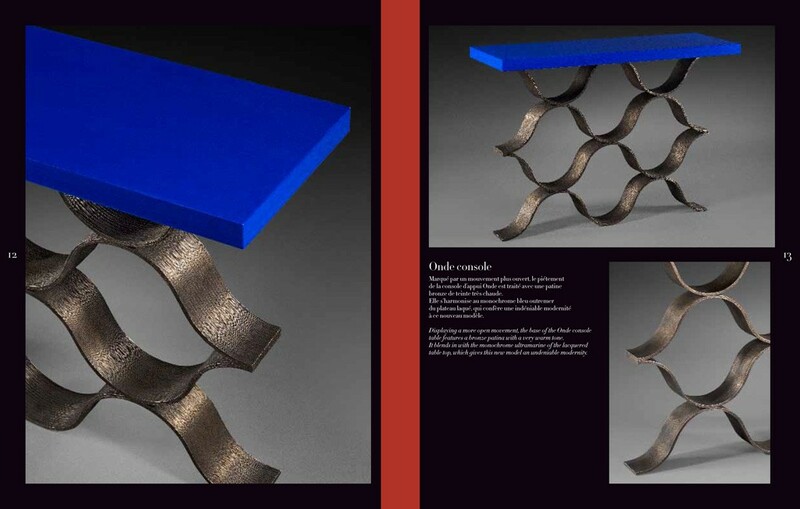 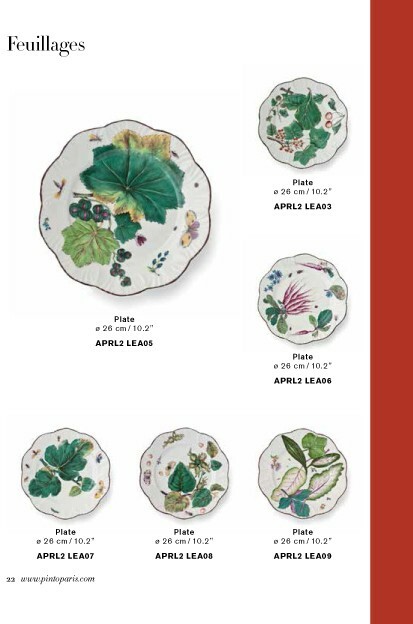 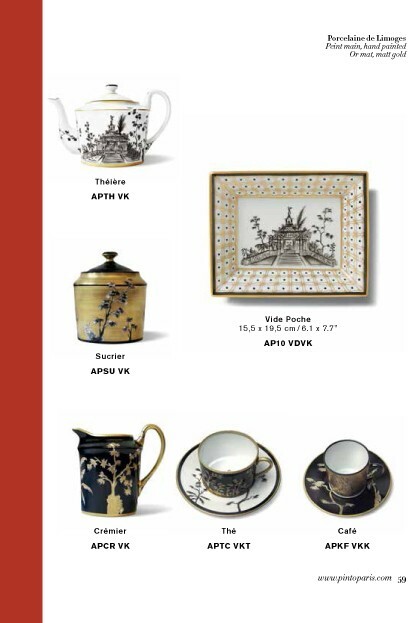 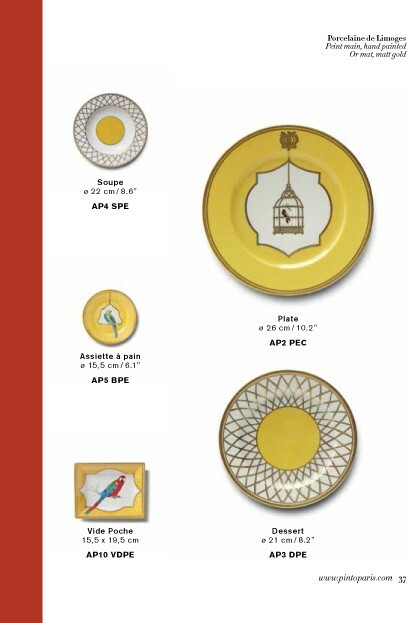 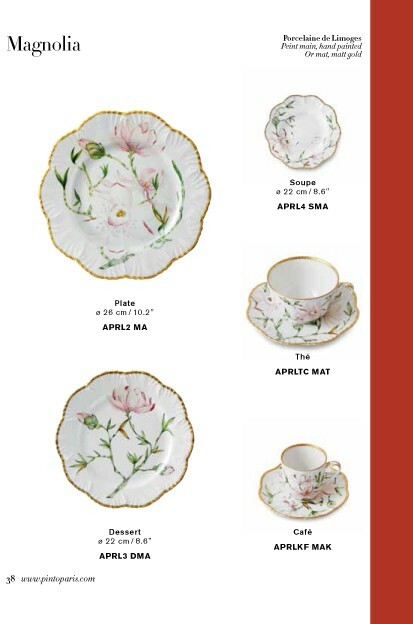 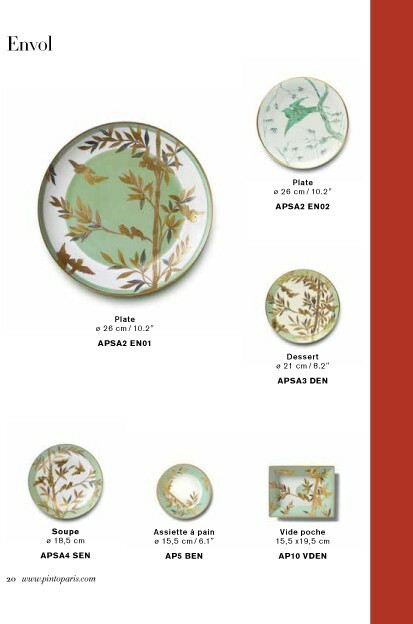 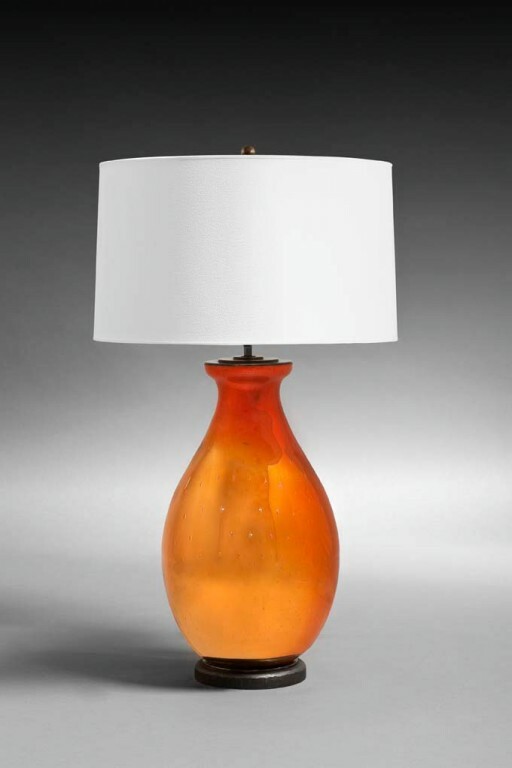 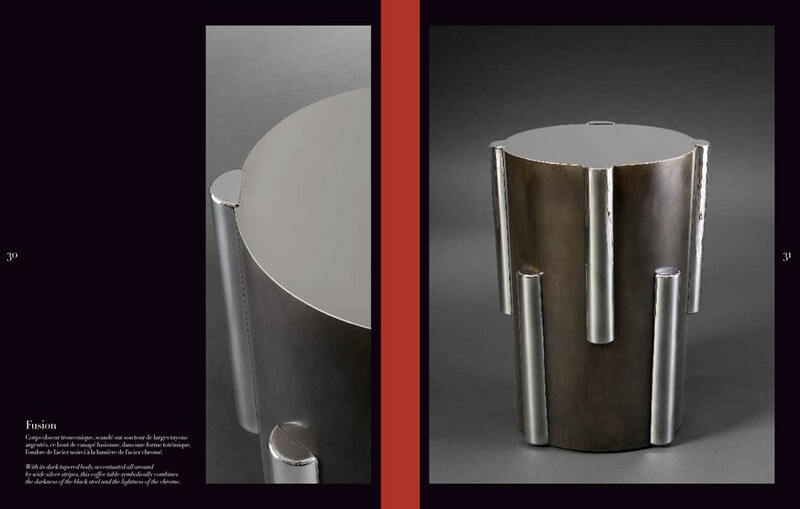 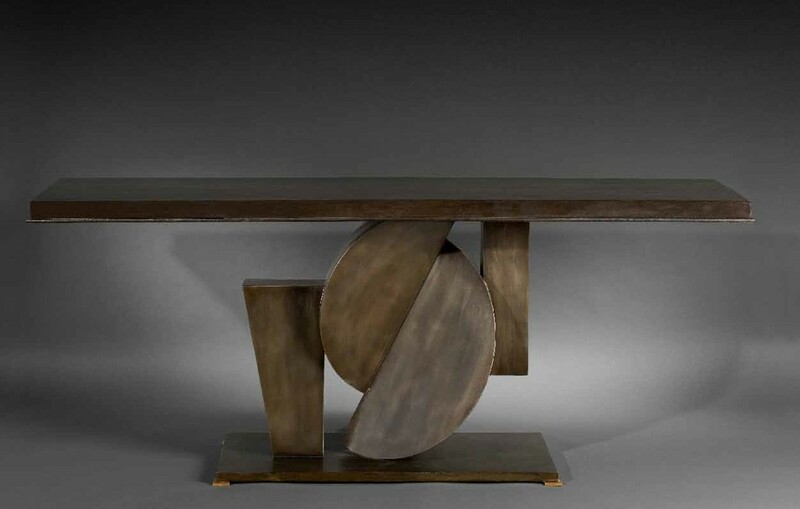 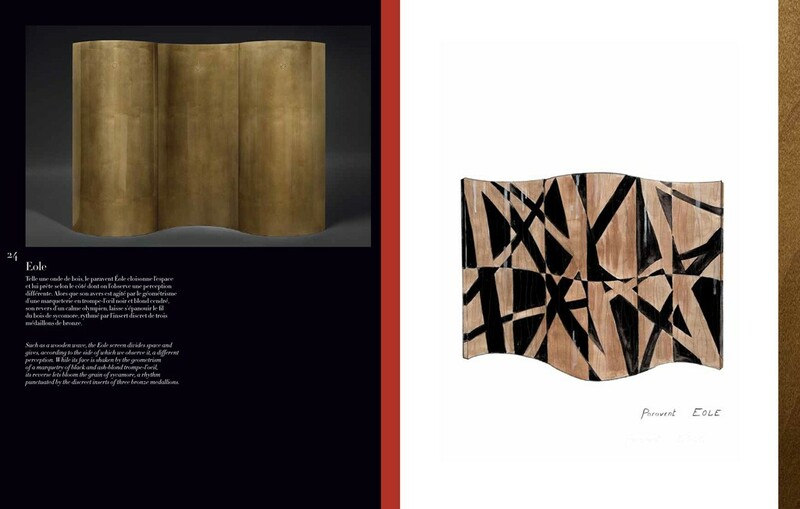 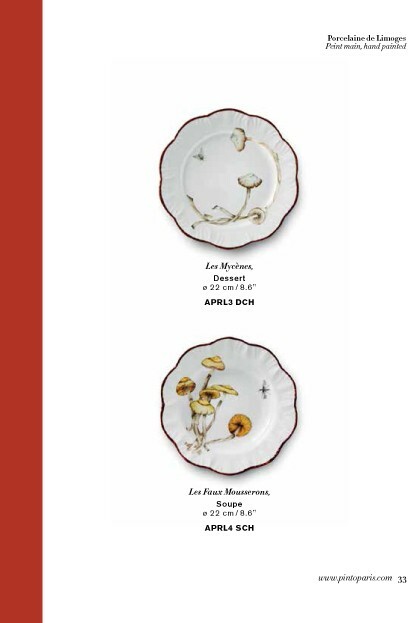 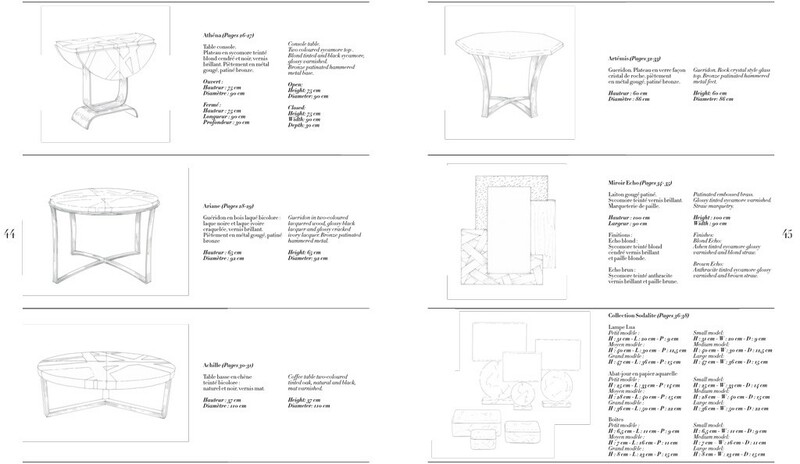 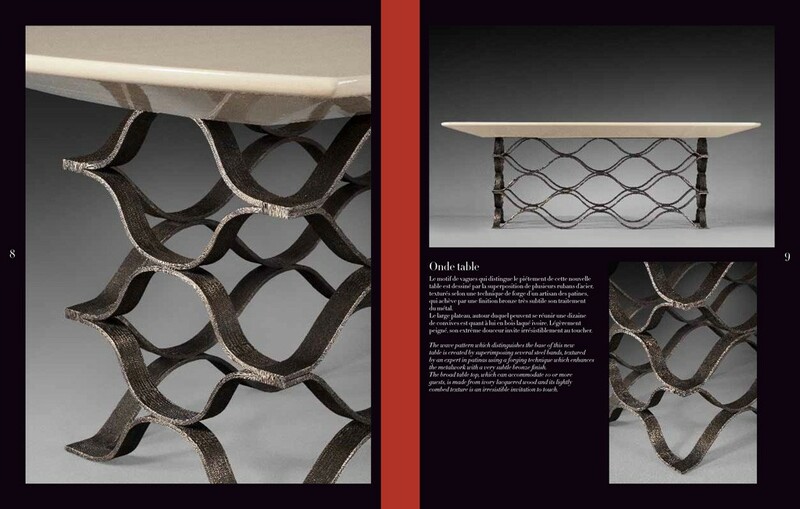 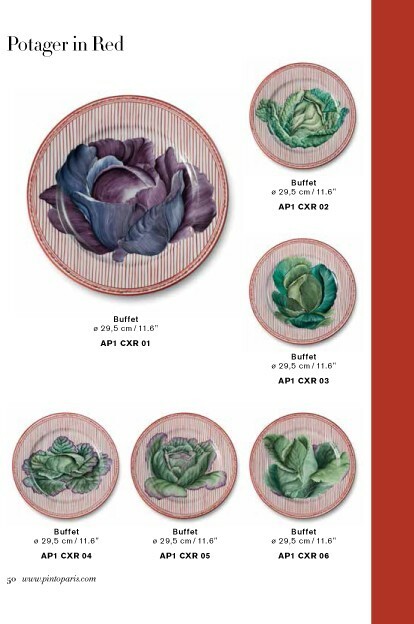 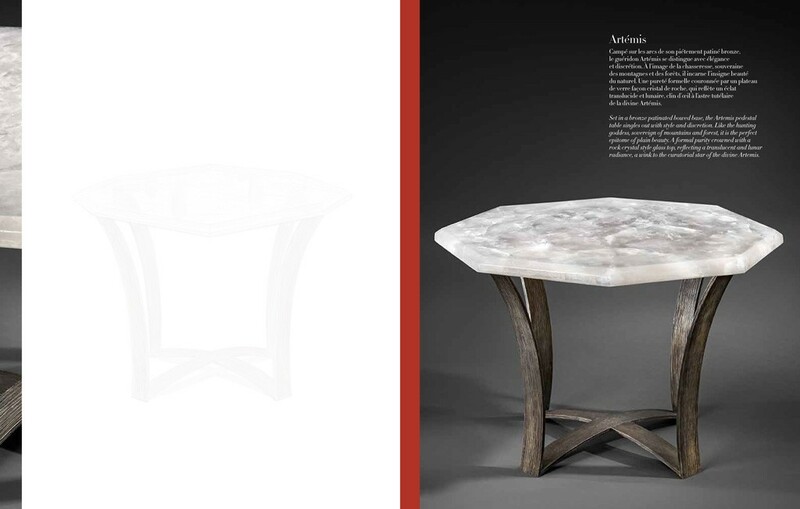 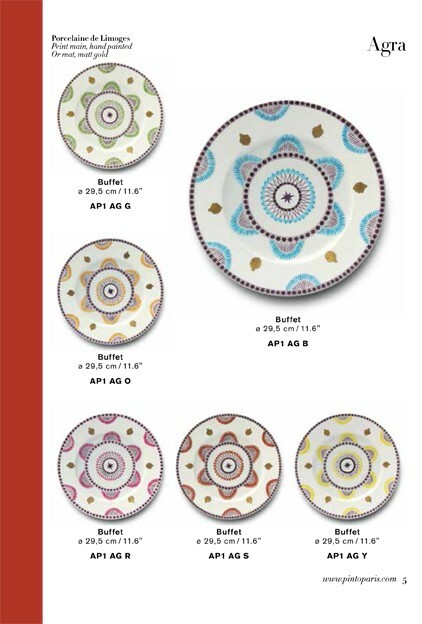 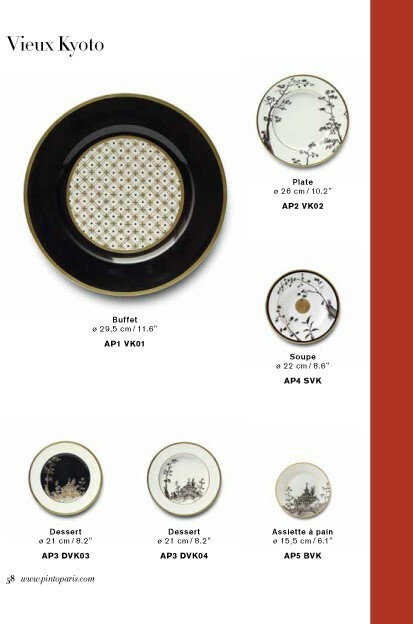 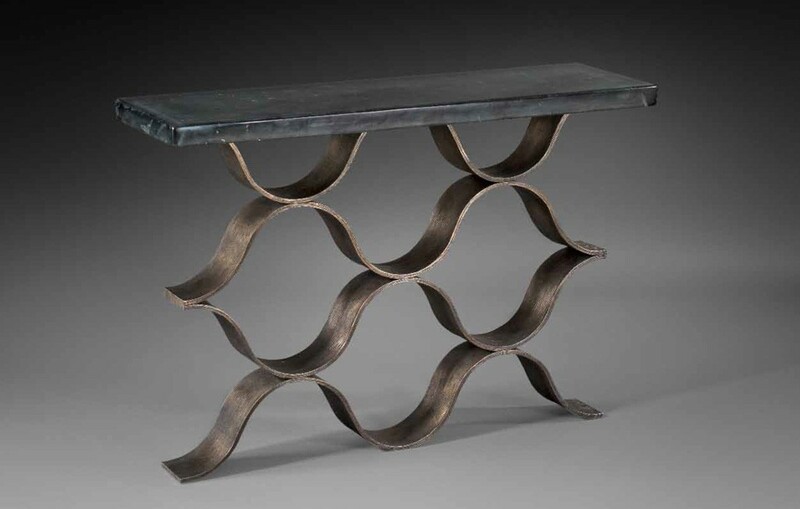 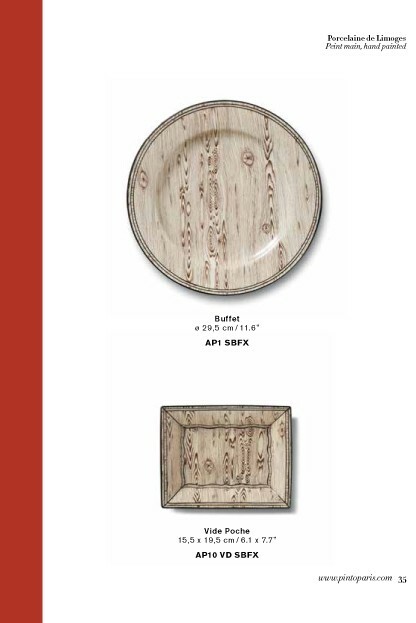 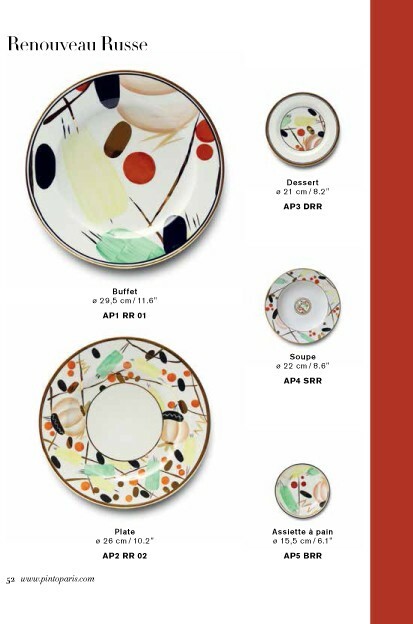 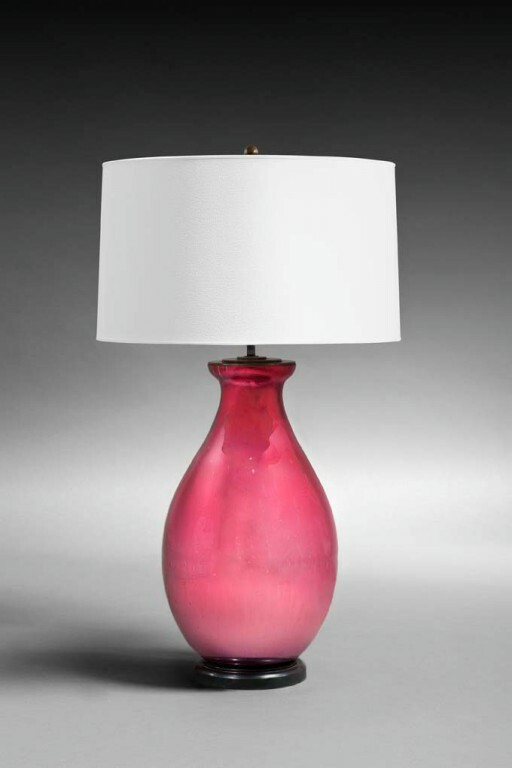 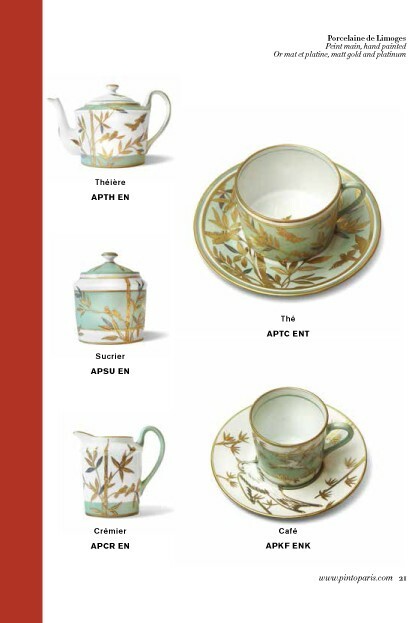 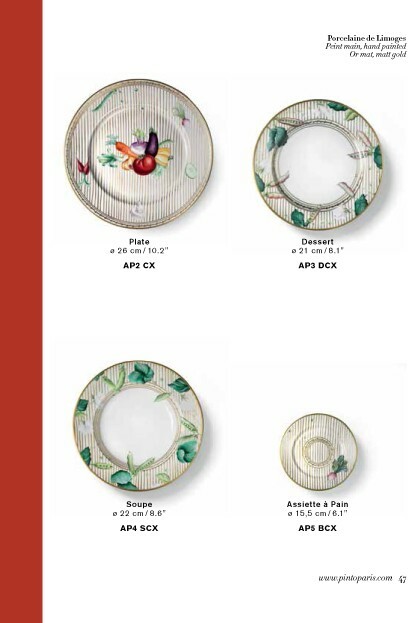 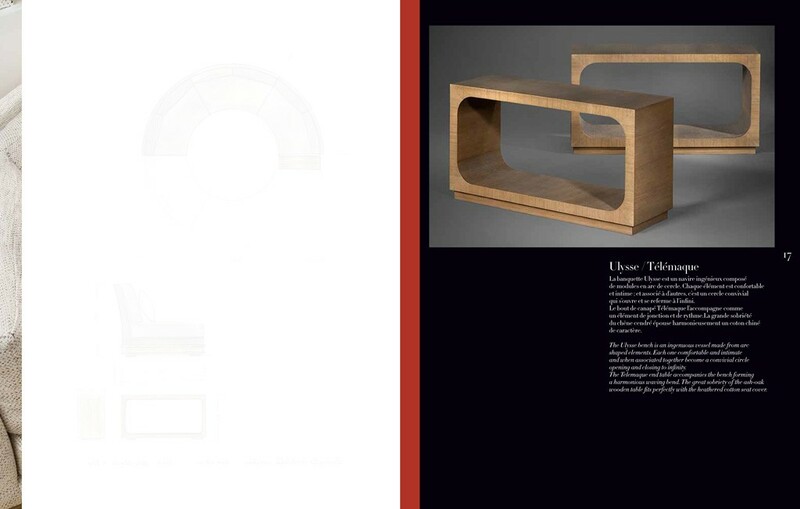 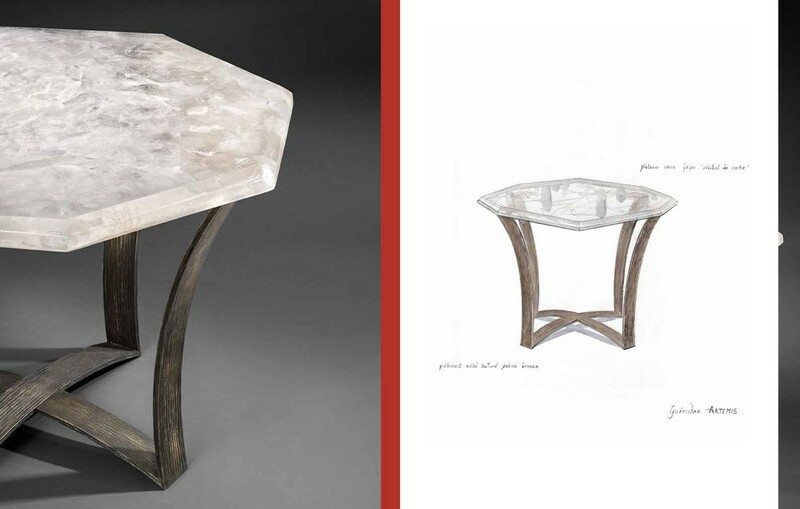 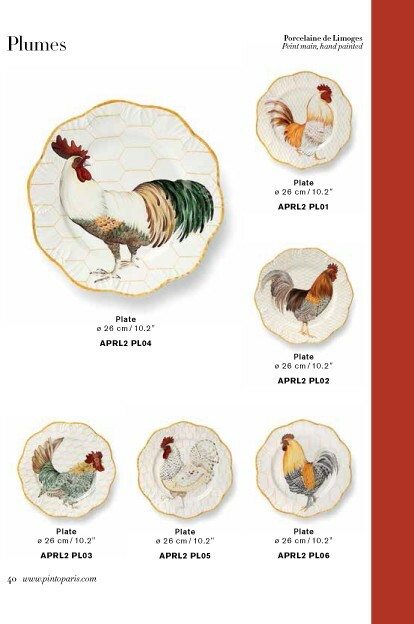 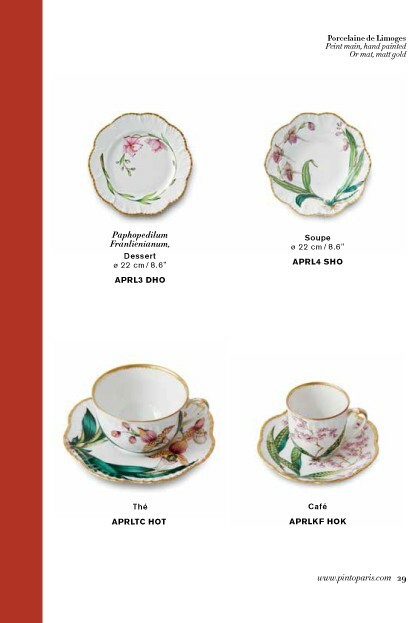 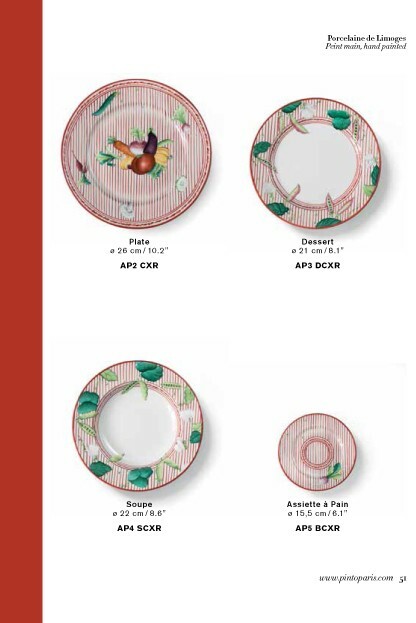 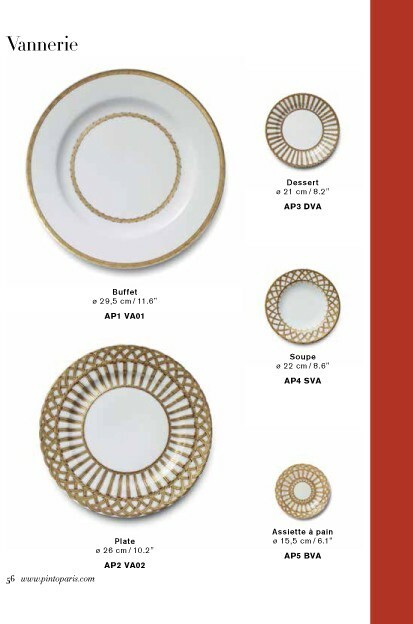 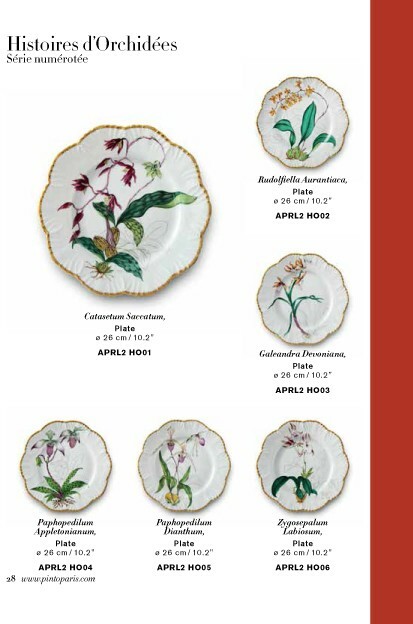 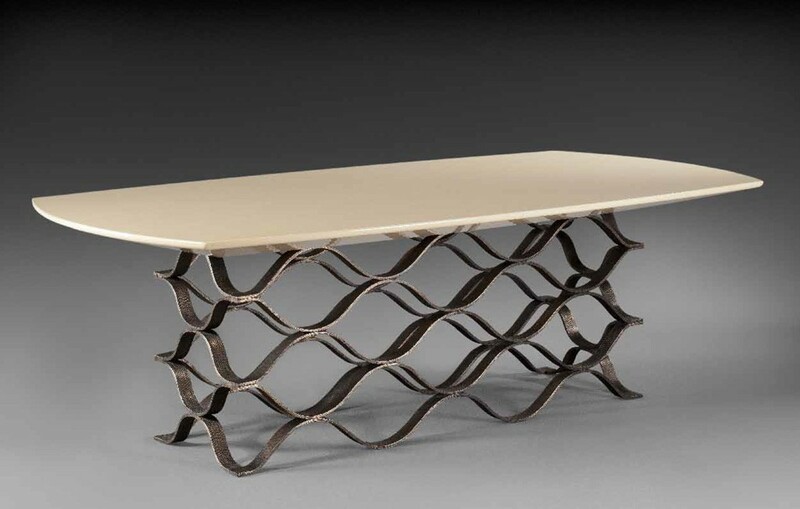 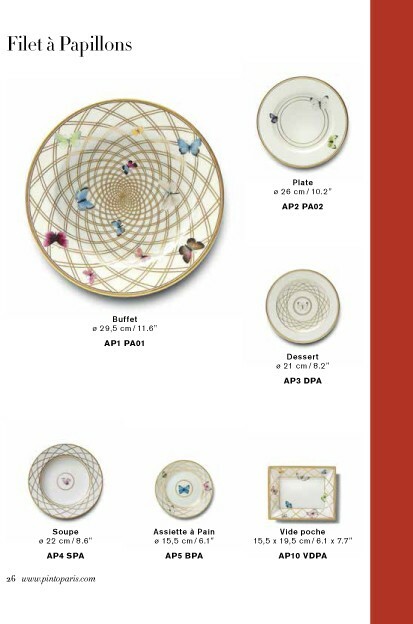 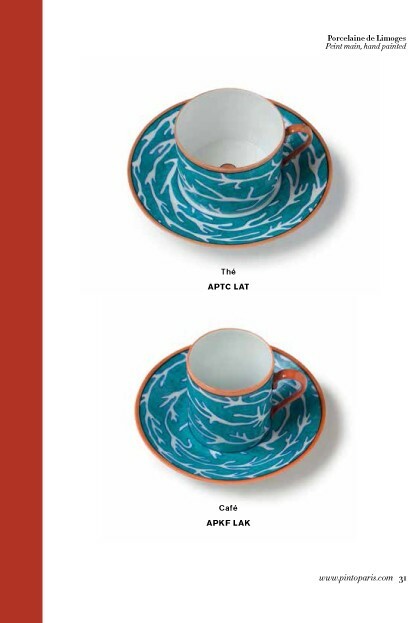 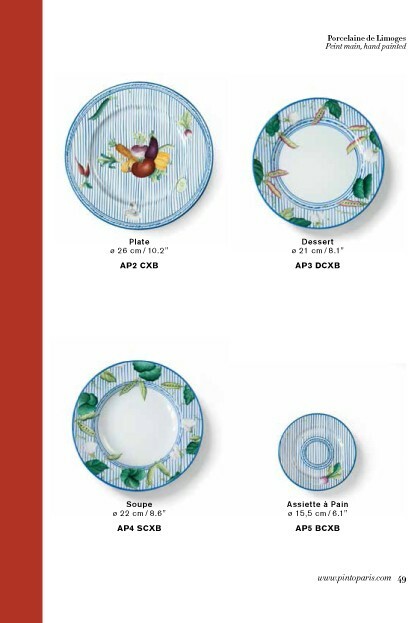 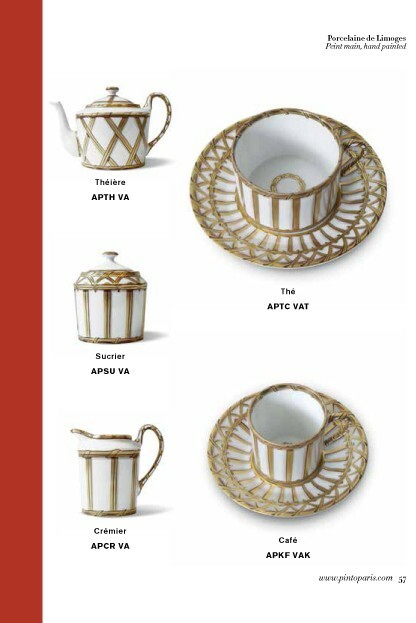 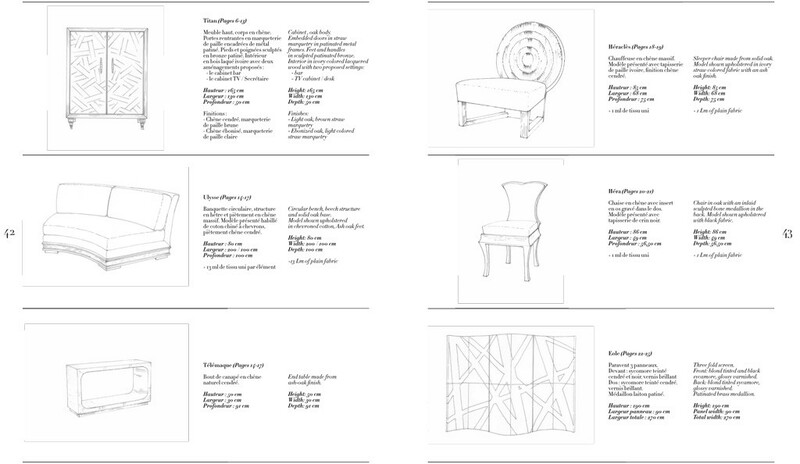 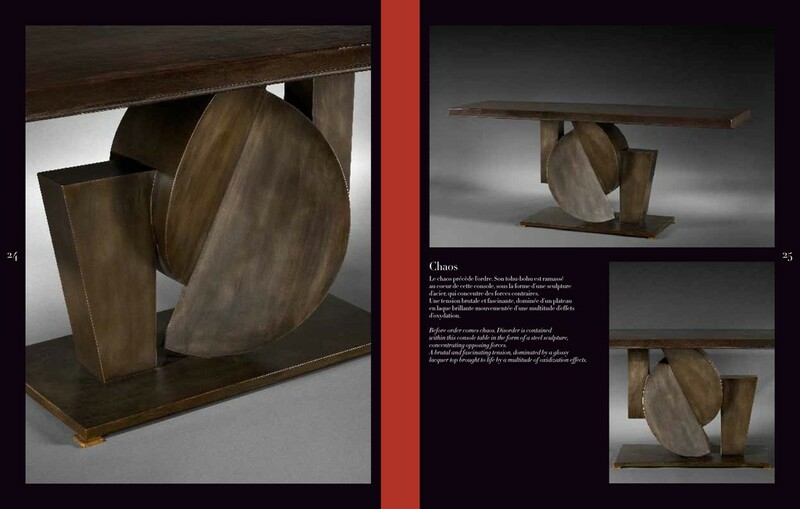 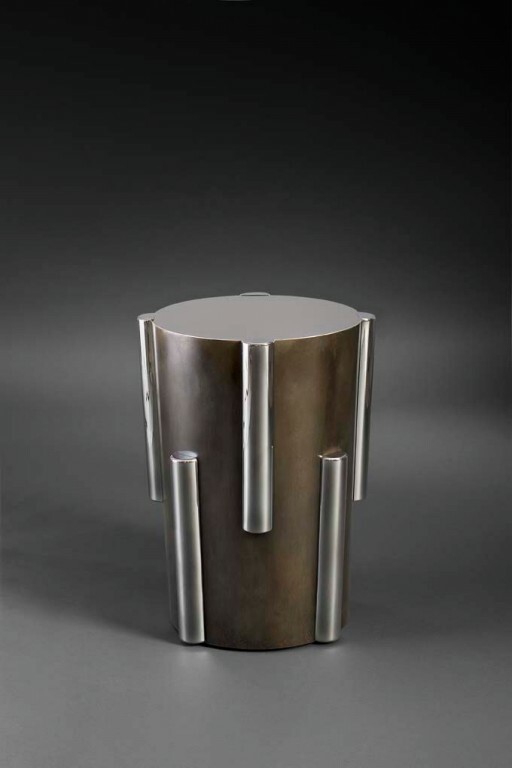 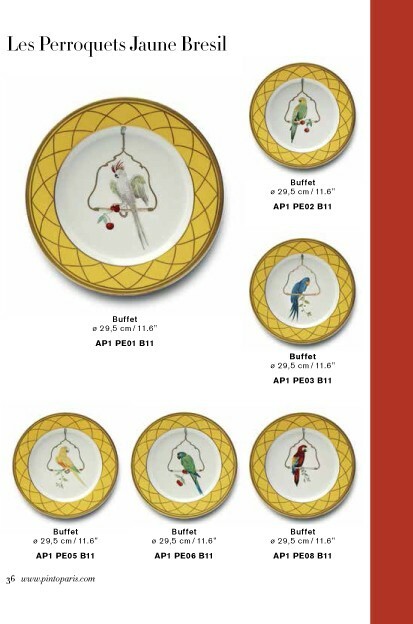 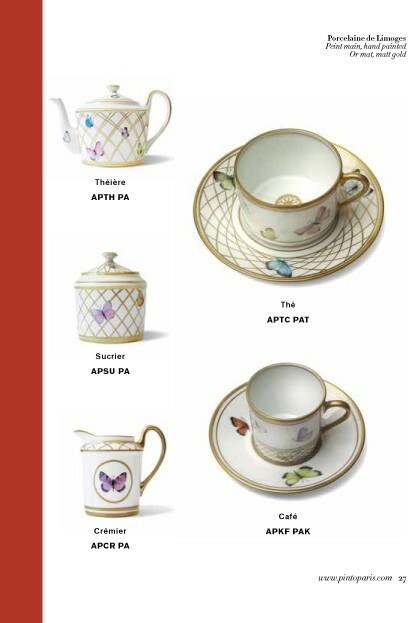 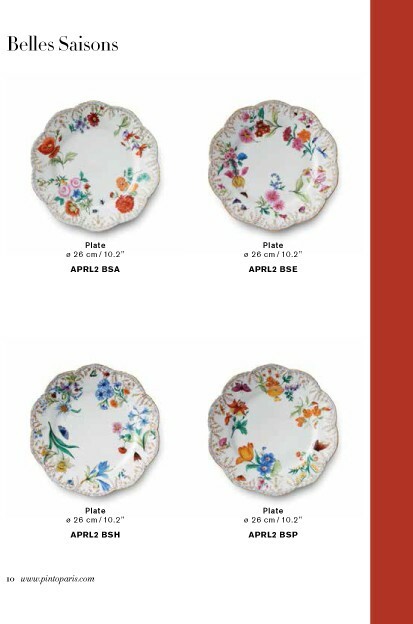 The 2014 Art de la table catalog is available on request. 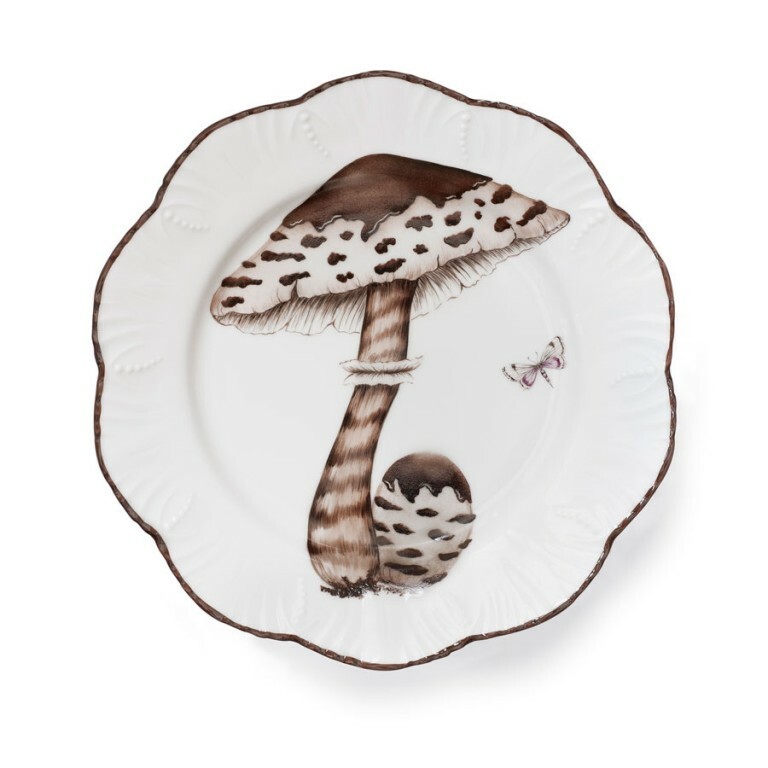 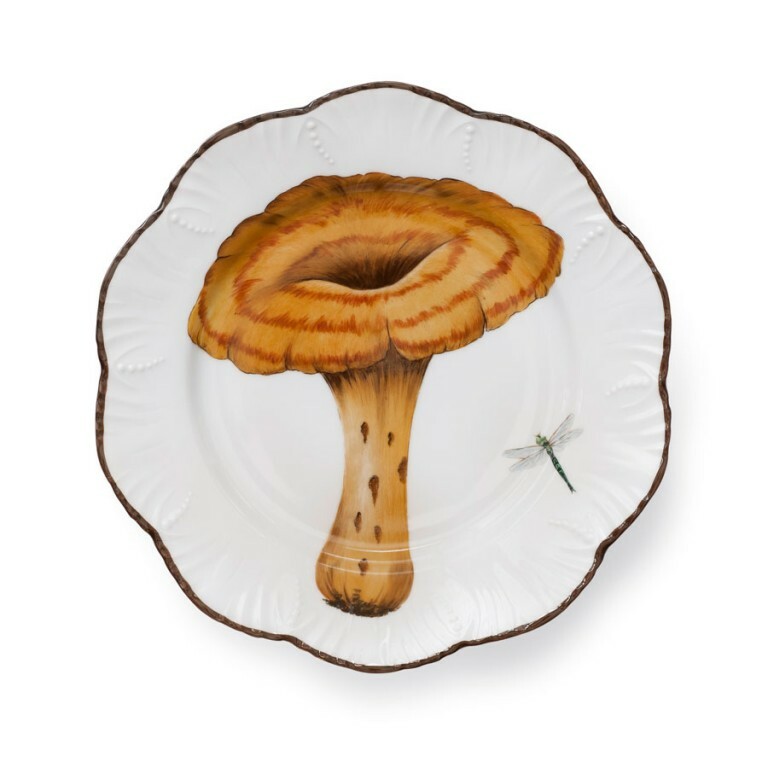 In 2012, Pinto Paris gathers in its basket six new mushrooms, in a numbered series which builds on its celebrated “Les Champignons” collection. 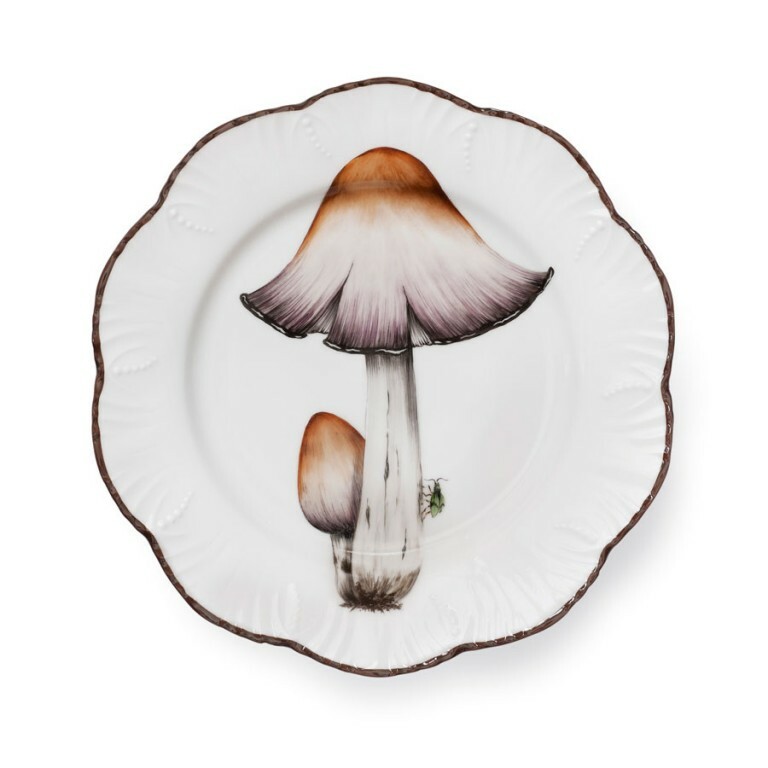 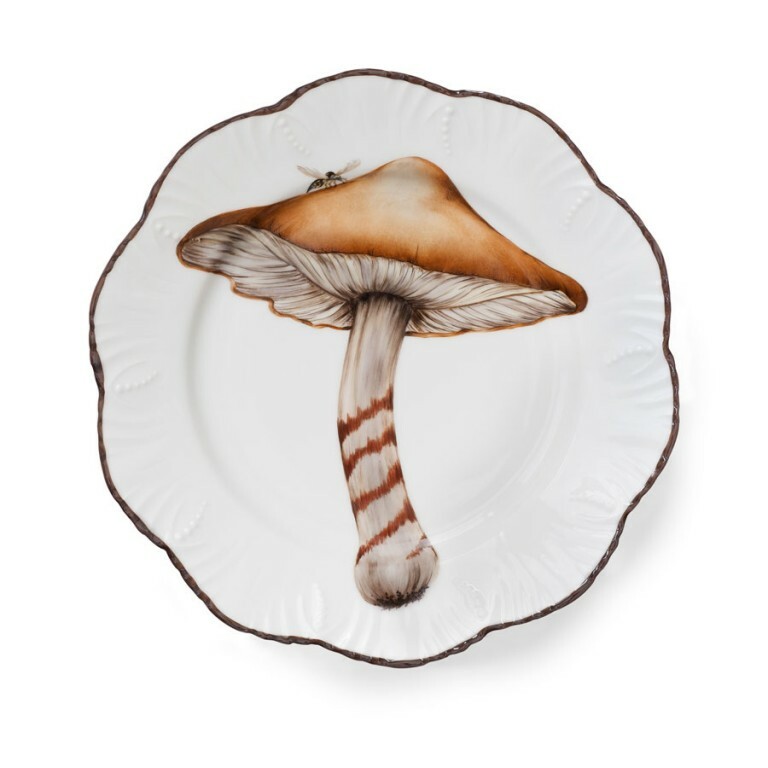 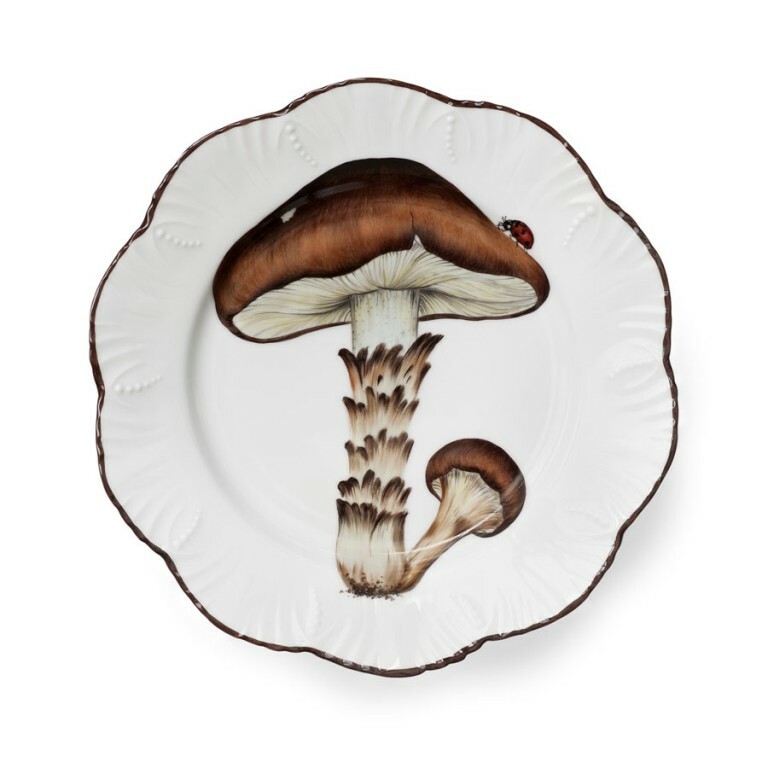 Taking still further his penchant for nature, Alberto Pinto has commissioned the finest painters on porcelain to create a service that captures the mushrooms with astonishing precision. 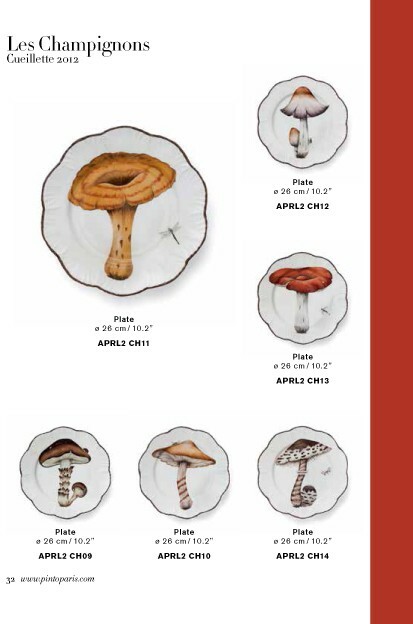 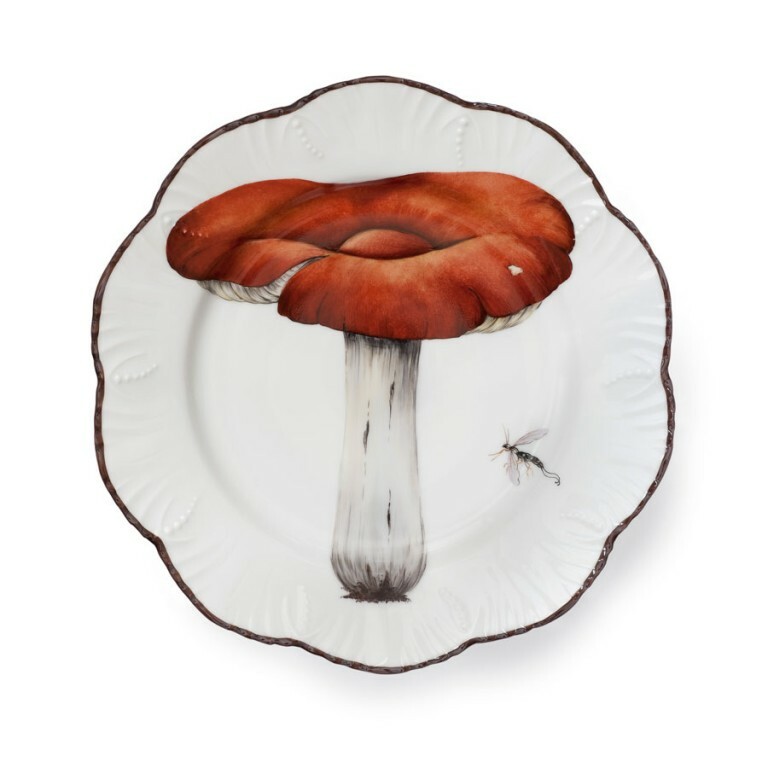 The parasol, the delicious milk cap, the golden russula, the red banded webcap, the honey fungus and the black inkcap all grace this stroll through the glades, embellishing an original and numbered set of six dinner plates. 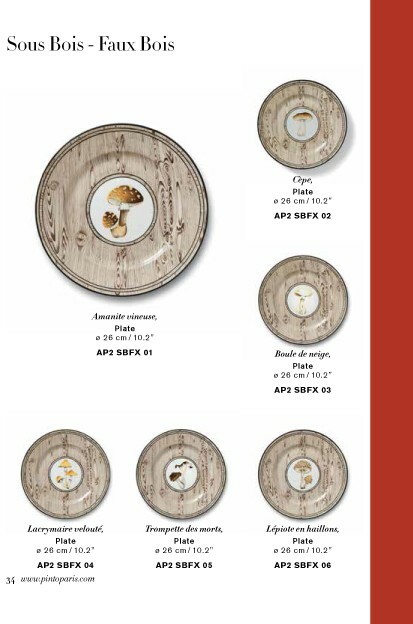 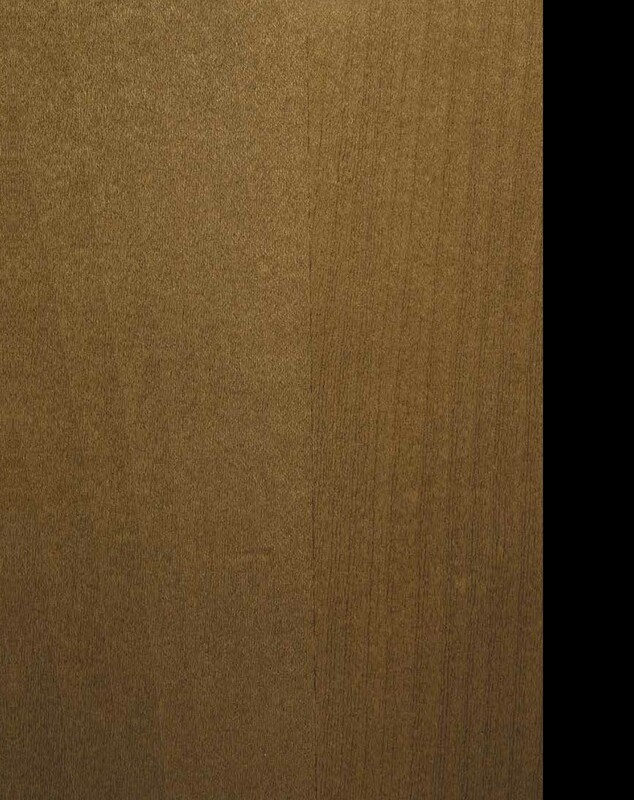 This series just like the first one is in complete harmony with the Sous Bois – Faux Bois collection. 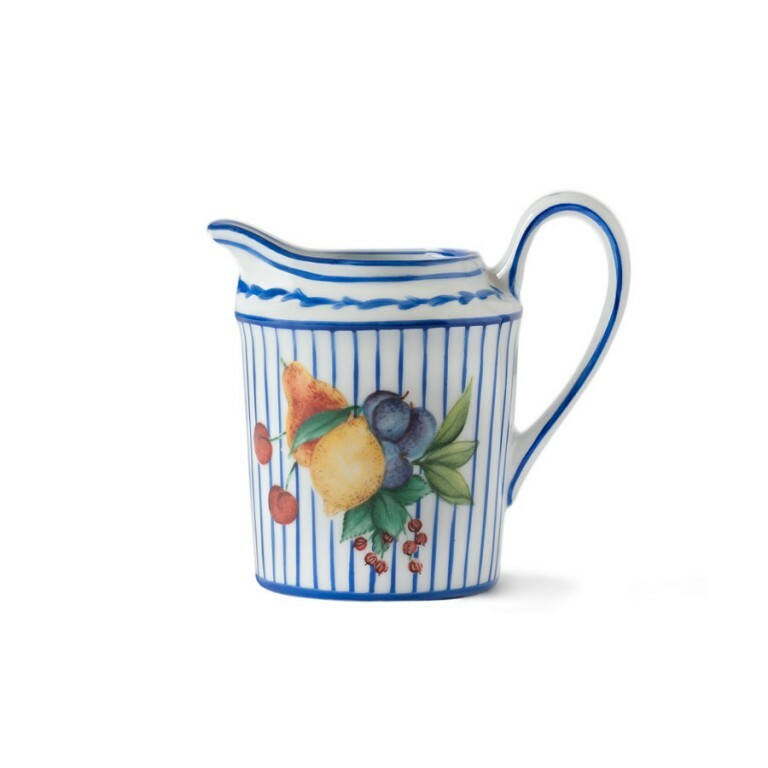 Launched in 2010 by Pinto Paris, the Potager (or ‘kitchen garden’) collection met with immediate acclaim. 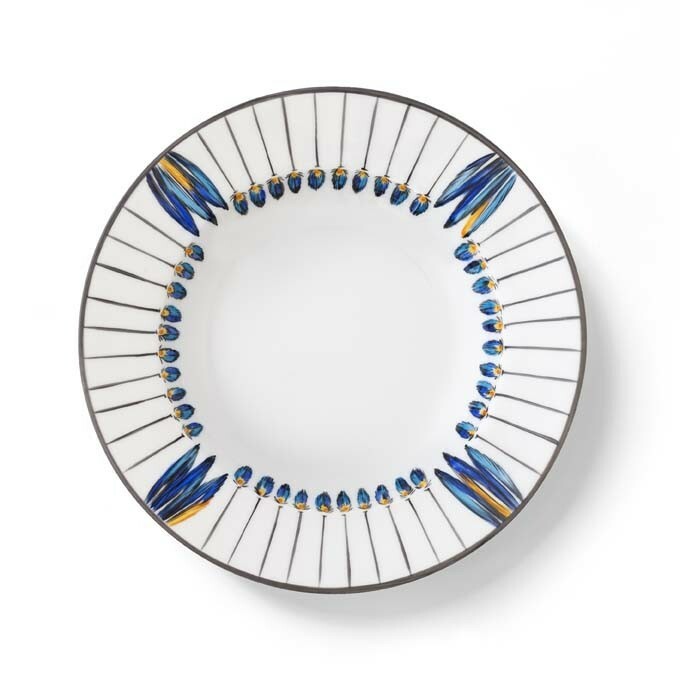 So much so that a year later, Alberto Pinto decided to create a more casual version, which substitutes the threads of gold adorning the bottom of the plates with blue or red threads – ideal for less formal tables. 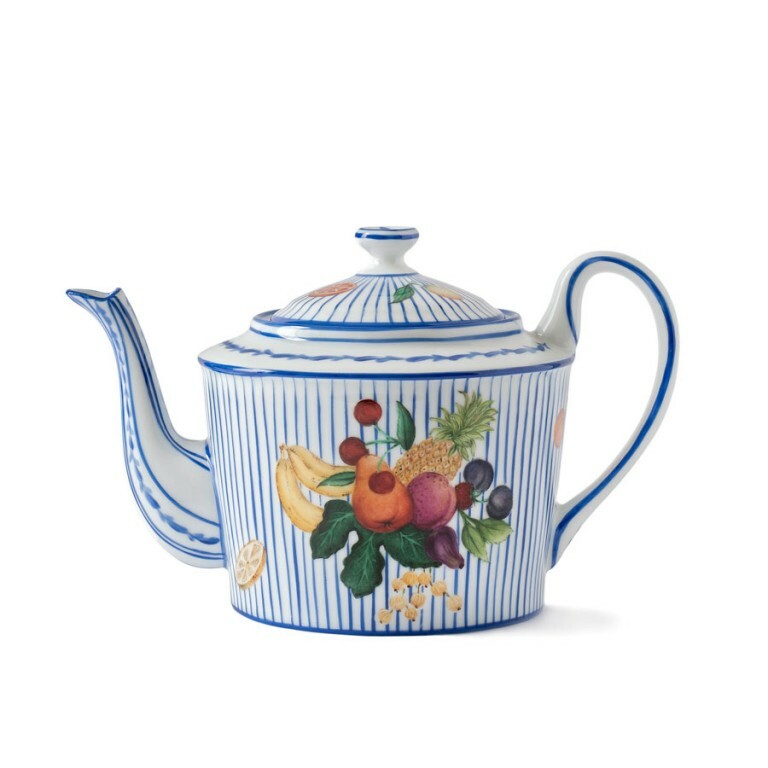 To breathe new life into breakfast, Alberto Pinto has dreamed up a new story with his Potager in Blue collection, where the spring vegetable theme is complemented by an equally delicious orchard fruits theme. 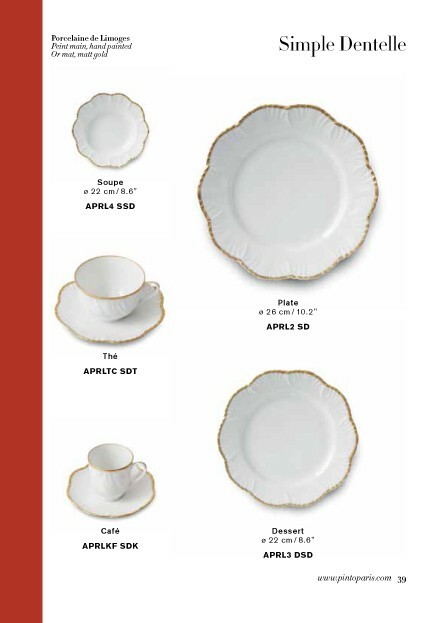 A teapot, breakfast cup, tea and coffee cups, sugar bowl, milk jug, egg cup, butter dish, and jam and fruit bowls set the tone for an elegant table. 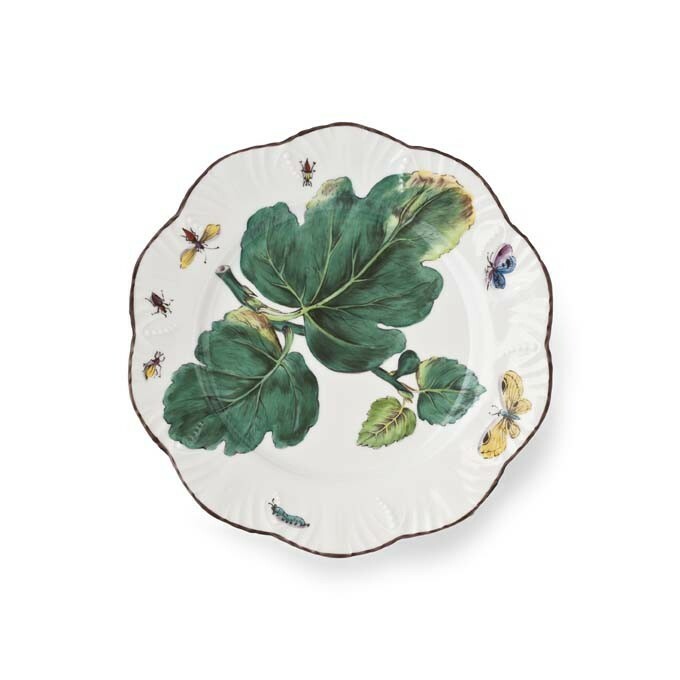 Nature is an inexhaustible source of inspiration for Alberto Pinto who signs a new table service collection titled Savanna. 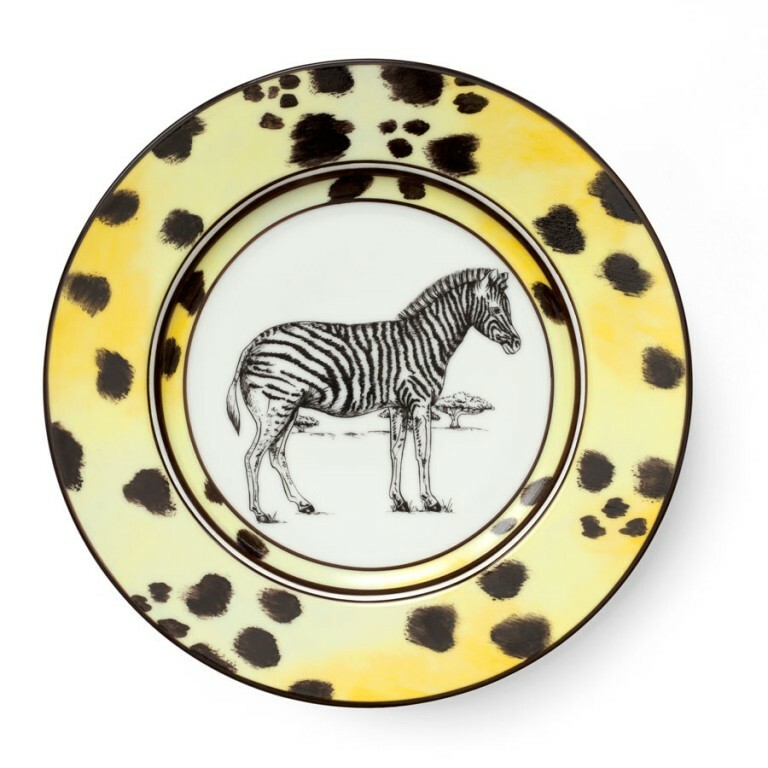 A tribute to the grace of wild animals which lays on the table an imaginary safari itinerary. 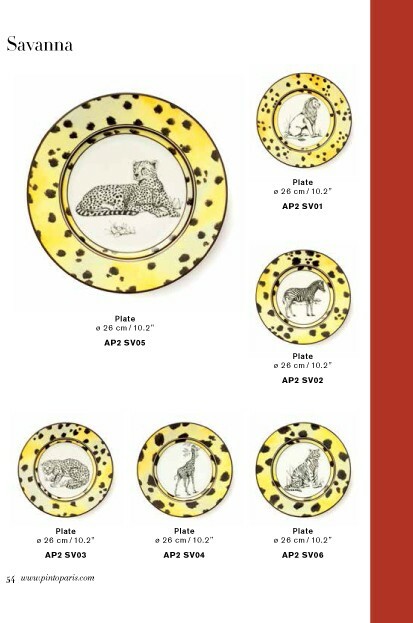 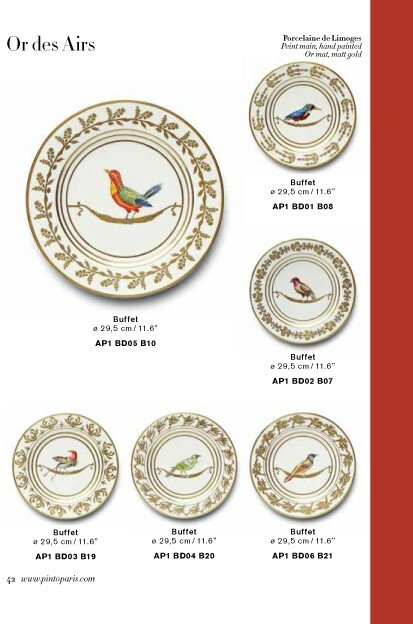 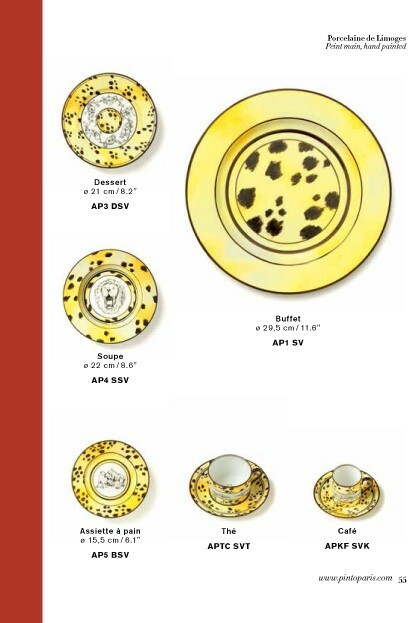 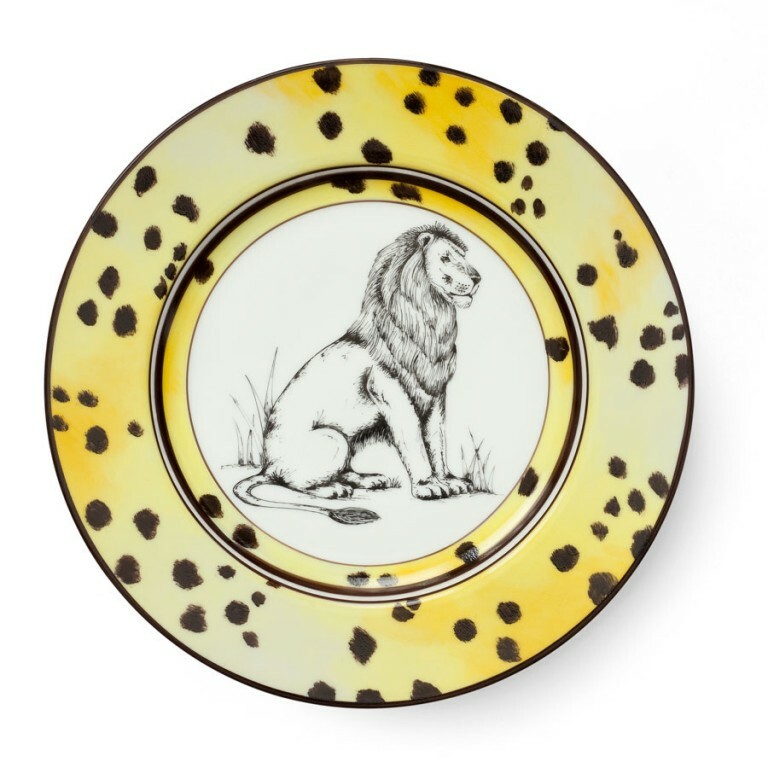 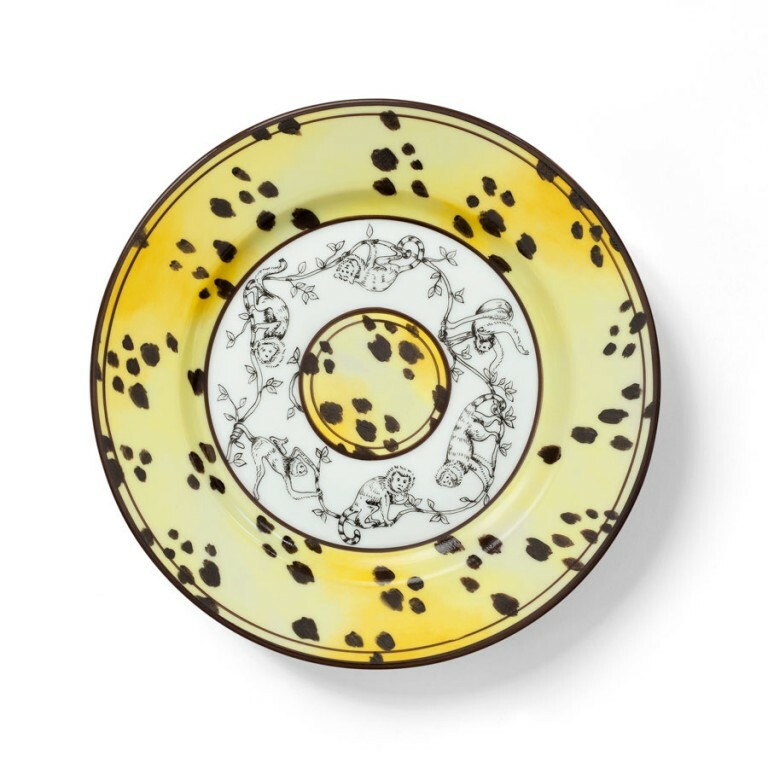 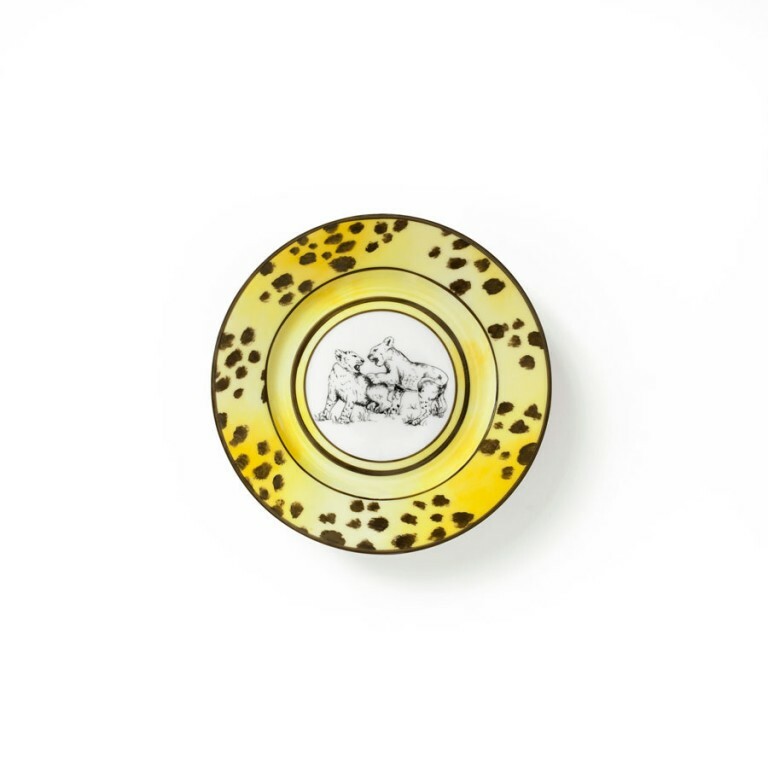 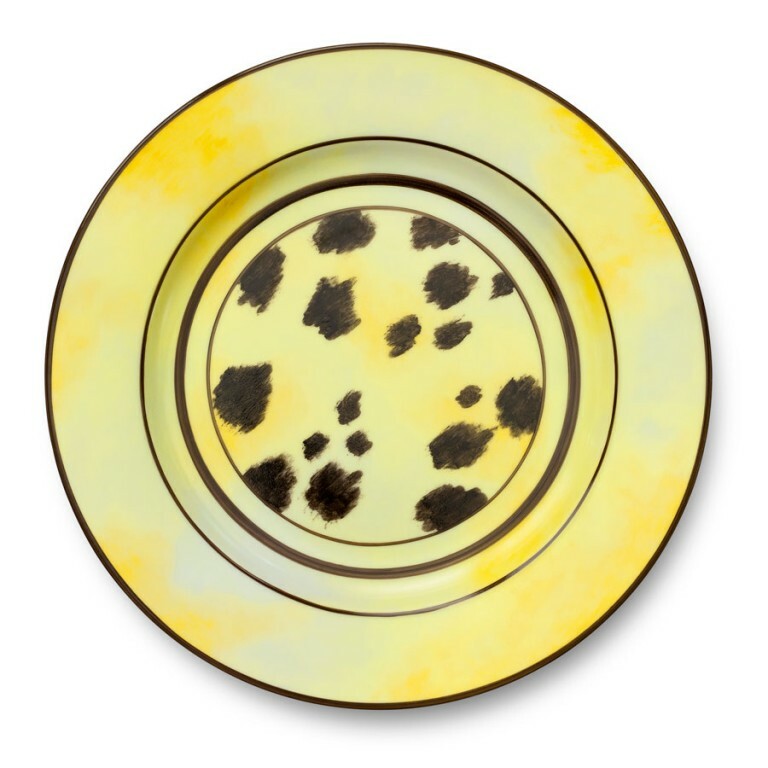 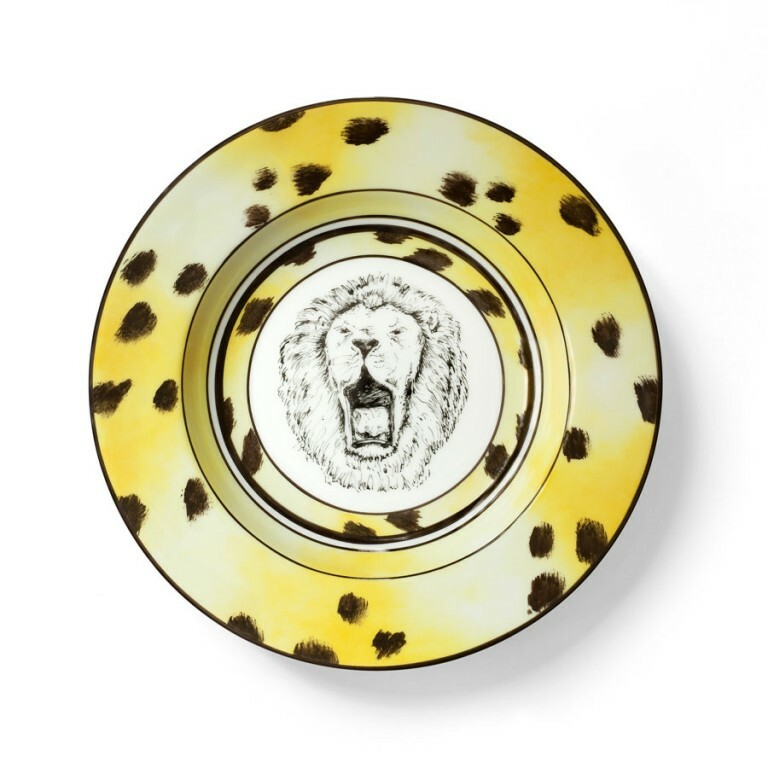 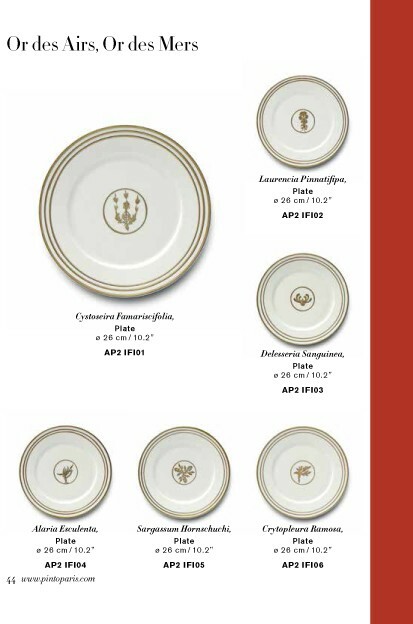 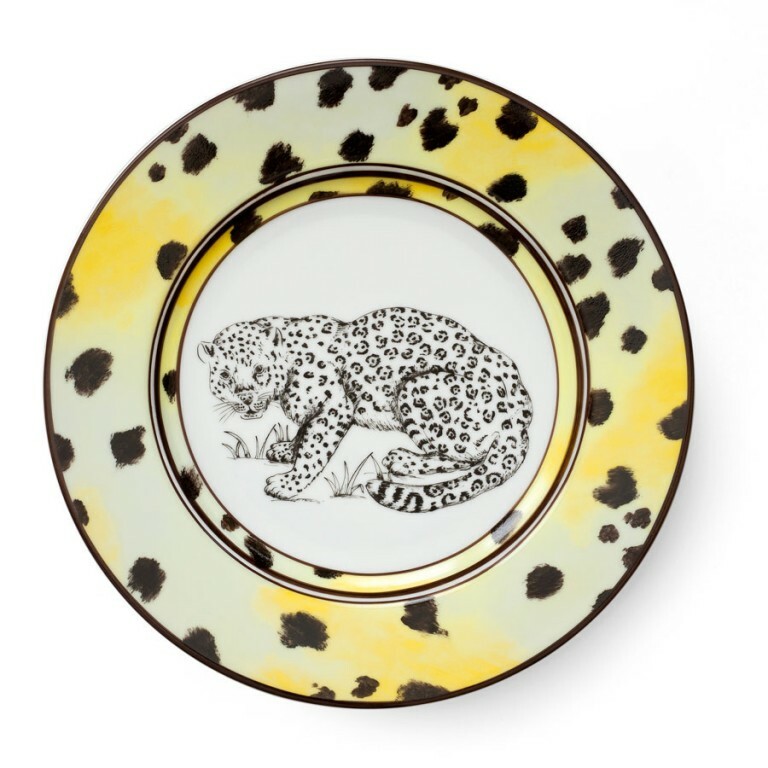 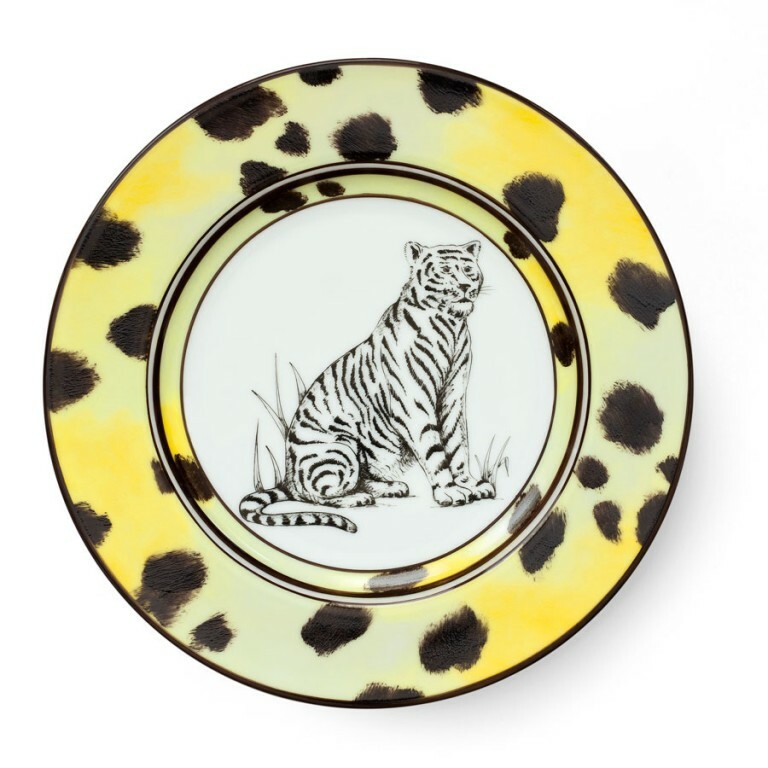 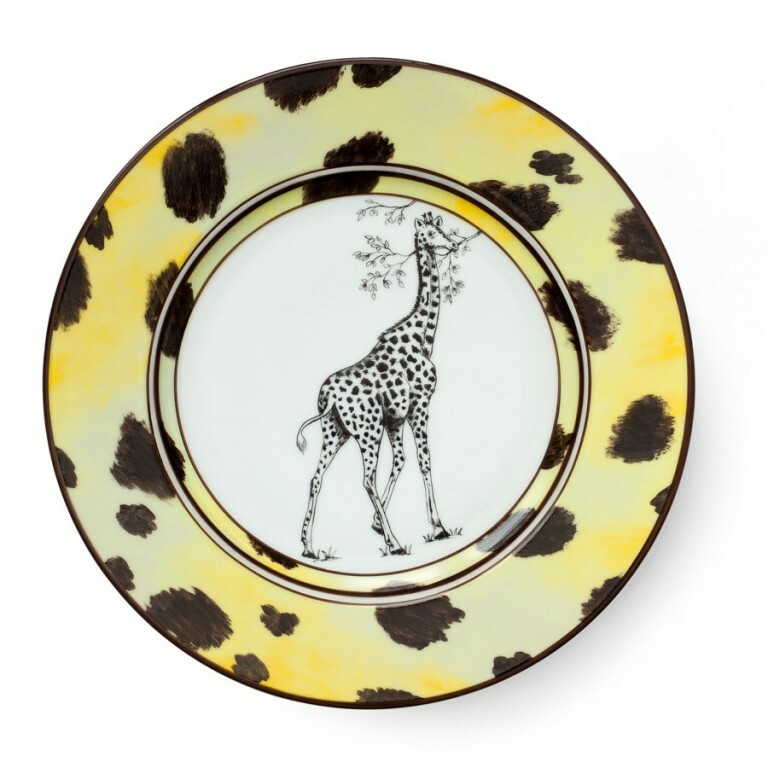 On the immaculate white Limoges porcelain thus stands out the drawings of the most celebrated species of the savannah such as the lion, the panther, the tiger, the leopard, the giraffe, the monkey, as well as the zebra. 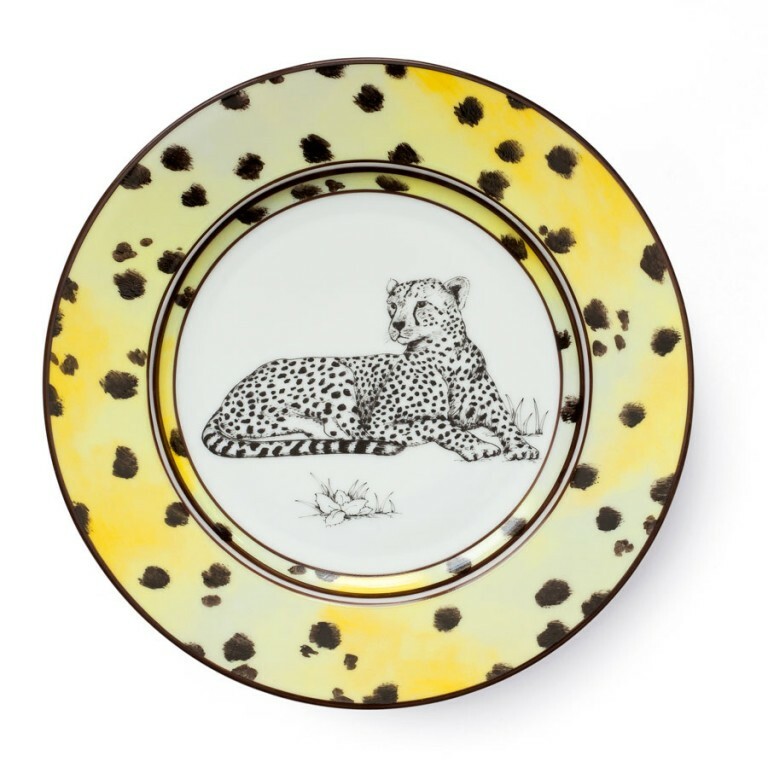 Drawn with great detail in black ink, they are framed by an ornate blurred light yellow background and animated with random spots evoking the leopard’s coat. 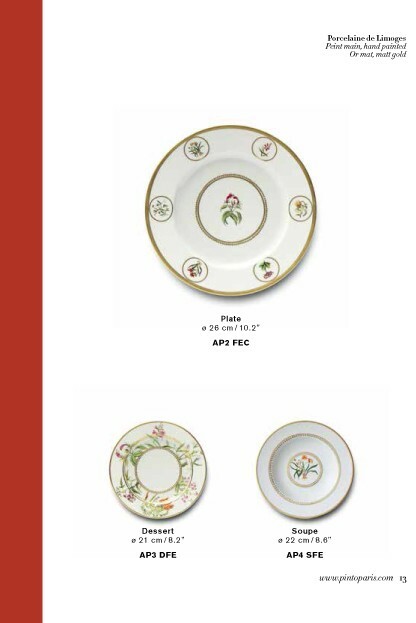 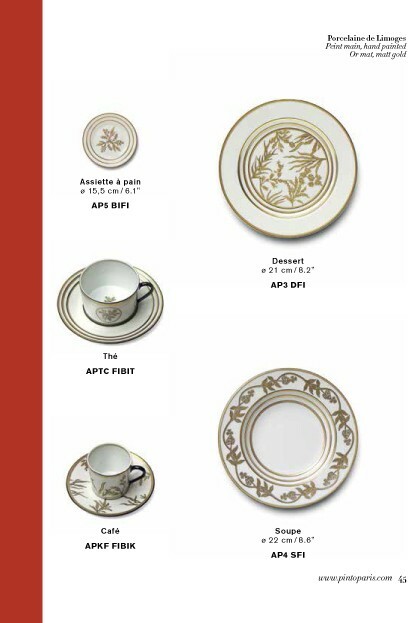 An invitation to adventure given in a very complete collection which includes presentation plate, a series of dinner plates, dessert plate, soup plate, bread plate as well as tea and coffee cups. 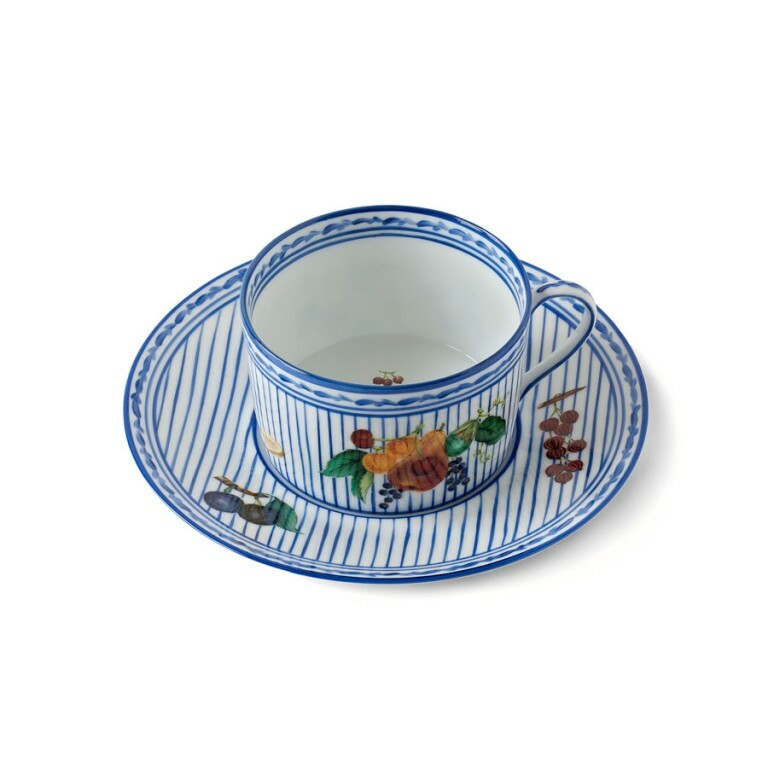 La simplicité des bords de mer et des vacances donne à Alberto Pinto le fil directeur d’une collection qui réinterprète l’originalité de la faïence turque et le répertoire des motifs marins. 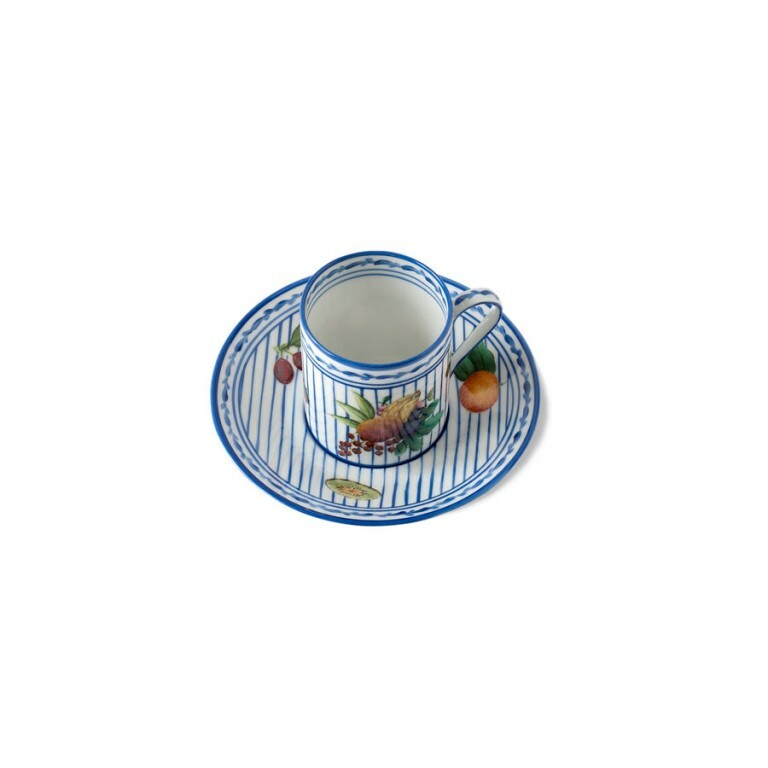 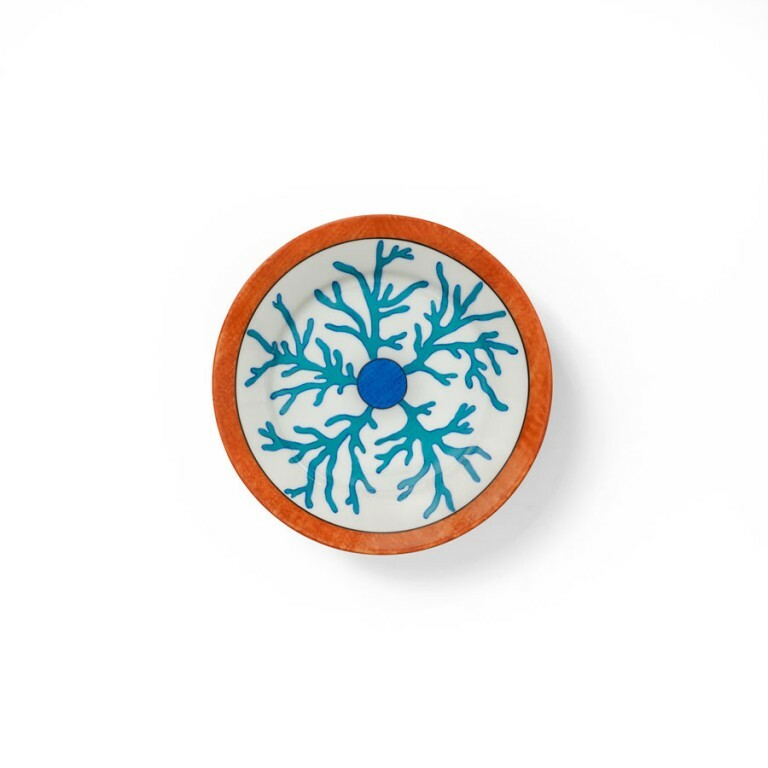 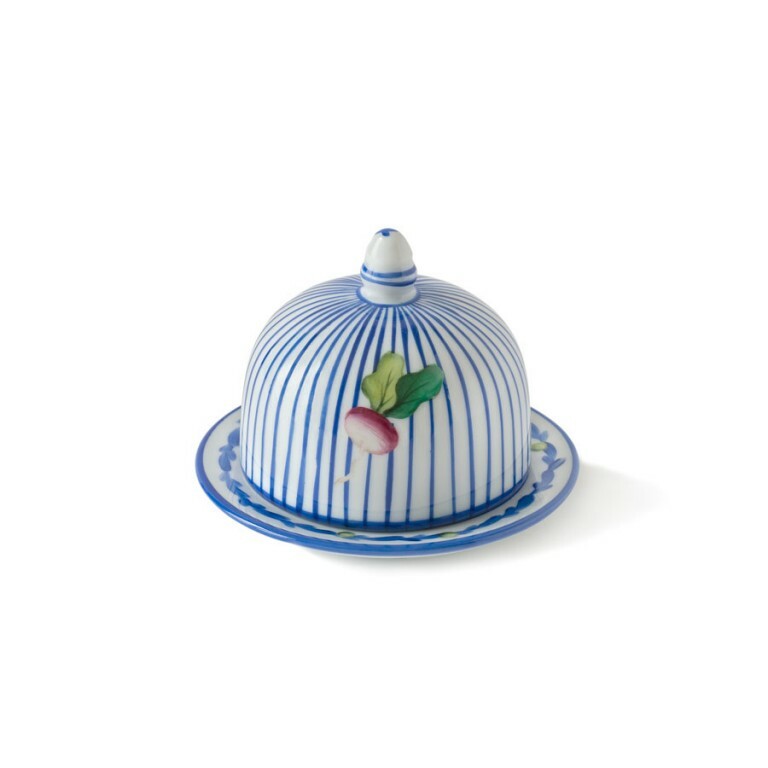 La technique traditionnelle transposée sur la porcelaine offre un rendu inédit qui évoque des coups de pinceaux vifs dans des déclinaisons de bleu et de turquoise relevées par des pointes de corail et de noir. 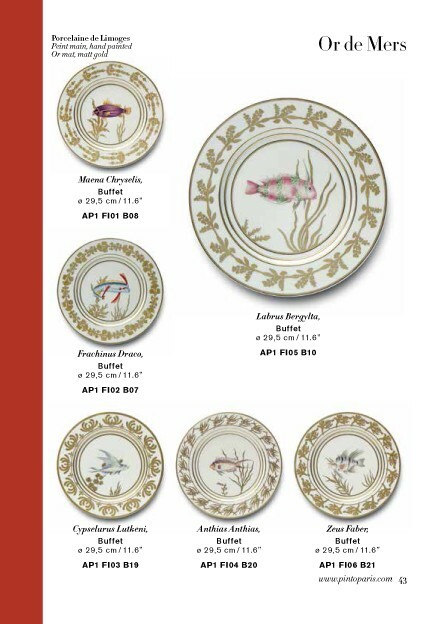 Écailles stylisées, frises de poissons, coquillages, branches de corail ressortent du fond blanc ou sont représentés en réserve pour traduire avec élégance et simplicité la grande tradition ornementale liée à l’inspiration maritime. 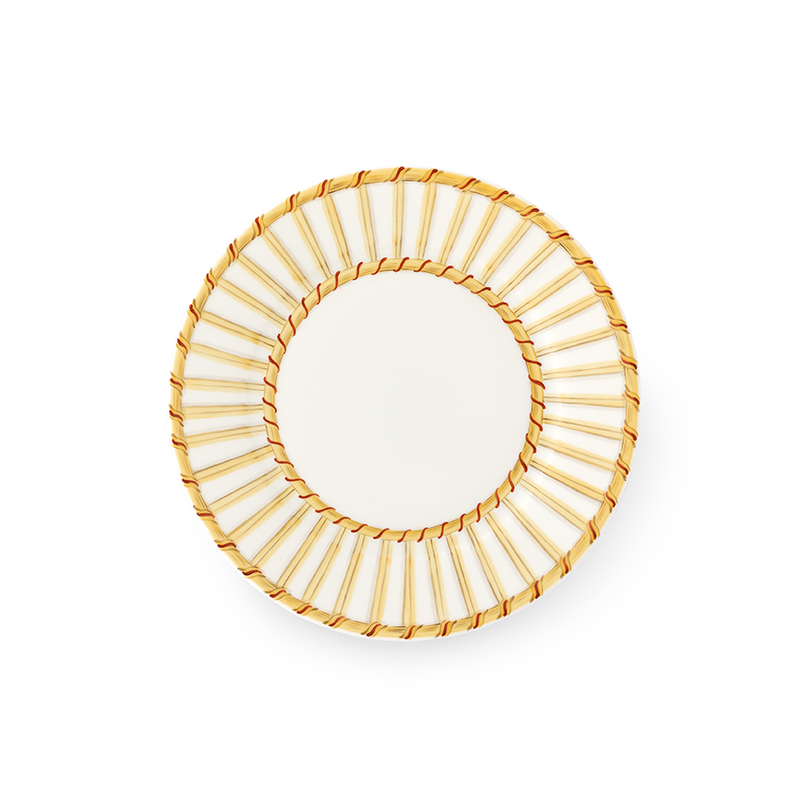 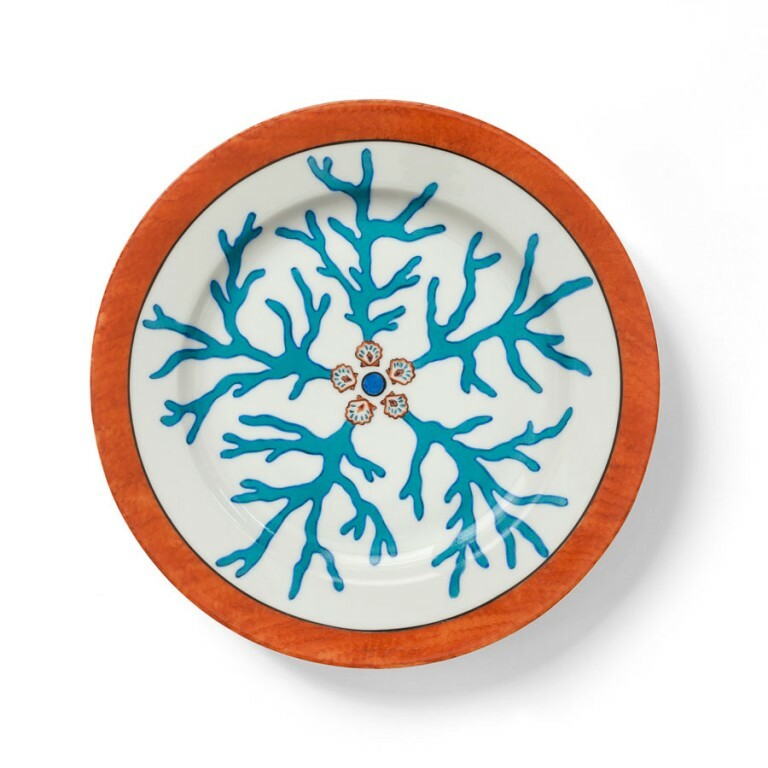 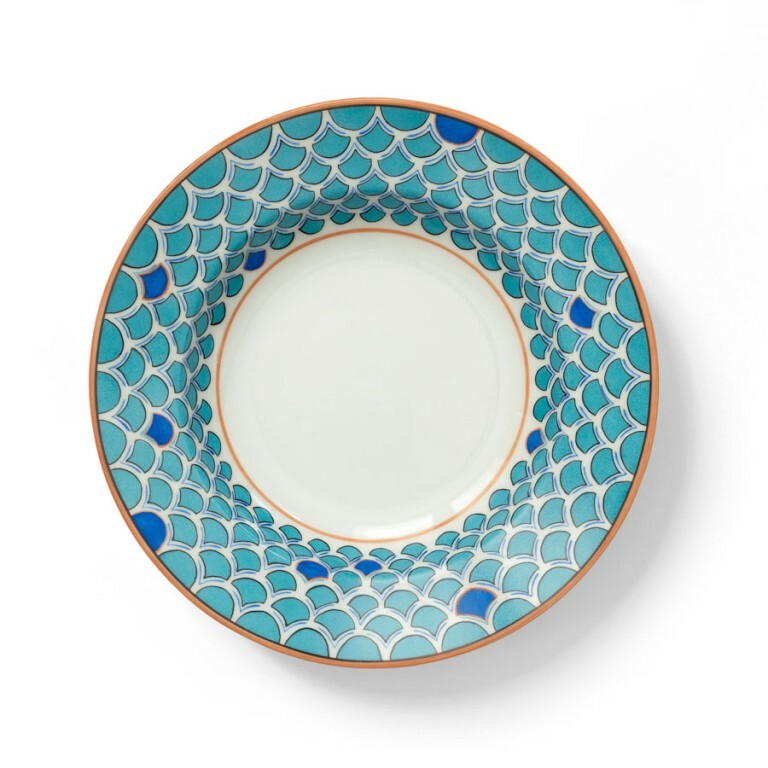 À bord d’un yacht ou d’une villa de plage, cette collection invite à la création de tables qui allie fraîcheur et naturel, grâce à une déclinaison très complète qui compte assiette de présentation, assiettes plates, assiette à dessert, assiette à soupe, assiette à pain, tasse à thé et à café. 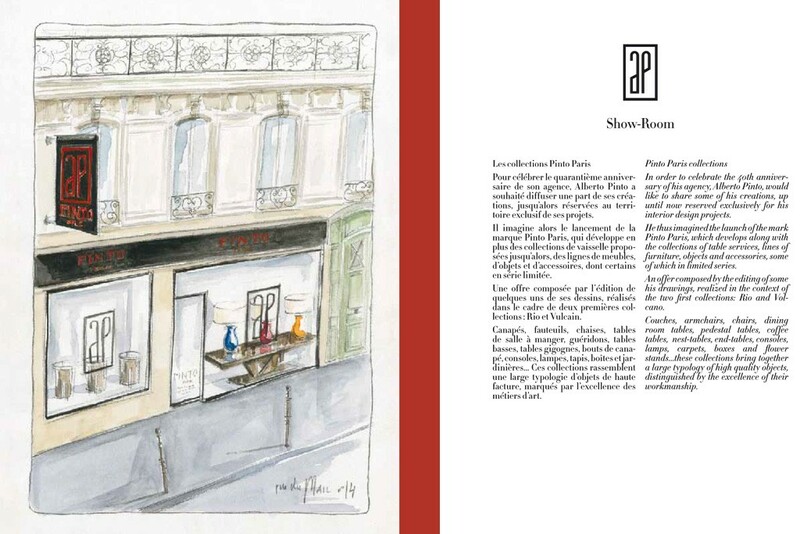 In October 2011, our new showroom will be open at number 14 rue du Mail in Paris. 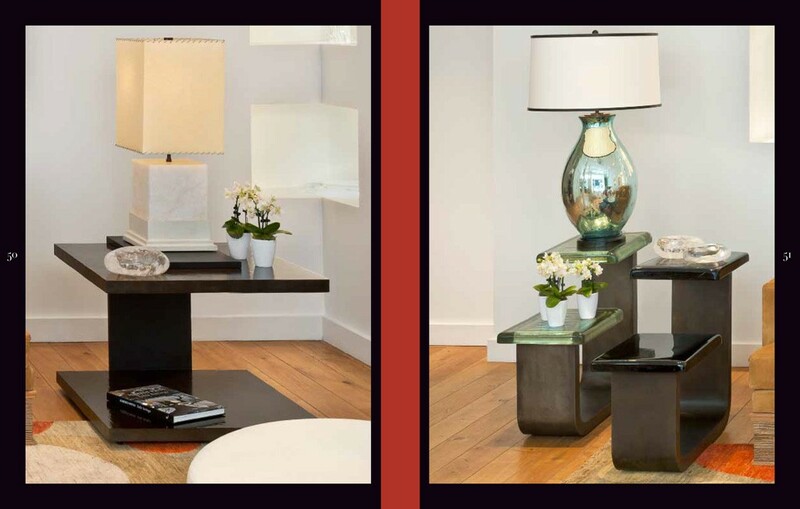 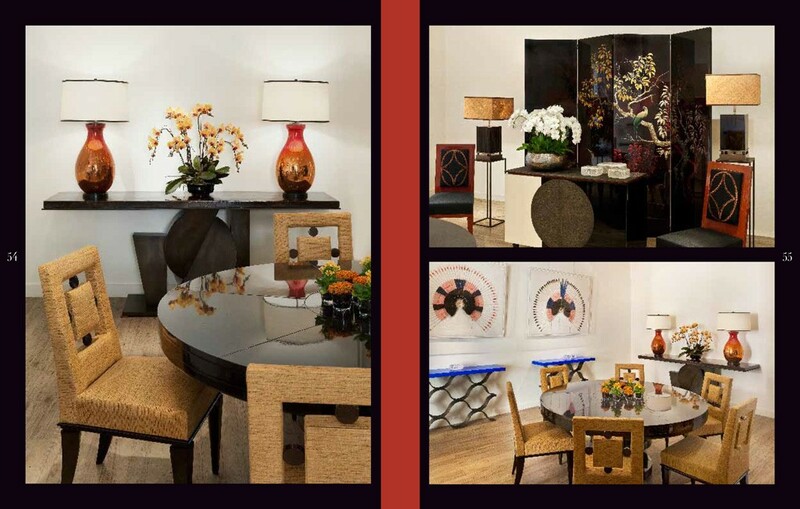 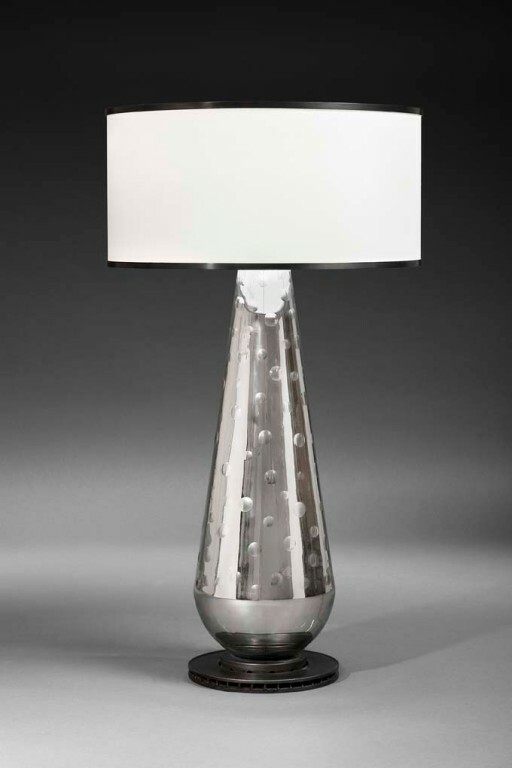 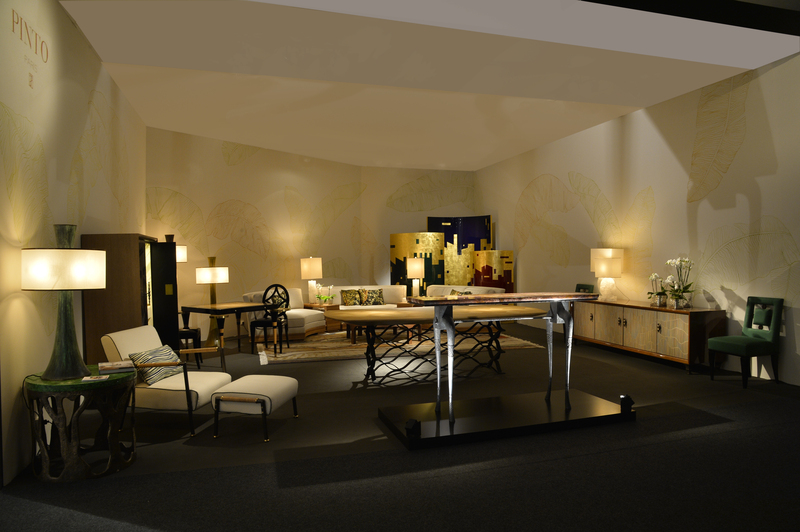 It will be exclusively dedicated to the Pinto Paris furniture, lightings and home accessories collections. 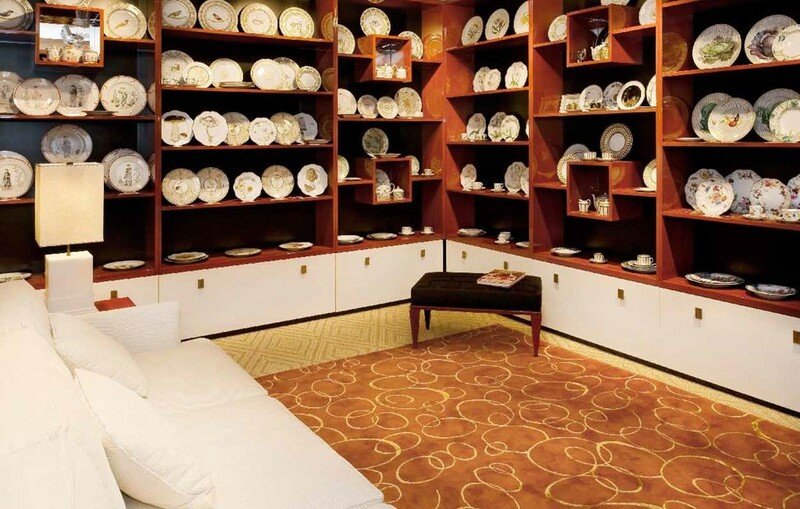 All the collections can be viewed in this new space upon appointment. 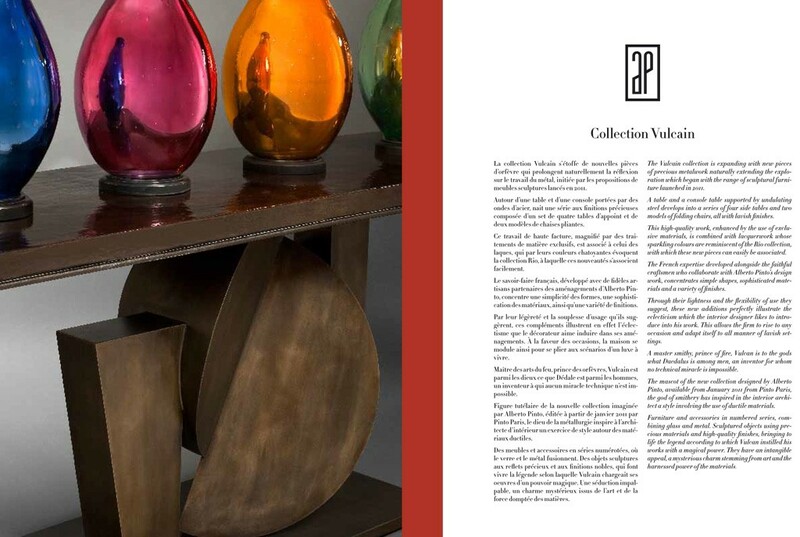 Note the Art de la Table collections will still be exhibited at number 11 rue d’Aboukir in Paris also upon appointment. 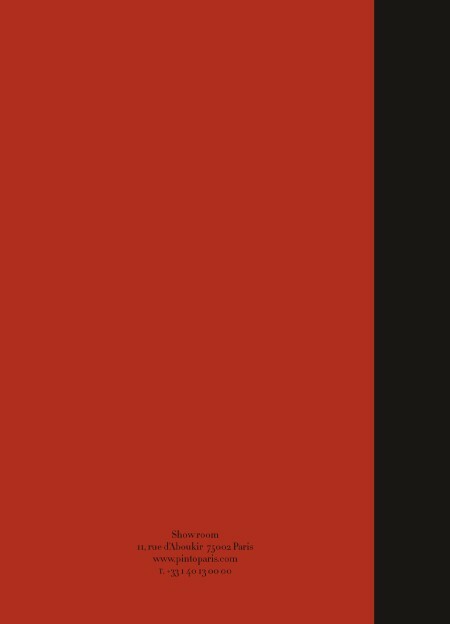 A master smithy, prince of fire, Vulcan is to the gods what Daedalus is among men, an inventor for whom no technical miracle is impossible. 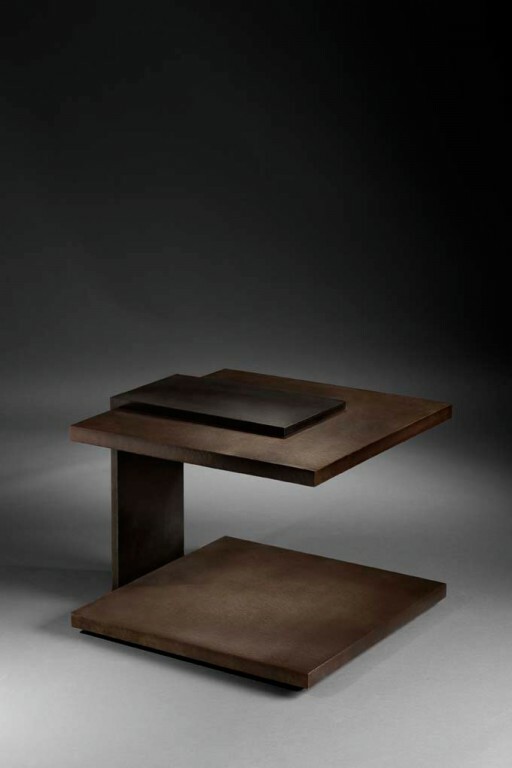 The mascot of the new collection designed by Alberto Pinto, available from January 2011 from Pinto Paris, the god of smithery has inspired in the interior architect a style involving the use of ductile materials. 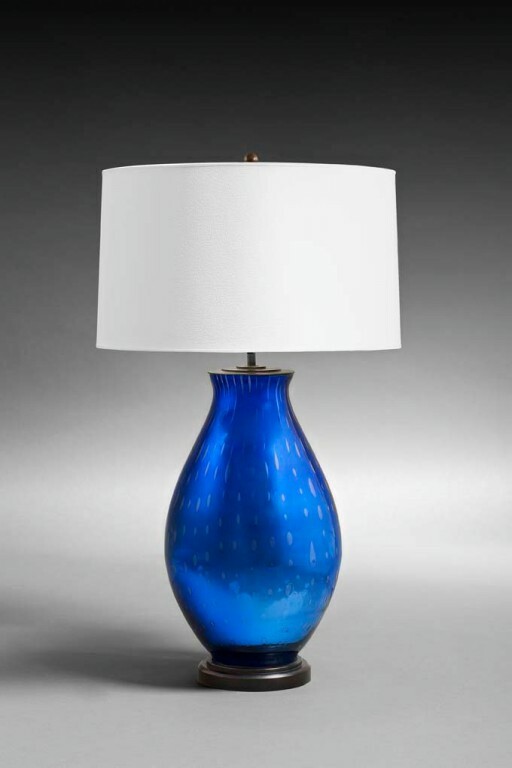 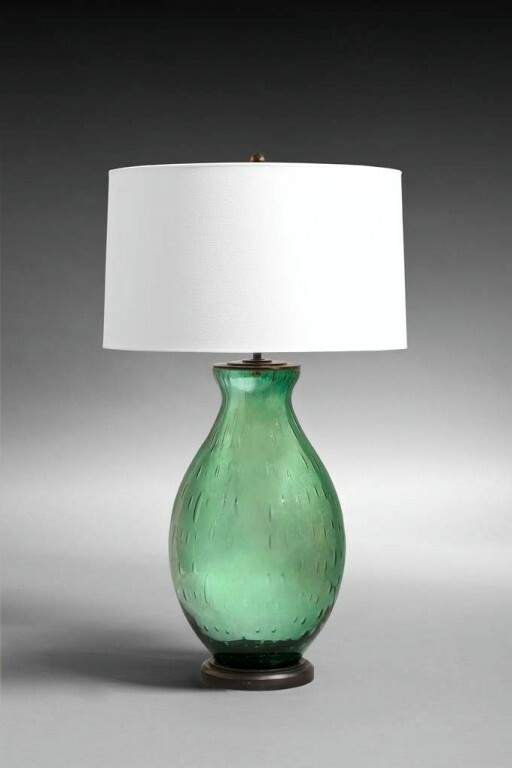 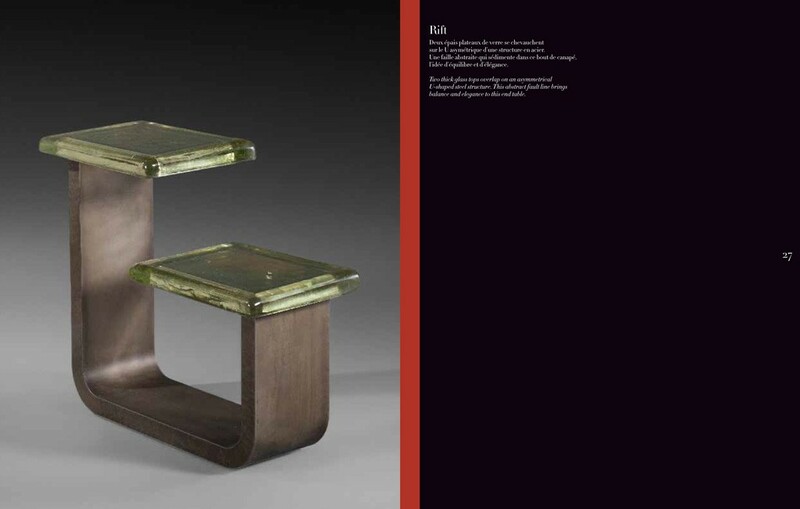 Furniture and accessories in numbered series, combining glass and metal. 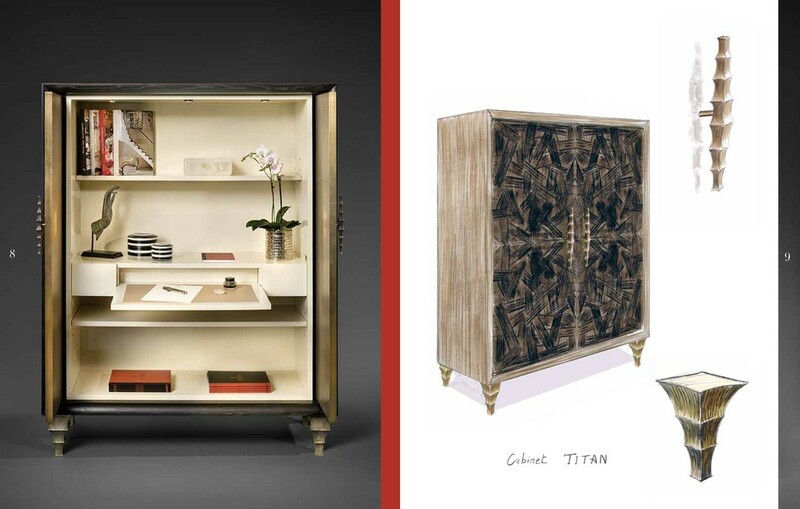 Sculptured objects using precious materials and high-quality finishes, bringing to life the legend according to which Vulcan instilled his works with a magical power. 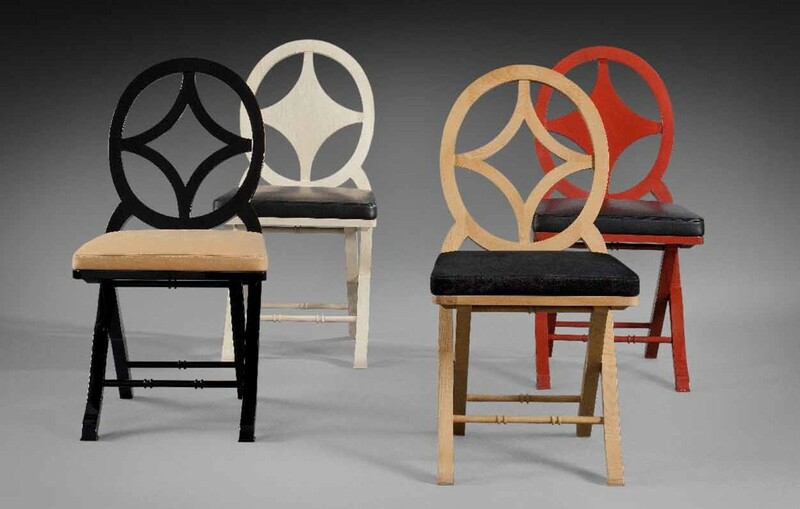 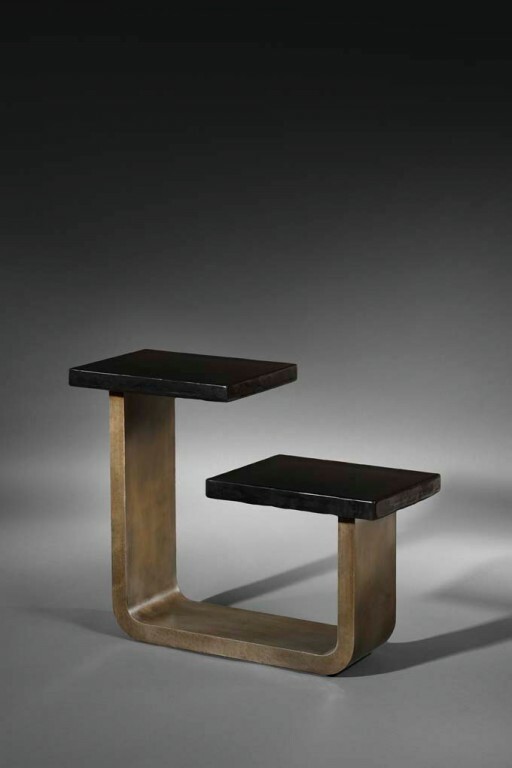 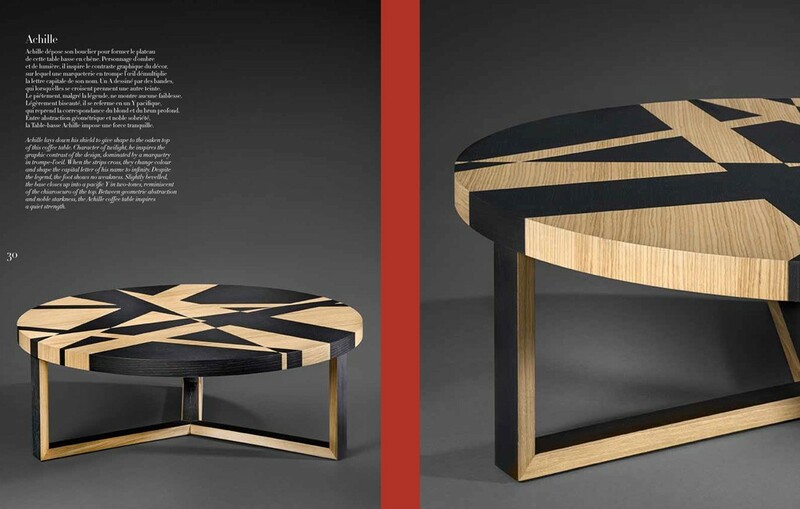 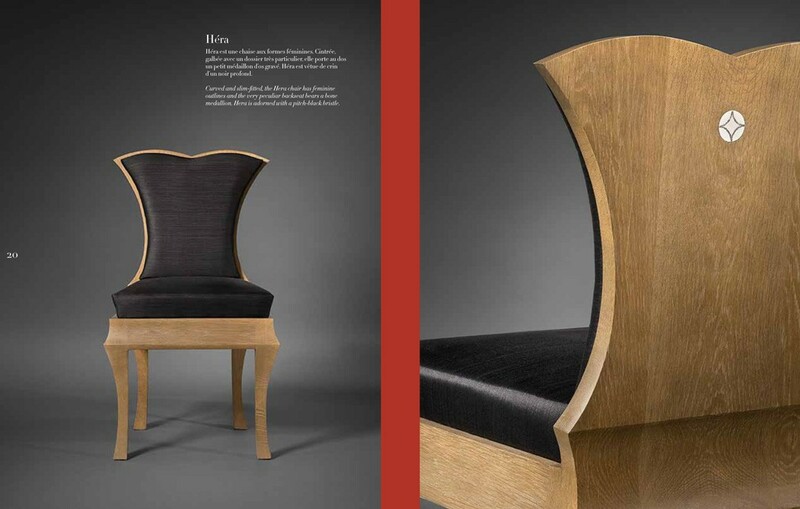 In 2010, Alberto Pinto produced his first furniture collection. 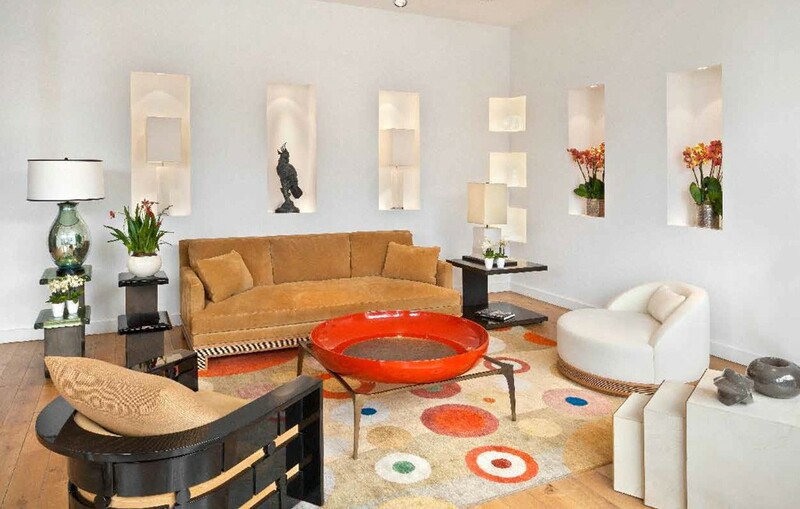 Until now, his creations were strictly reserved for the agency’s interior design projects. 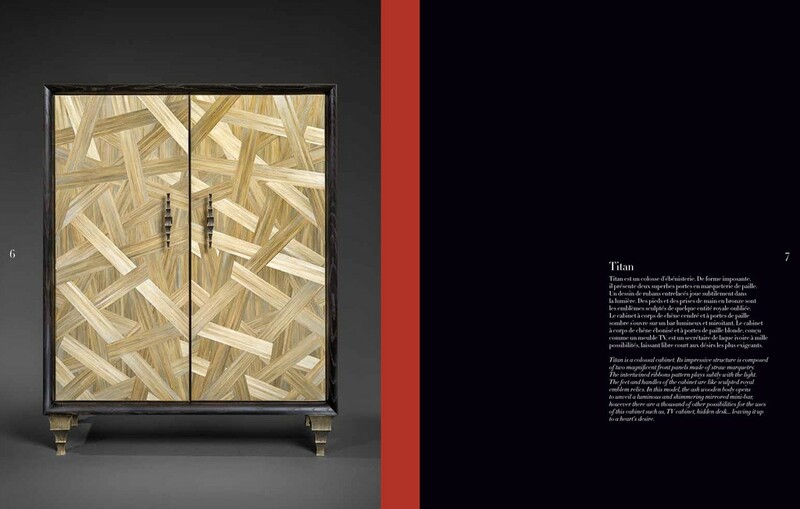 This collection, named “Rio”, is thus a genuine event, one which turns a signature into a brand. 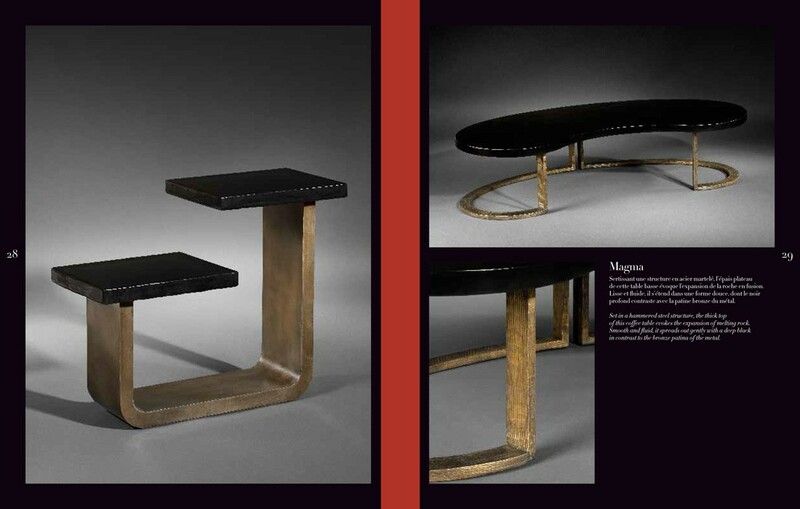 It catalyses the Alberto Pinto spirit, combining and embodying the savoir-faire of French métiers d’art, the taste for beautiful materials and colour, the juxtaposition of precious techniques, in a design that unites rigour and generosity. 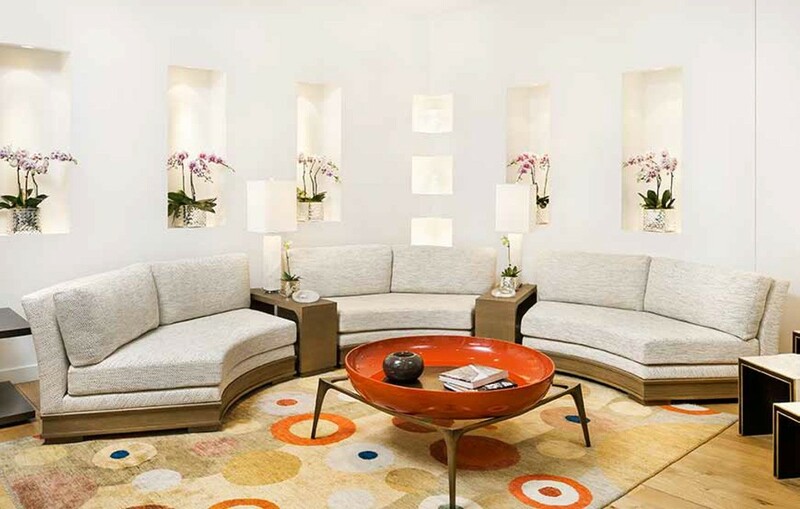 Comfort is king in this vision of luxury to be lived every day.